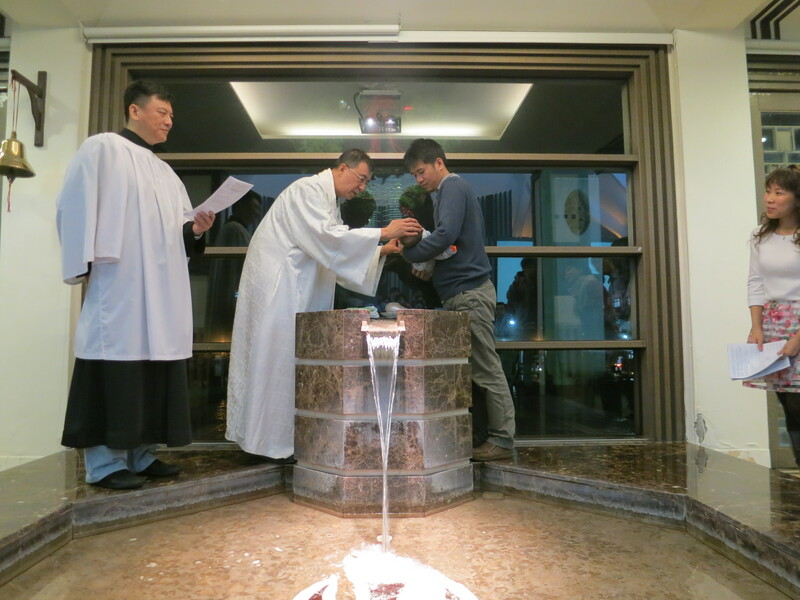 Baptism Day @ Advent Church! 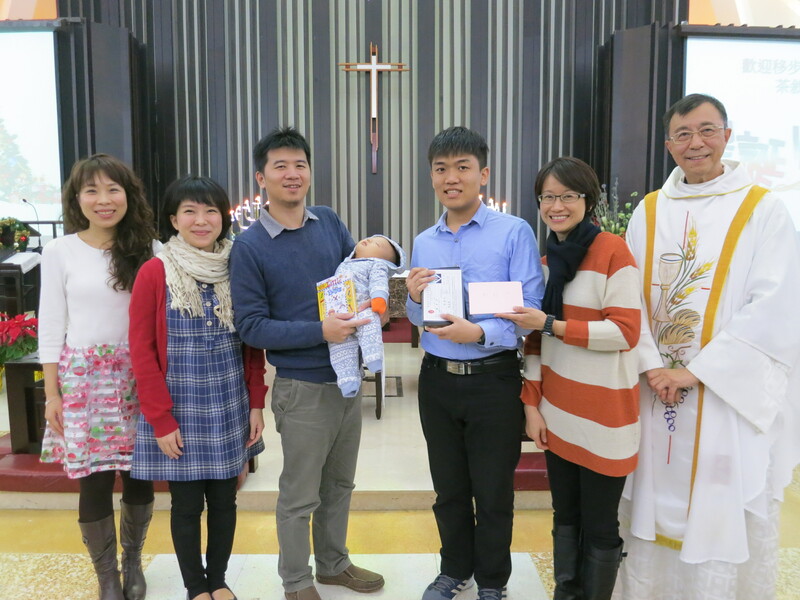 Baby Jacob, Chinese name: 牧霖 Mu-Lin, was baptized today at Advent Church, on his first outing to the church since his birth 2 months ago ~ and he slept the whole time he was with us! 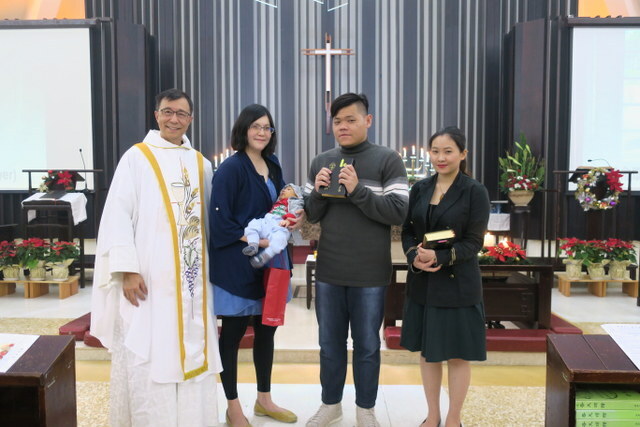 His father and mother are so delightful ~ praying for this lovely family and the grandparents who were there too ~ they speak Chinese, Taiwanese, English and Tagalog between them, so hopefully baby Jacob will grow up to be multi-lingual! 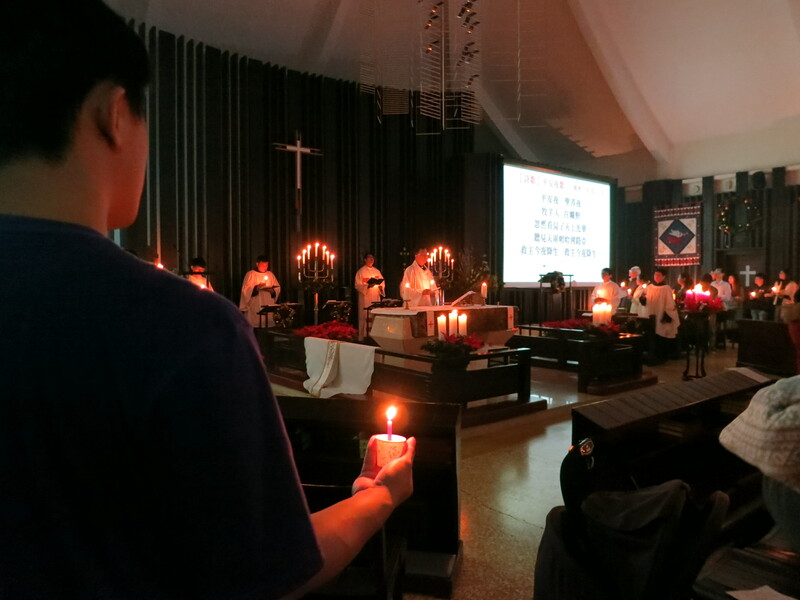 Merry Christmas 2016 @ St. John’s University and Advent Church! 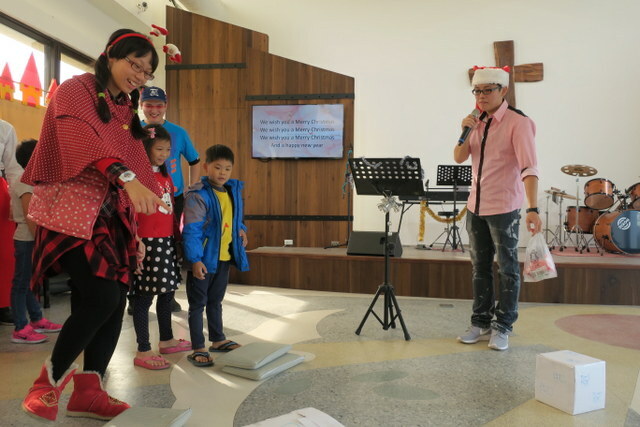 St. John’s University and Advent Church is THE place to be for Christmas, and especially when Christmas falls on a weekend ~ last week we had a whole week of Christmas activities in the university and local community, and now we’ve just had a whole weekend of activities in the church. 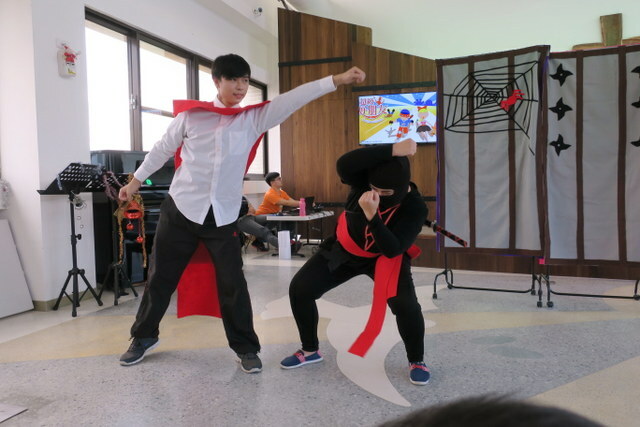 It’s all non-stop action ~ and it’s back to work and classes tomorrow as usual! 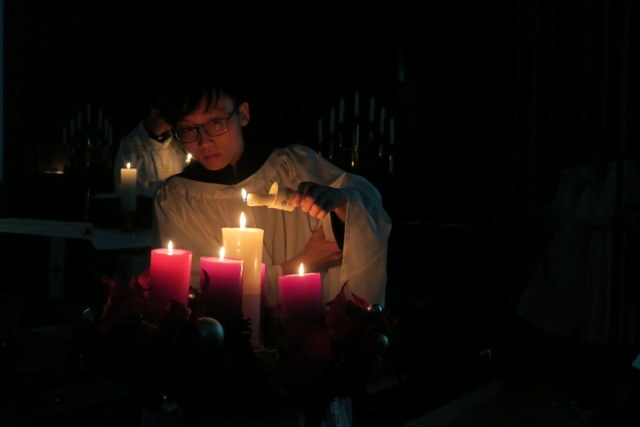 We really kind of moved from Advent into Christmas starting on Thursday December 22 in the afternoon when we did our final walkabout around St. John’s University, lighting all the candles on the Advent Wreaths in each office, singing a verse of Silent Night, distributing Christmas cake and wishing everyone a Merry Christmas. 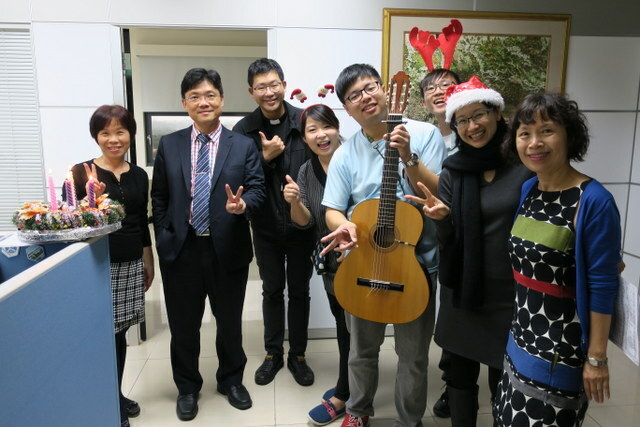 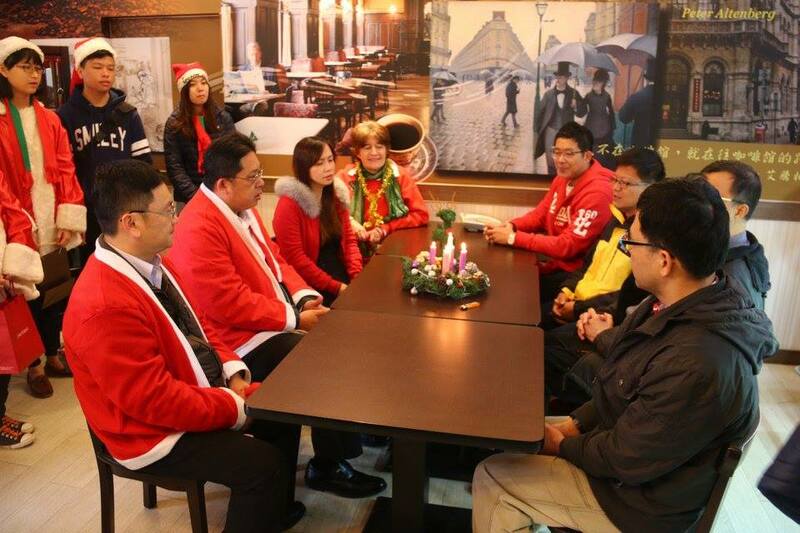 Here we are at the office of our SJU President Peter Herchang Ay – wishing him a Merry Christmas! 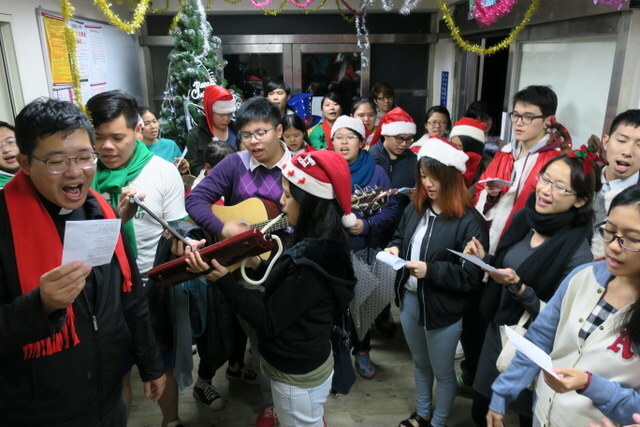 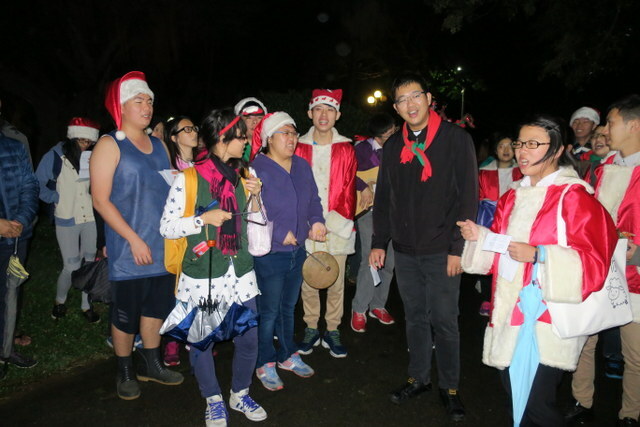 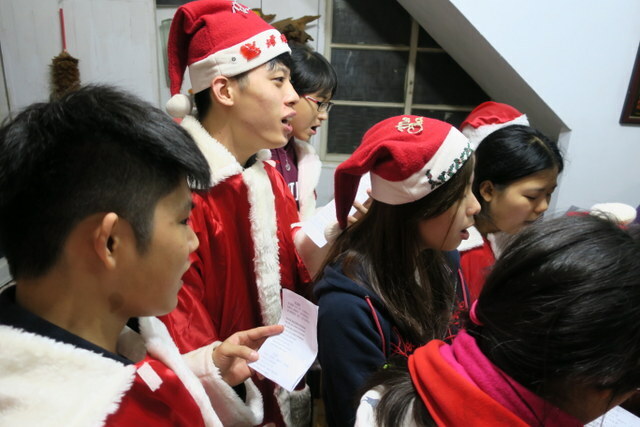 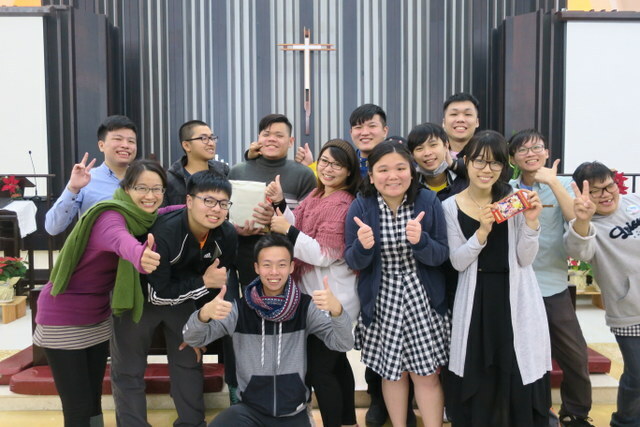 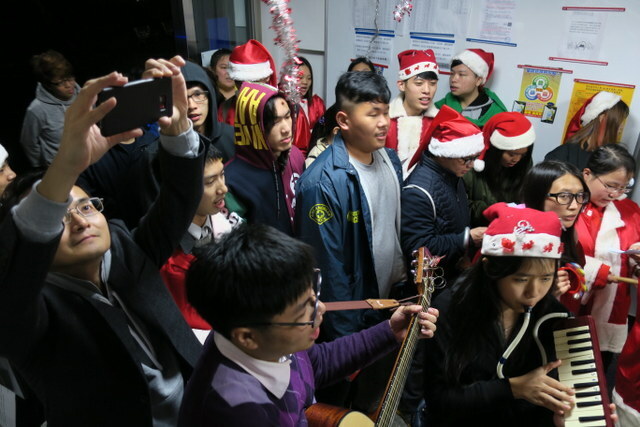 Then on Thursday evening, a huge number of our student fellowship group and lots of their friends dressed up in suitable Christmas attire and off we went around the university campus wishing everyone a Merry Christmas, and singing and praying for the students in each dormitory. 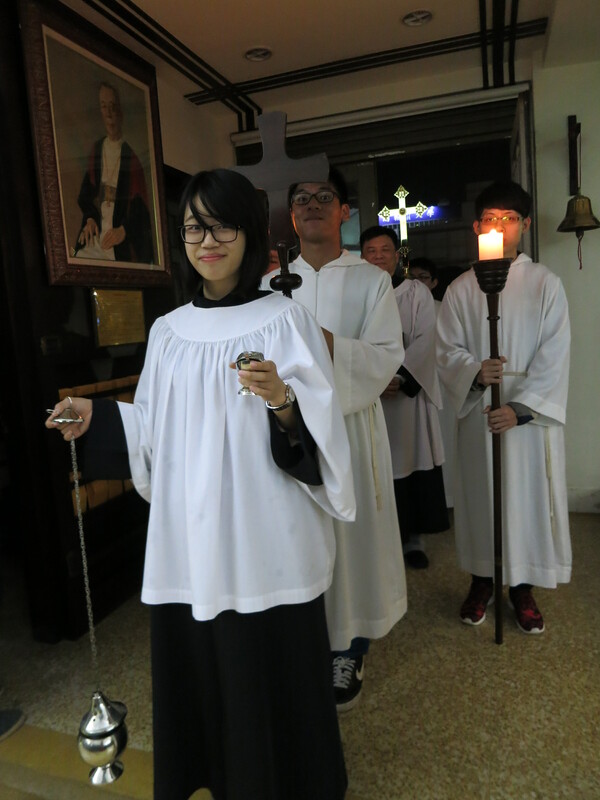 We chose Thursday night as many of our students go home for the weekends, so Thursday was the night! 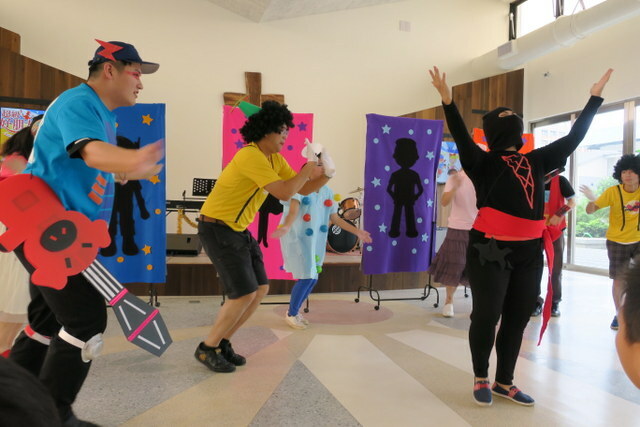 Despite gloriously hot and sunny weather all the rest of the week, Thursday was the day it rained ~ but we still had a great time! 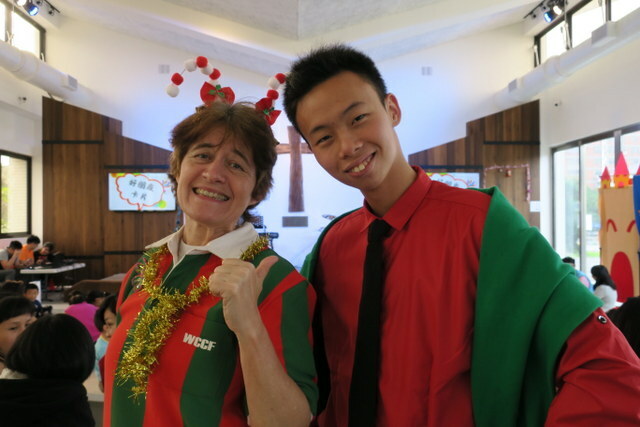 Our first port of call was to Ms. Lu, our church member, former church cleaner and next-door neighbour to the campus ~ she invited us in and we had a great welcome! 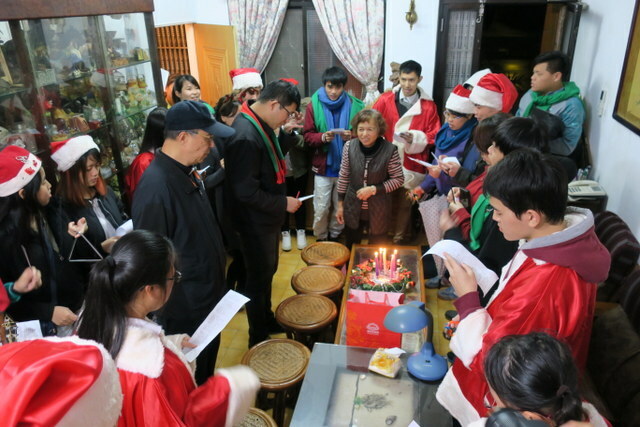 Then off to visit the 5 dormitories ~ and by 8:30 pm we were back at Advent Church to collect up our church members who were just finishing their drum class, and off we went to the university home of SJU President Ay, who welcomed us so warmly ~ we lit the candles on the Advent Wreath, sang some carols and enjoyed delicious tang-yuan, customary fare at the midwinter solstice. 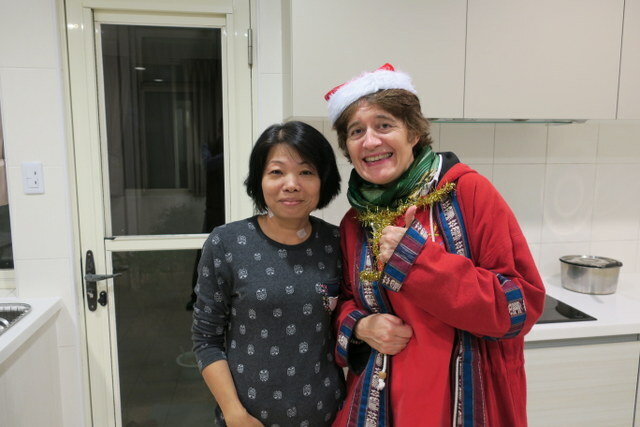 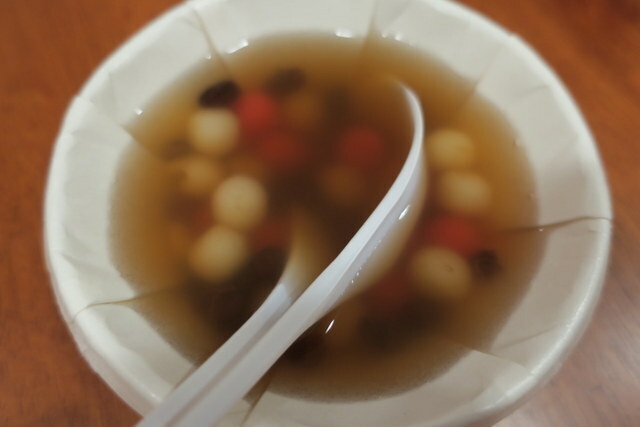 The tang-yuan was made by one of the lovely ladies who works in the university, and turns out to be one of my neighbours here, hence the photo of the 2 of us below! 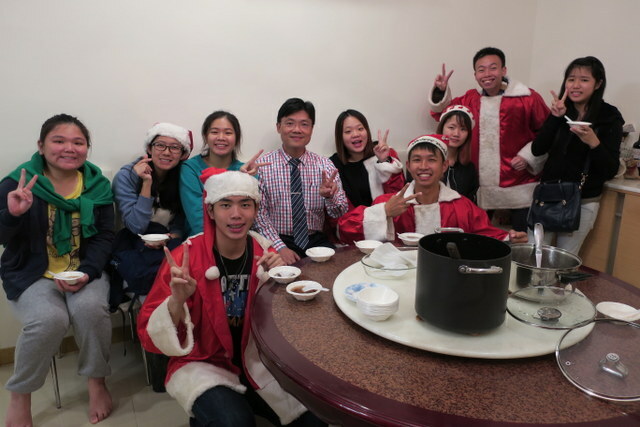 Oh yes, and a special photo of President Ay with all the Malaysians in our student fellowship, eating tang-yuan together…. 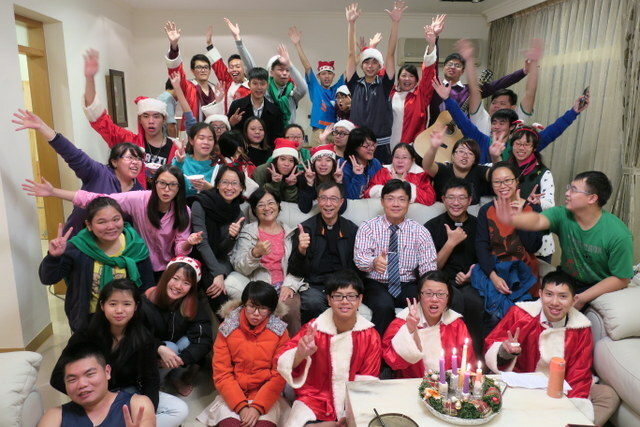 And a group photo of us all at President Ay’s home…. 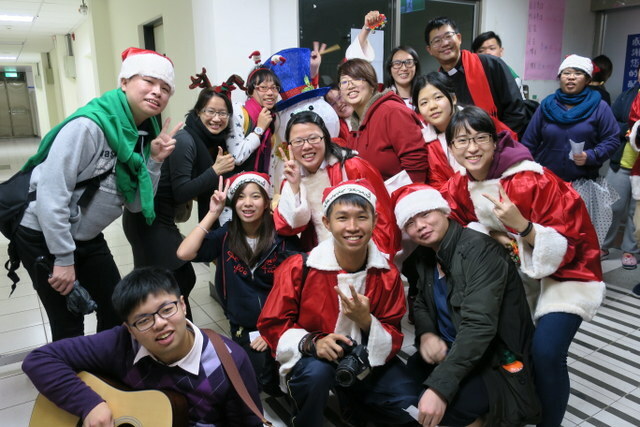 Back home at 10:00 pm and up early on Friday to get to Advent Church by 7:30 am where we gathered for our Christmas visit to our neighboring junior-high school branch, where the school principal, head of the parents association, the school branch supervisor and our good friend, Jasmine, and all the children and staff were waiting for us. 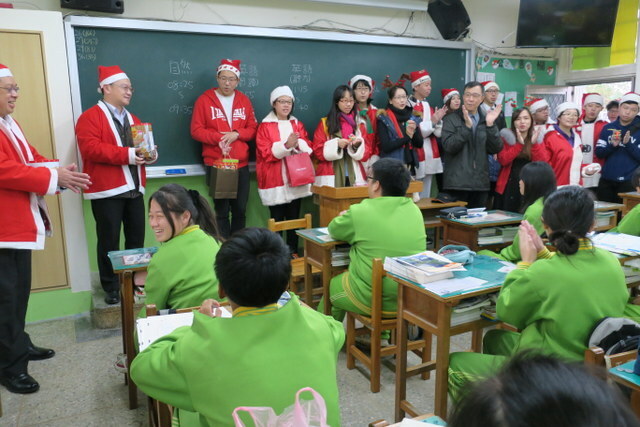 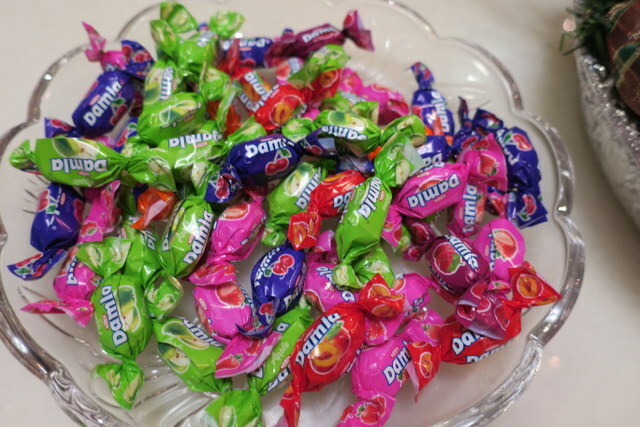 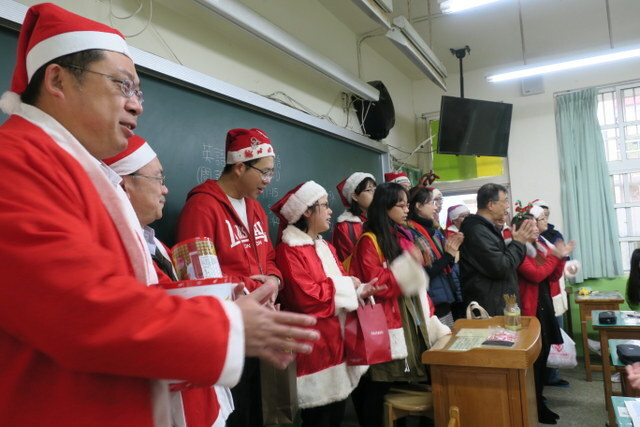 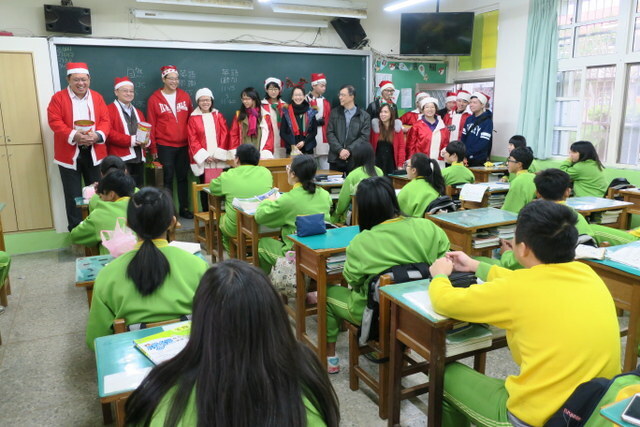 We started in the ninth grade class, the oldest children, who that day were taking important exams ~ so we sang and wished them Merry Christmas and distributed sweets…. 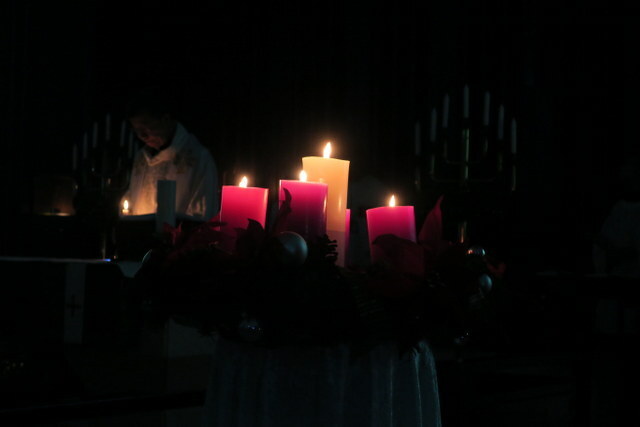 then off to the school coffee bar for lighting the Advent Wreath candles and singing Silent Night. 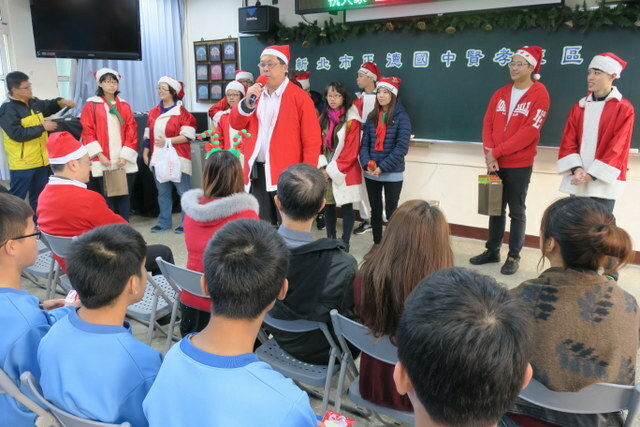 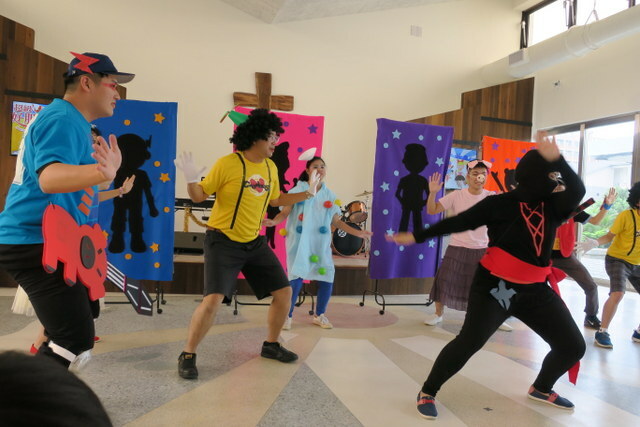 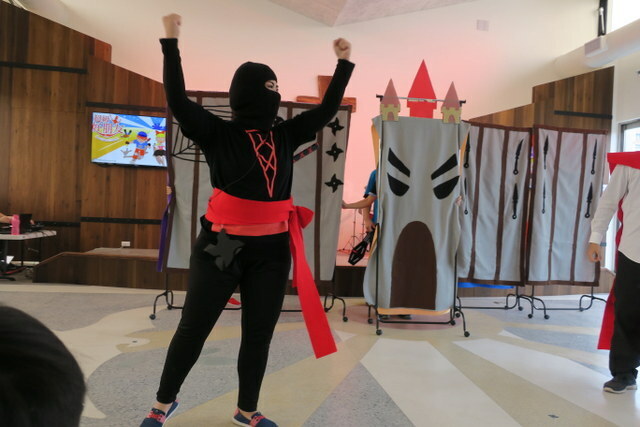 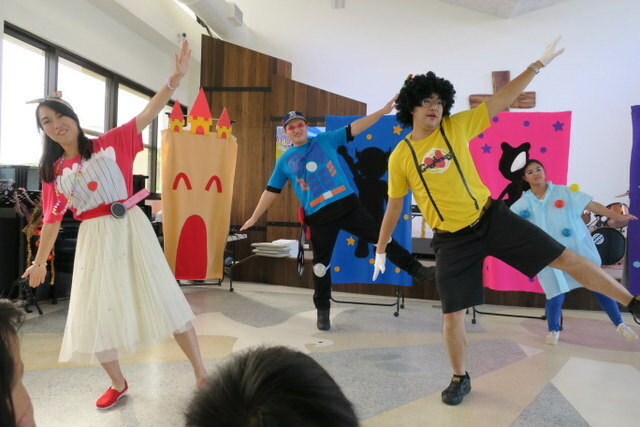 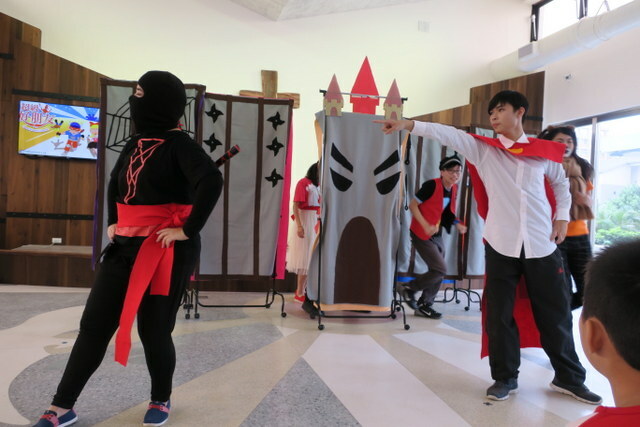 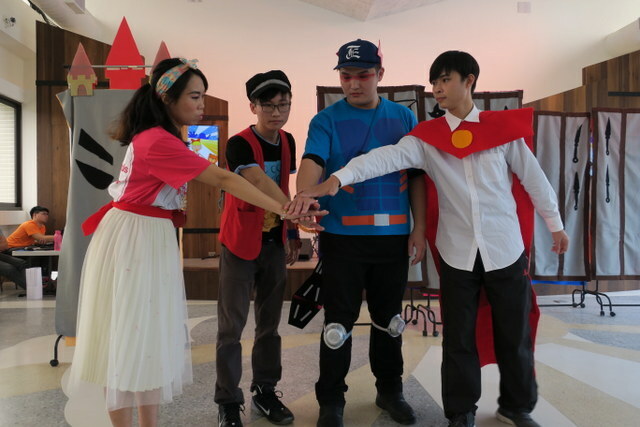 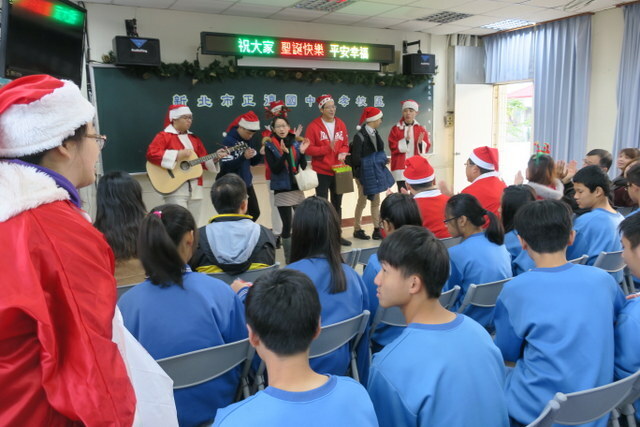 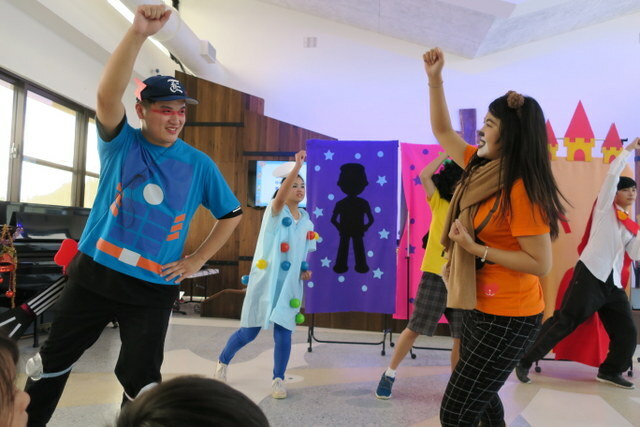 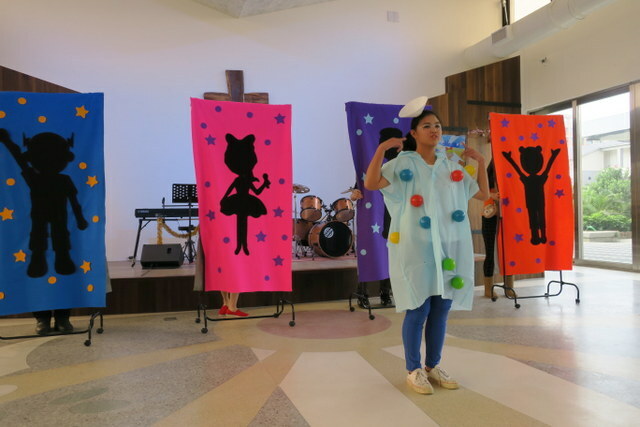 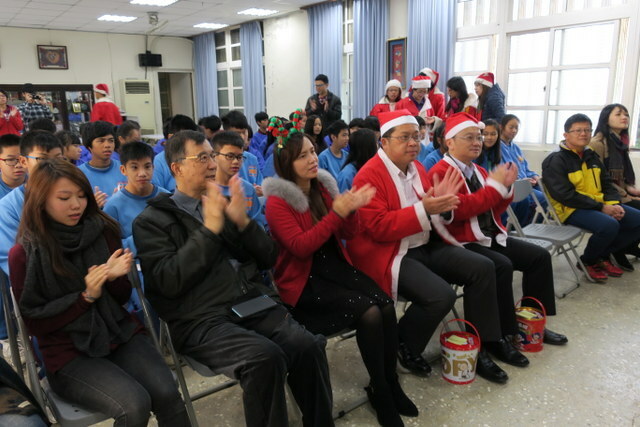 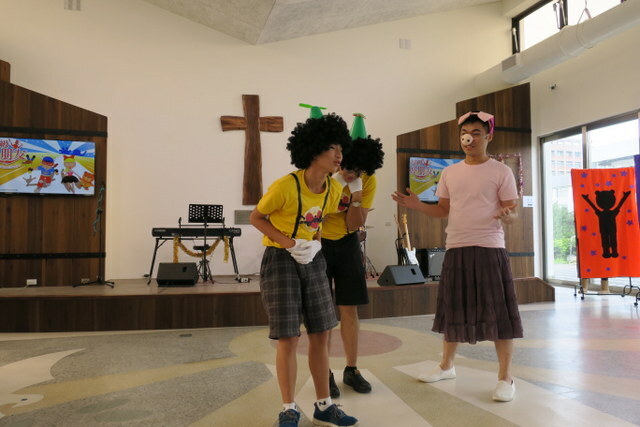 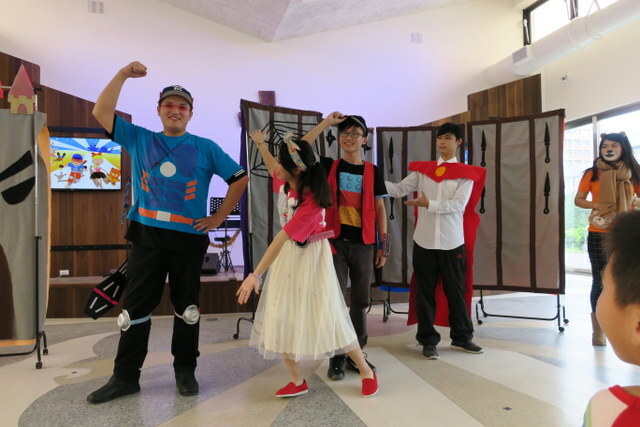 Then at 9:00 am, our student team put on a performance of our Christmas Show, 超級好朋友 Supermaster and his Superfriends, for all the children in 7th and 8th grades…. 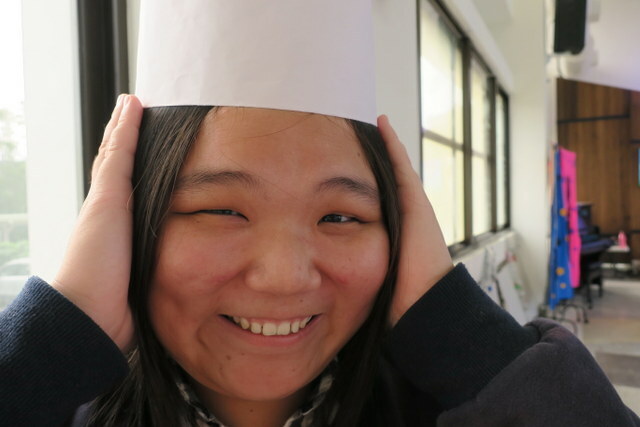 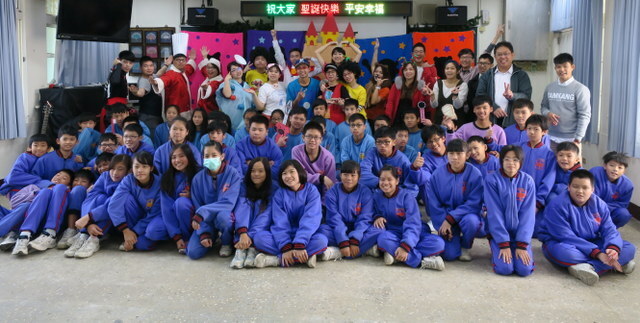 Ah, such a friendly school, such caring teachers and staff, and great kids ~ such a fun morning! 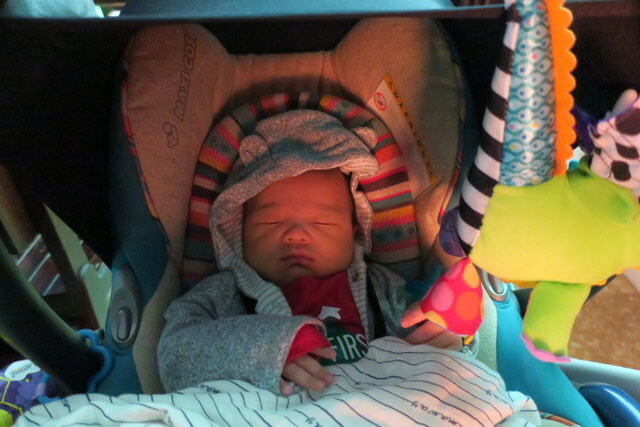 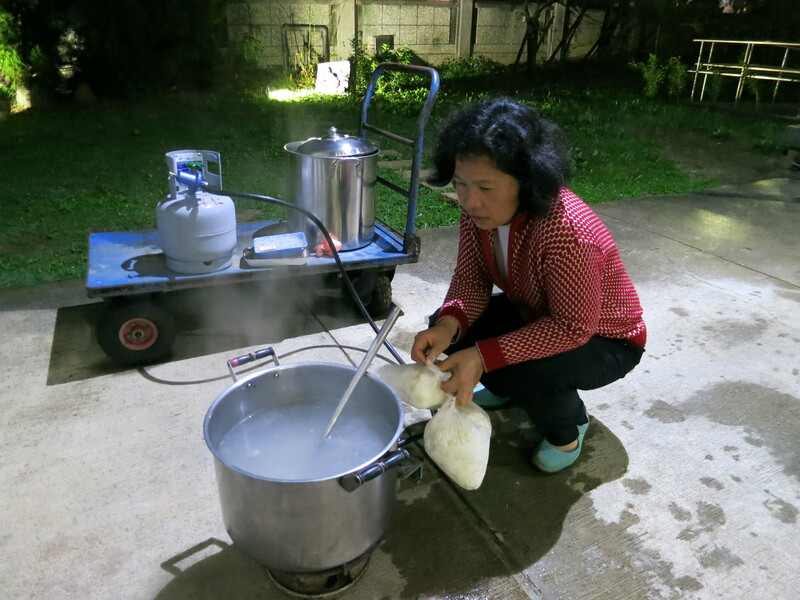 And what is amazing is it turned out that the parents of the lady who owns the restaurant are my next-door neighbours…. 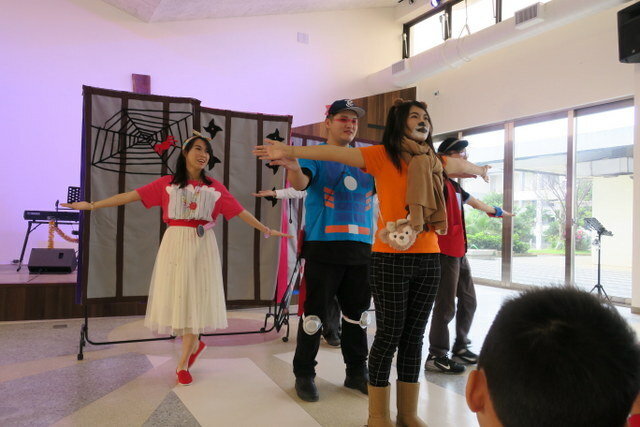 ah, it’s a small world! 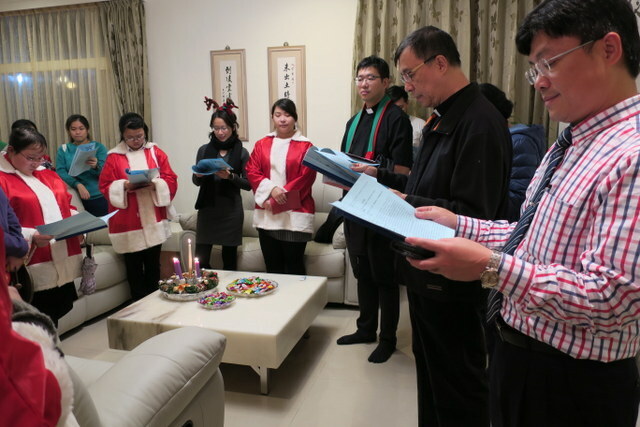 On Friday evening, I hosted an Advent Church gathering and also invited our community English class to my house for a short Advent service to light the Advent Wreath, sing and pray together, followed by a few refreshments. 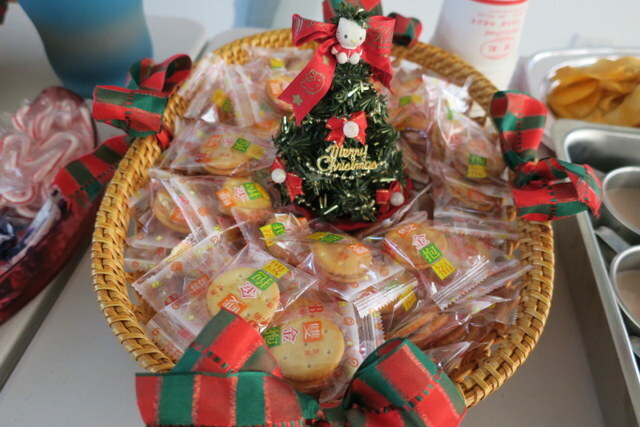 I was very honored that Tan Mama and Tan Baba both came, with their son and daughter-in-law, who had kindly made the world’s most delicious Tiramisu for us, it was fantastic! 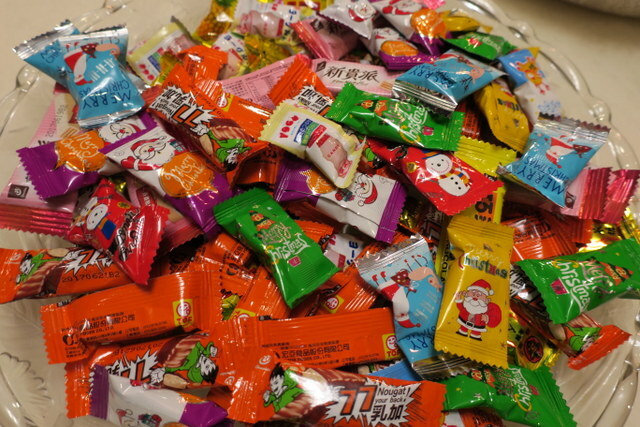 Sadly no photo of it cos it was all gone in record time! 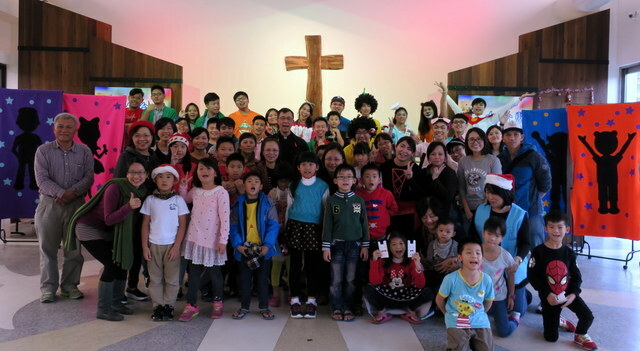 And so to Saturday, Christmas Eve, yesterday ~ and at 2:00 pm we had our Advent Church Christmas Party for local children…. 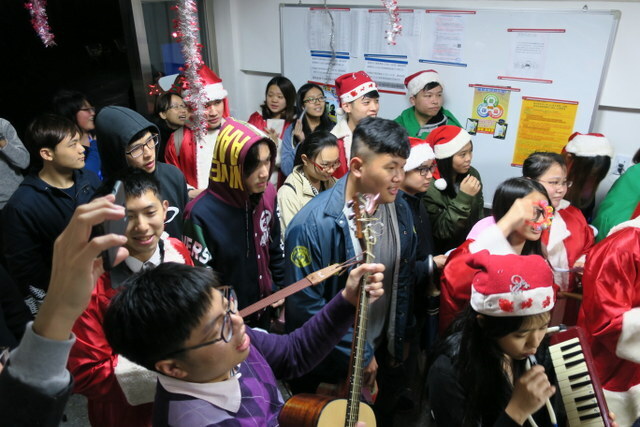 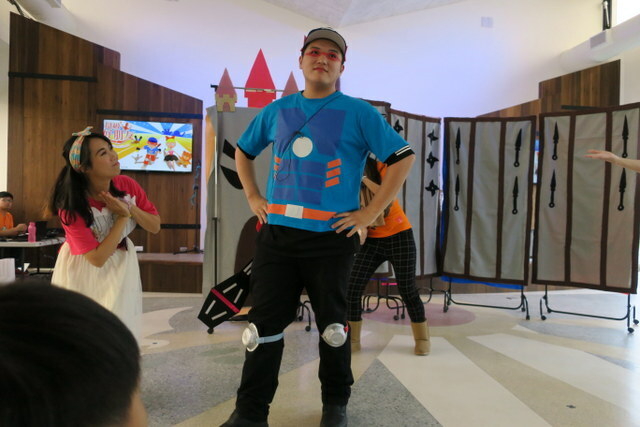 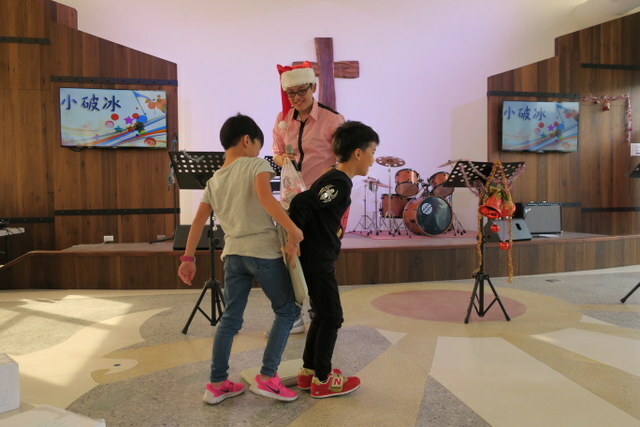 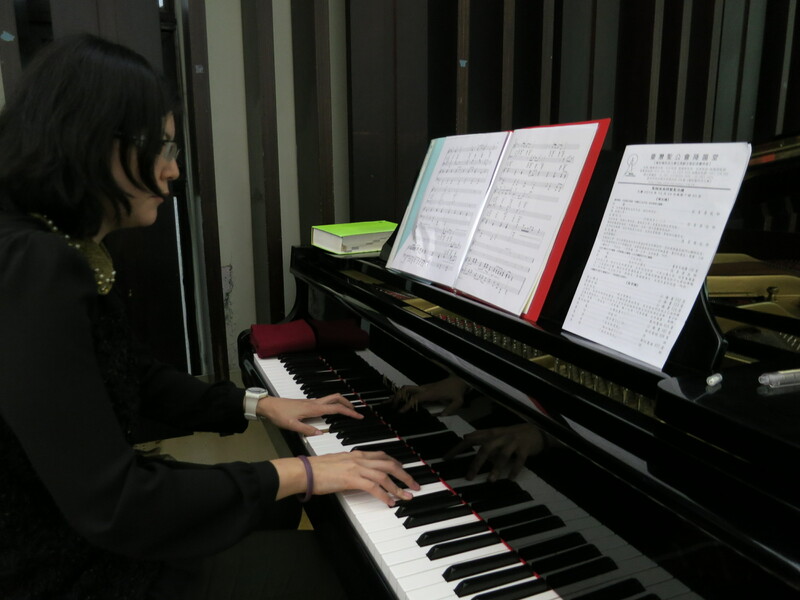 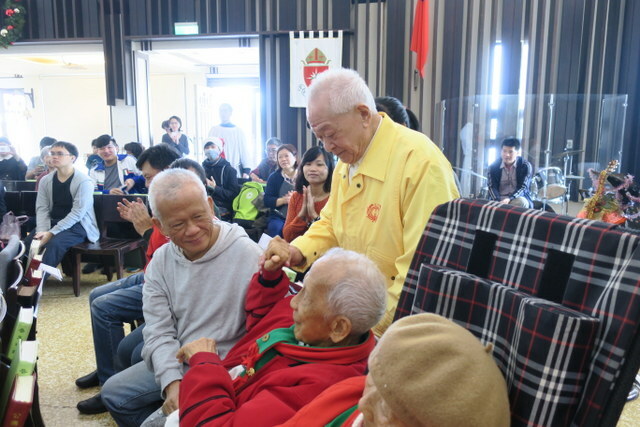 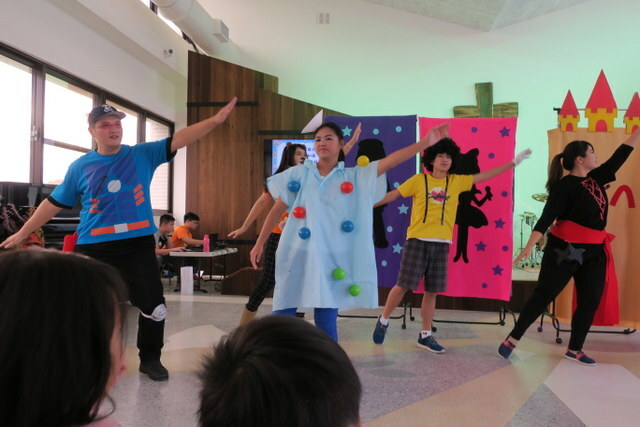 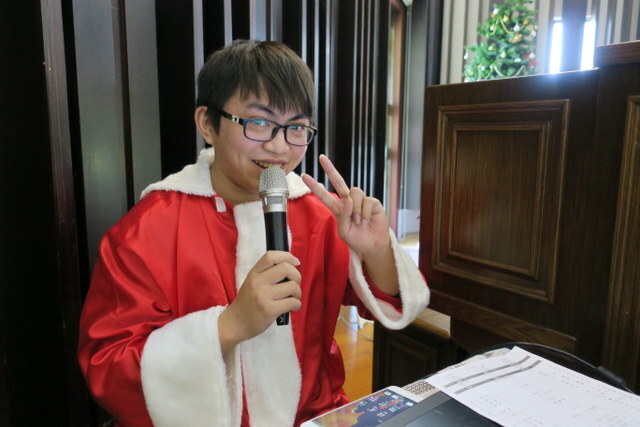 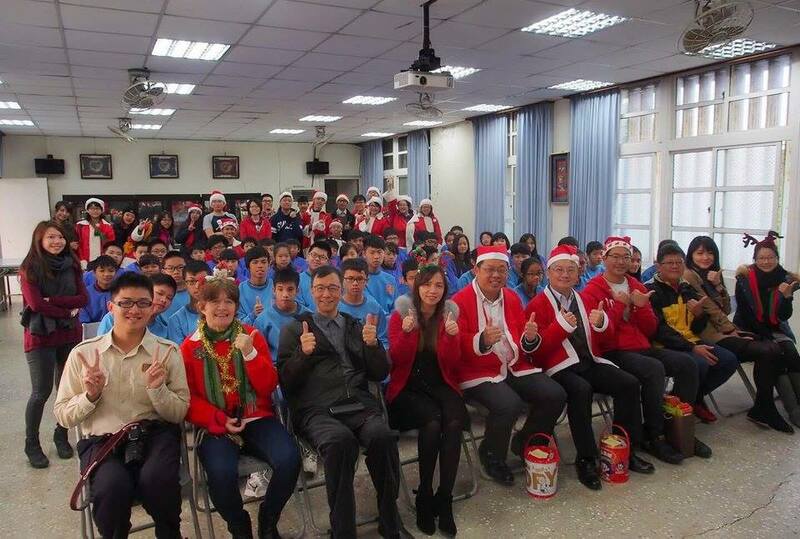 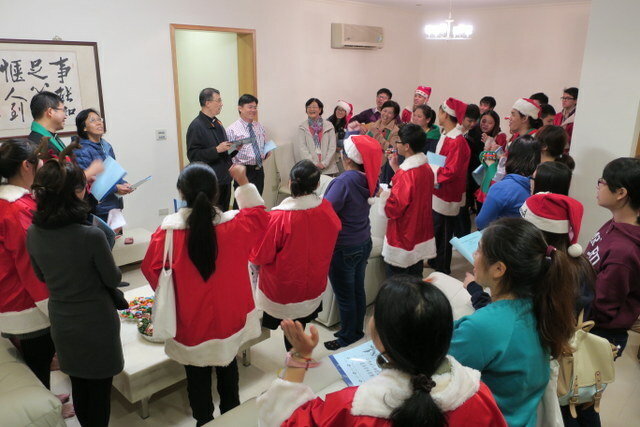 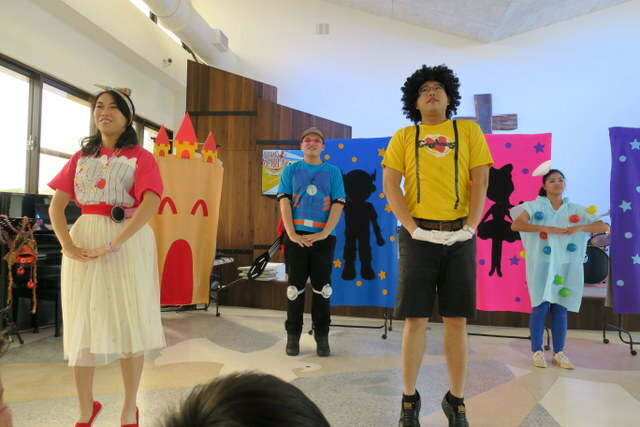 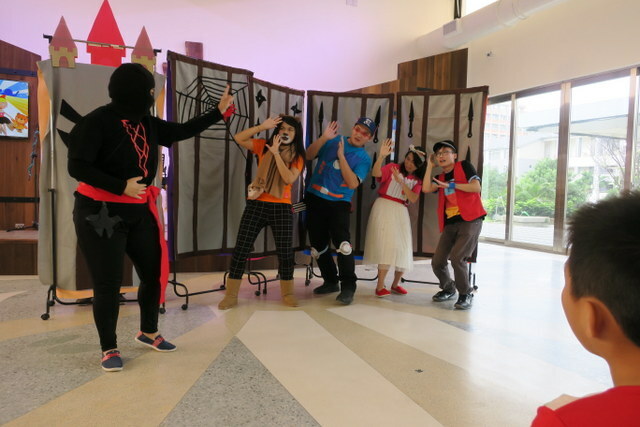 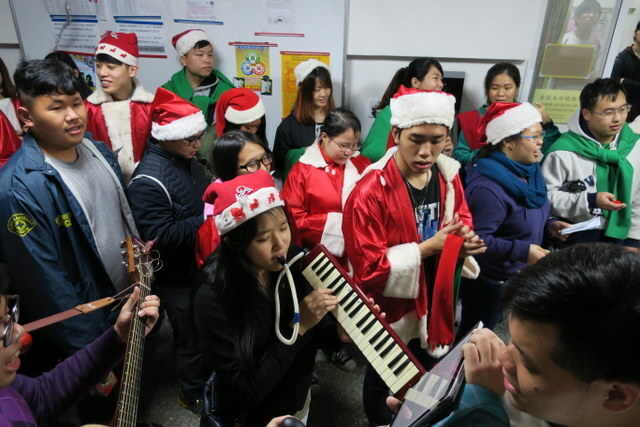 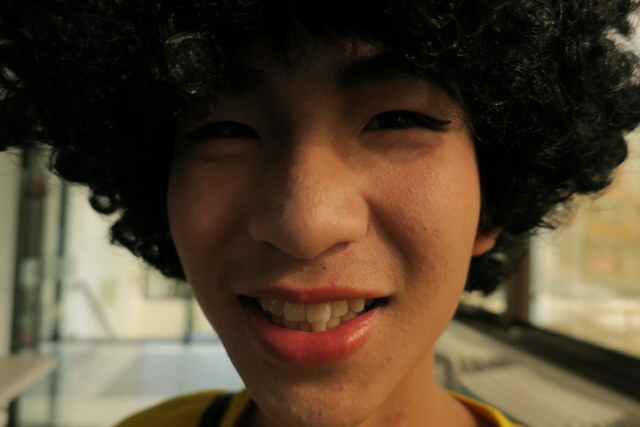 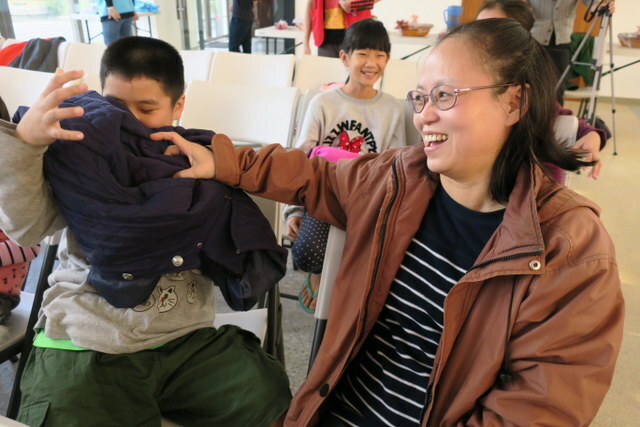 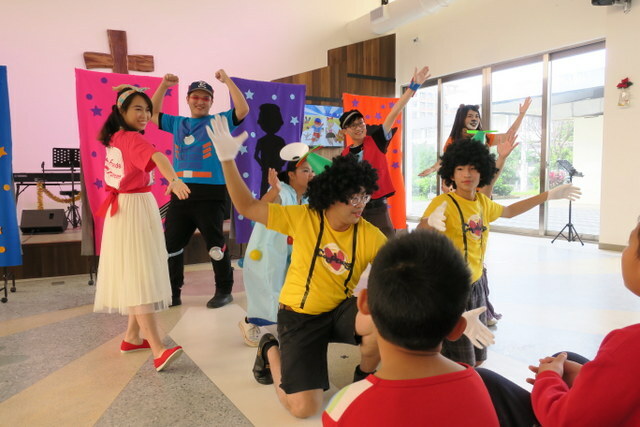 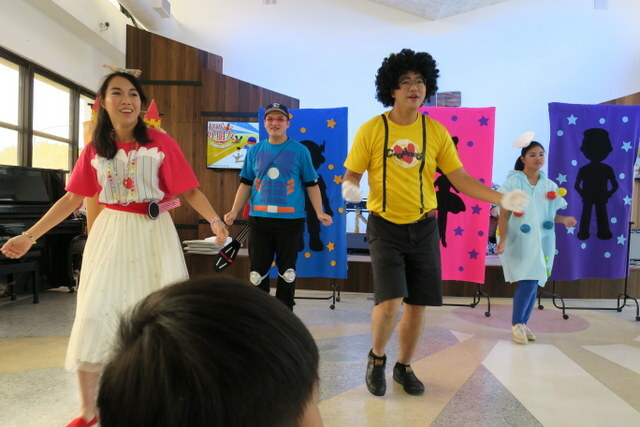 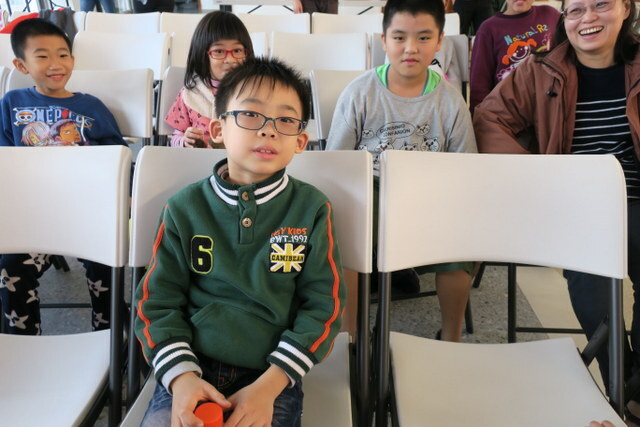 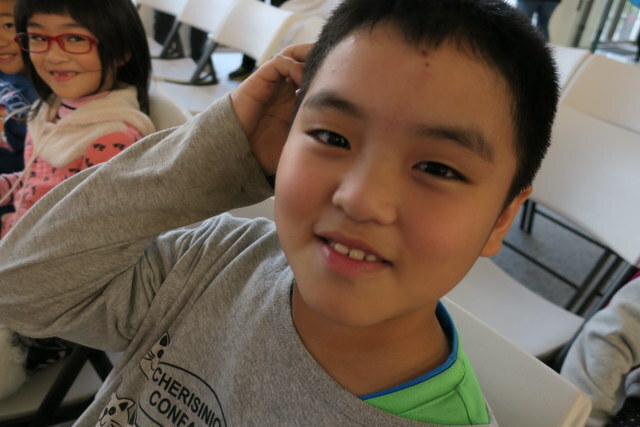 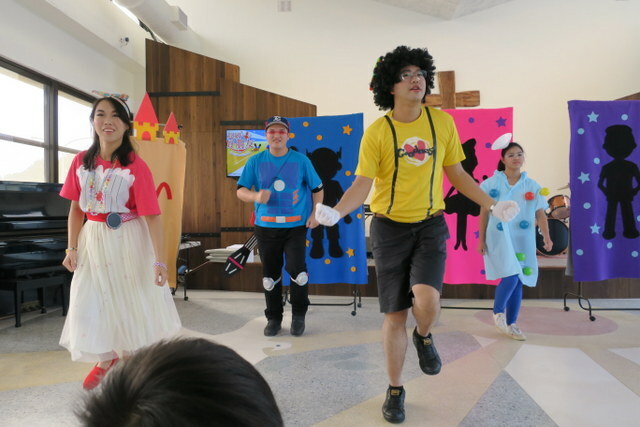 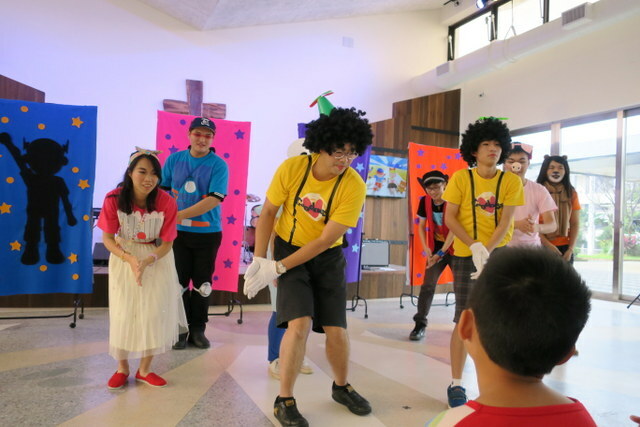 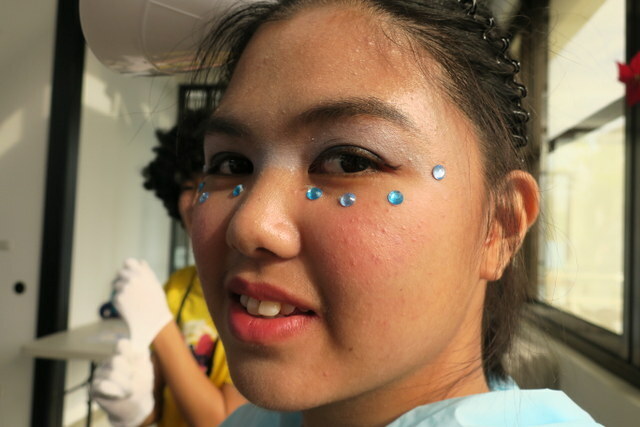 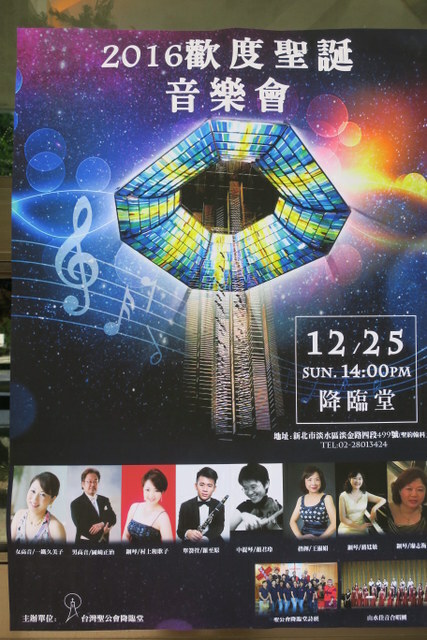 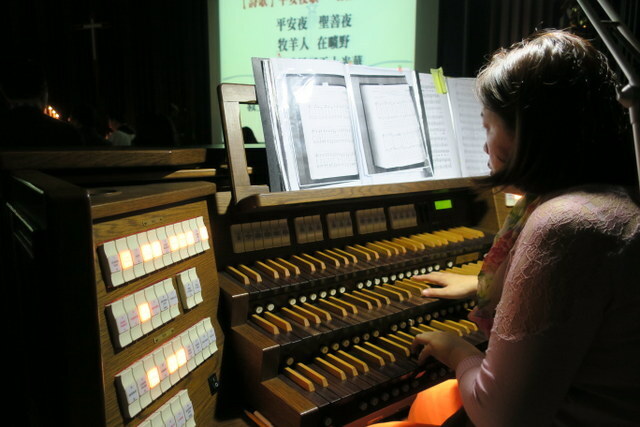 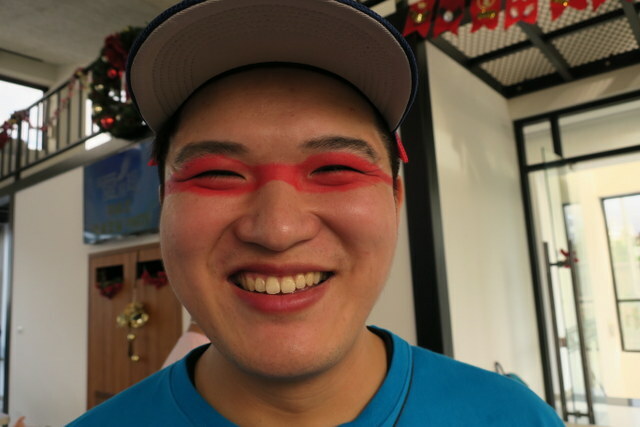 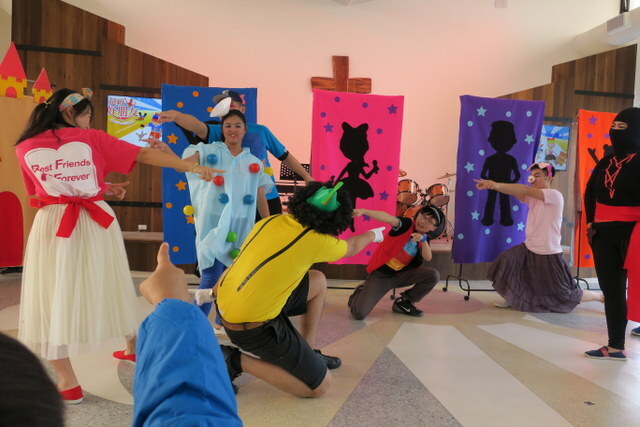 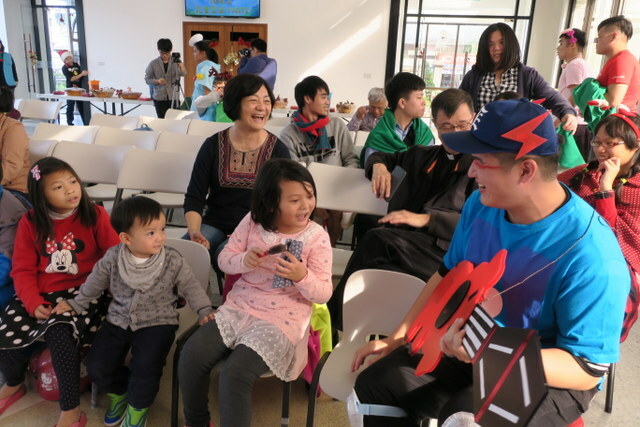 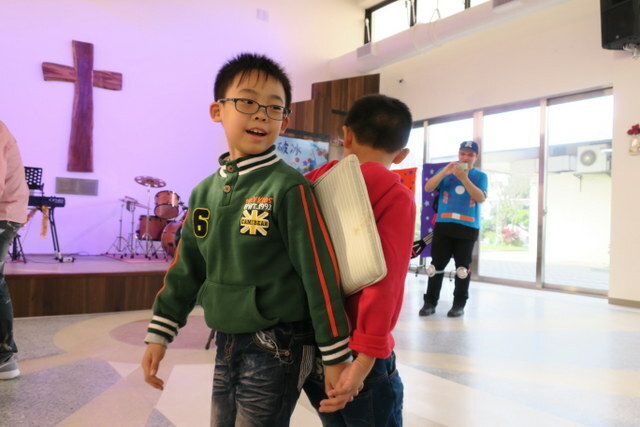 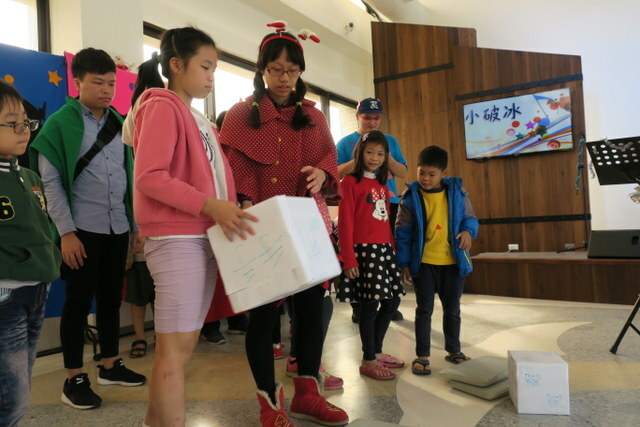 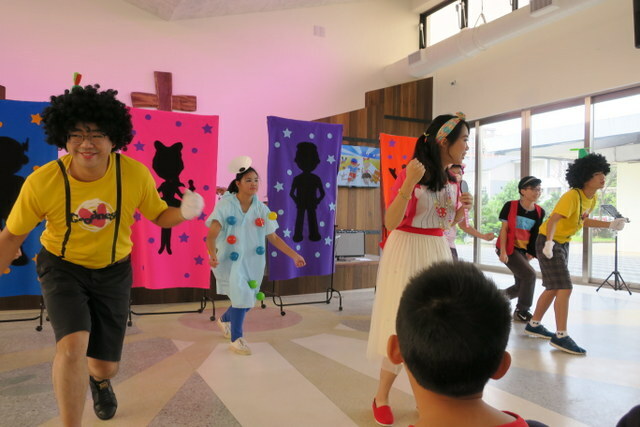 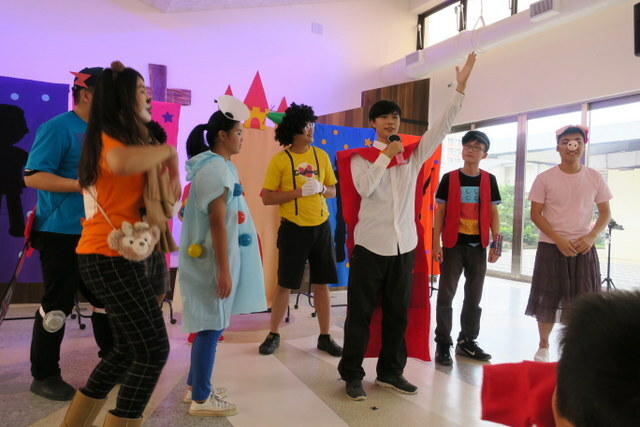 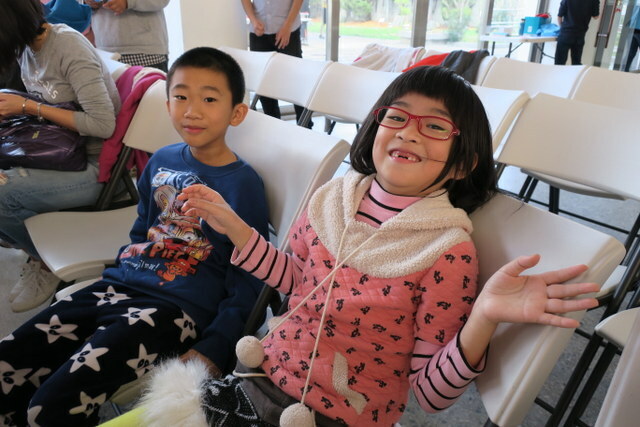 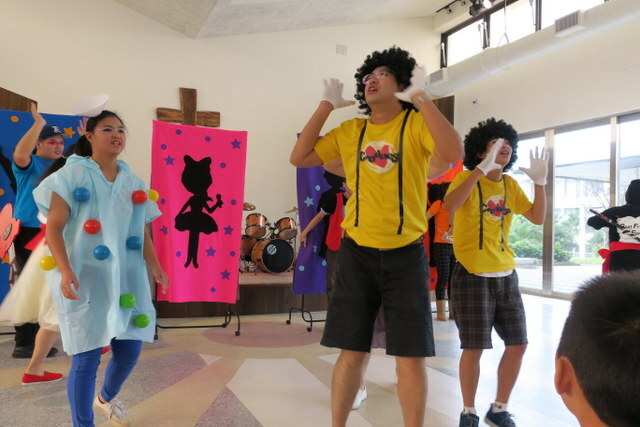 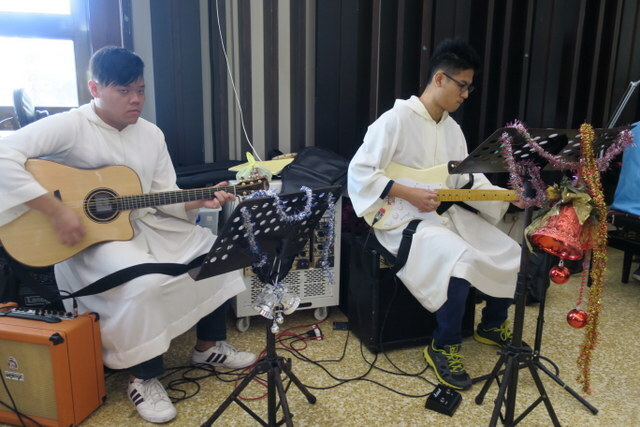 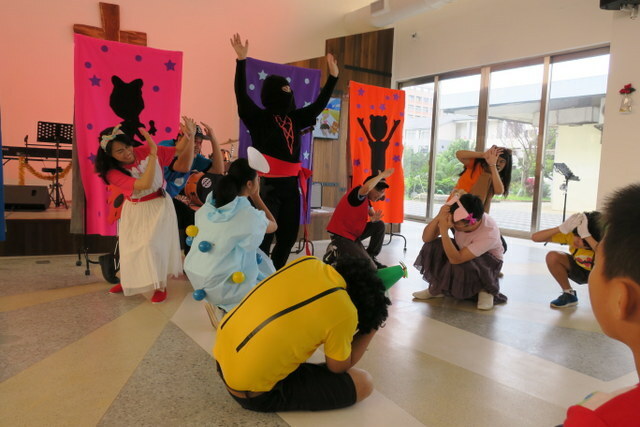 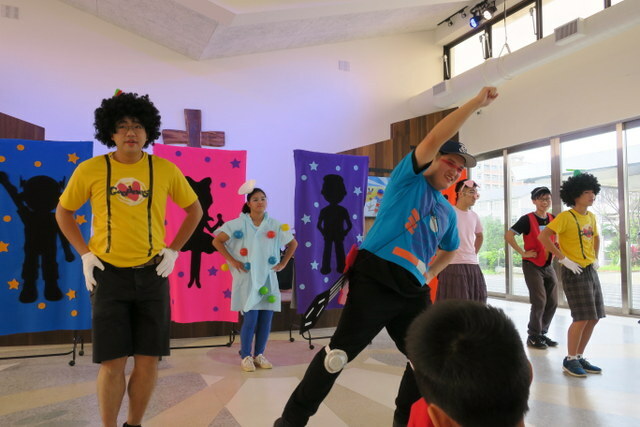 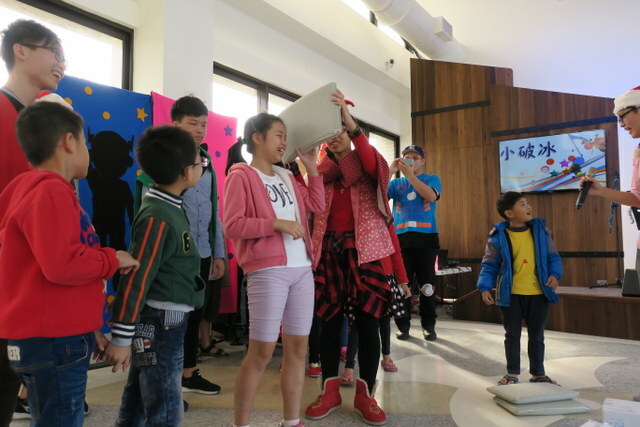 We had some games and songs, and then a performance of our Christmas Show, 超級好朋友 Supermaster and his Superfriends…. 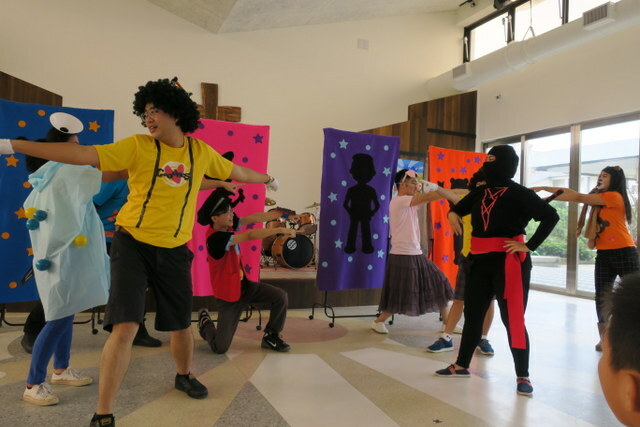 this acting team was mostly our church members, including our chaplain, Rev. 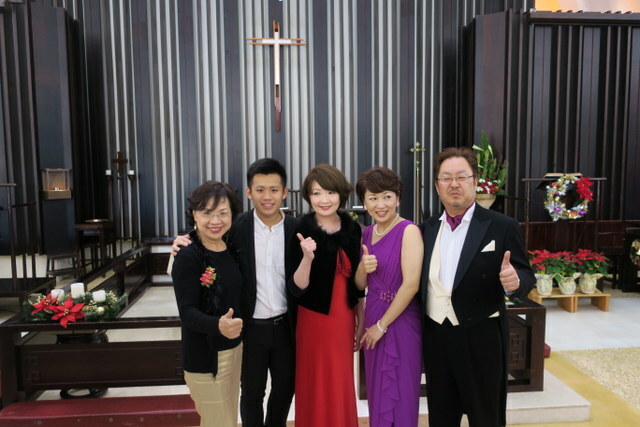 Wu and his wife ~ for many it was their first and only performance, so of course it was brill! 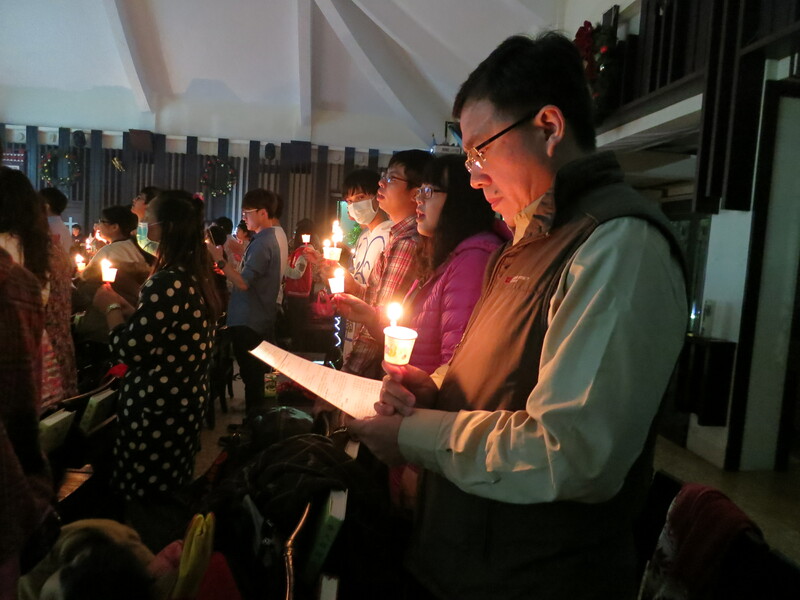 In case you’re wondering, I got a new shirt from the Tan family, and wore it on Christmas Eve, all green and red stripes, see above! 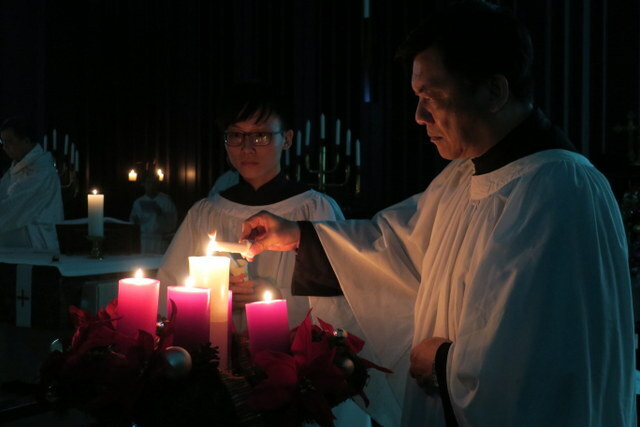 Our Christmas Eve service was held last night at 7:30 pm, starting out with only candles ~ beautiful! 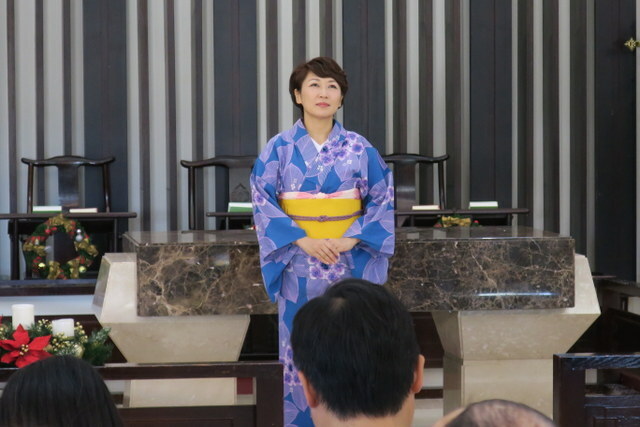 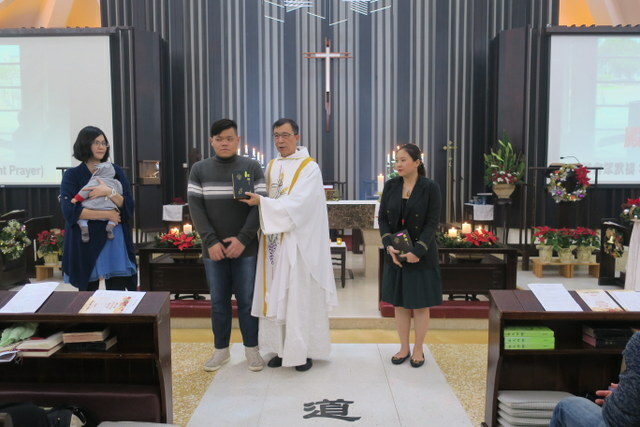 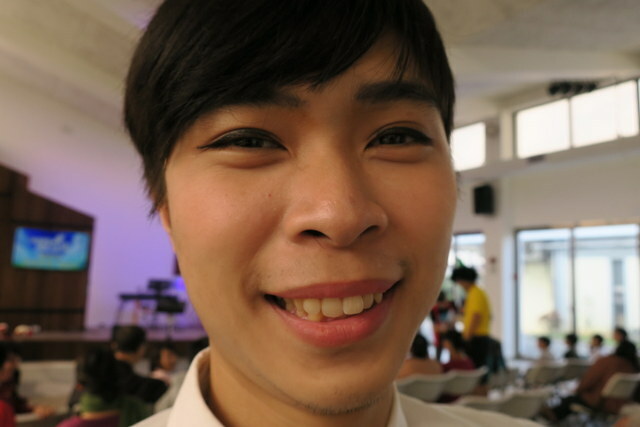 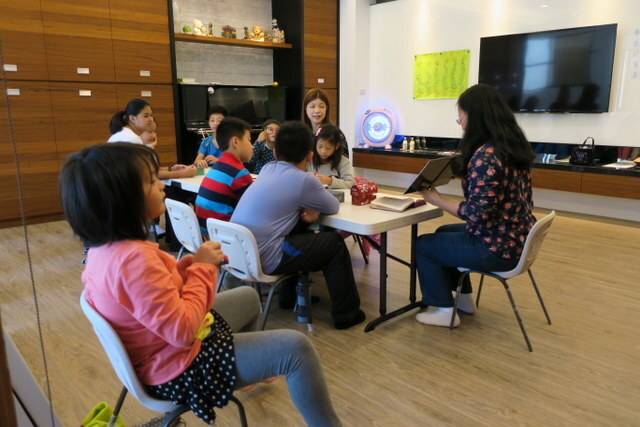 The service included 3 baptisms ~ a former student, now living in Singapore but who came home especially for her baptism, a graduate student who is in our fellowship group and is extremely popular (as you’ll see from the photos below!) 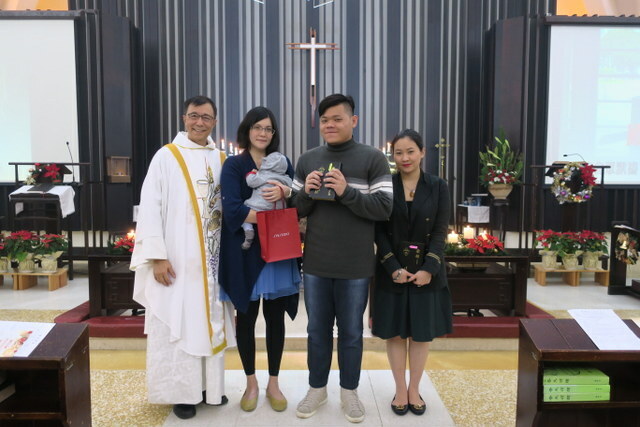 – so lots of former students also came back for the service, and a gorgeous baby – the baby is the 6-week old grandson of our rector, Rev. 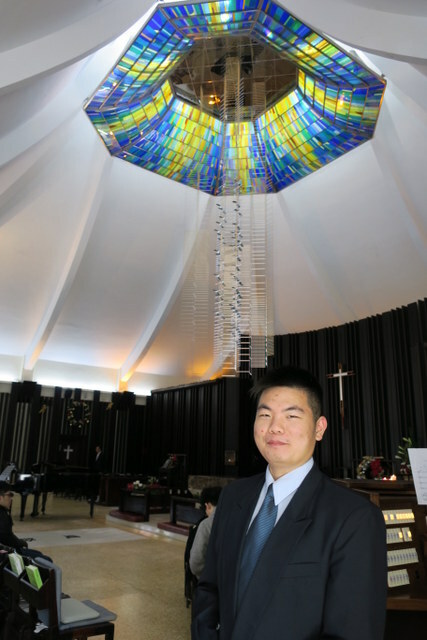 Lennon Y. R. Chang. 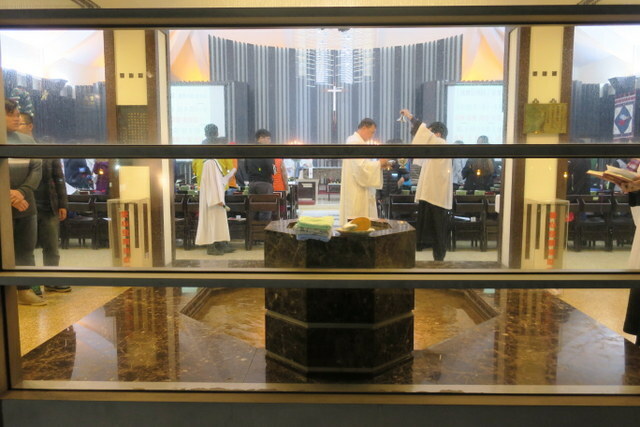 This time, I took the photos of the baptisms from outside the church. 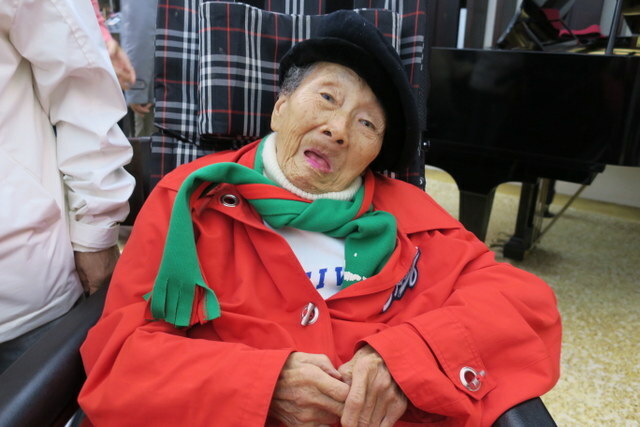 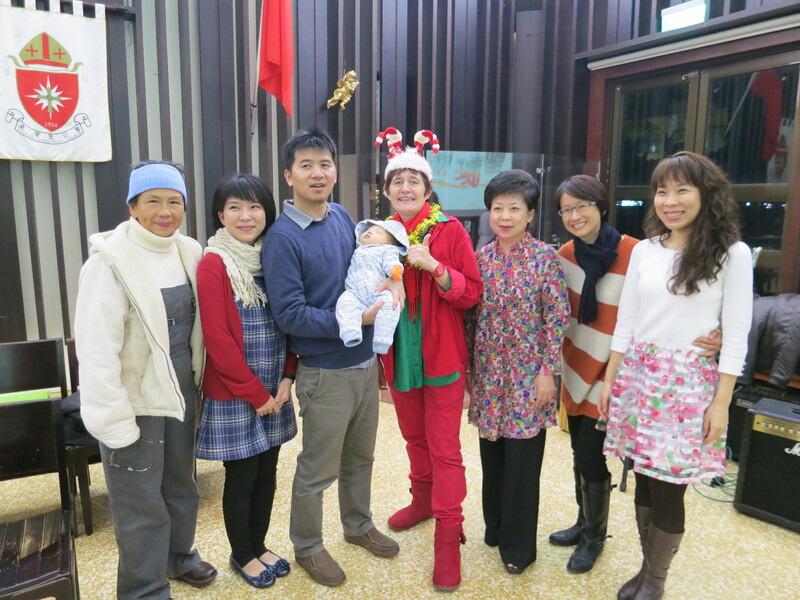 Tan Mama and Tan Baba were there too, dressed appropriately in red and green…. 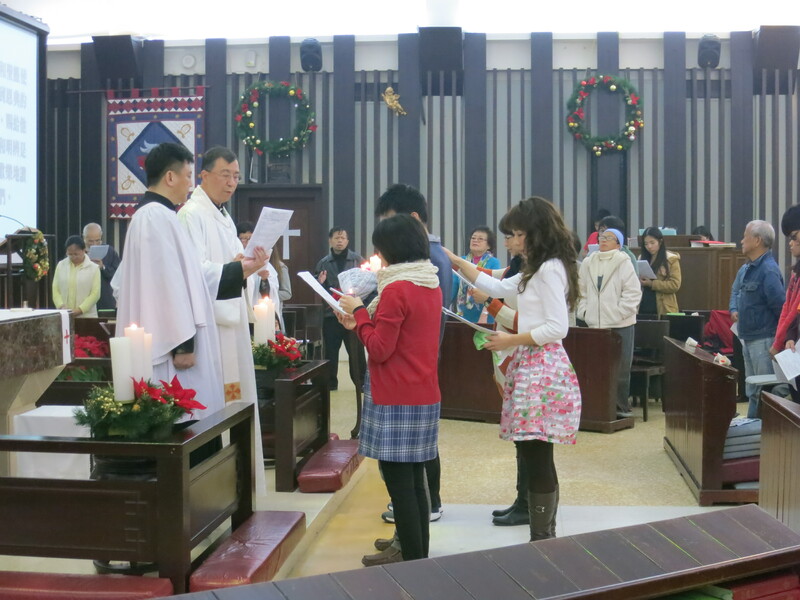 And so to Christmas Day morning, today, a beautifully sunny and warm day, and we were back at Advent Church for our Christmas Day service at 10:00 am, and because it’s near to St. John’s Day, we also used today as St. John’s University Student Fellowship Sunday, and all the readings, prayers, songs etc were led by our students, and offerings went to our chaplaincy student ministry. 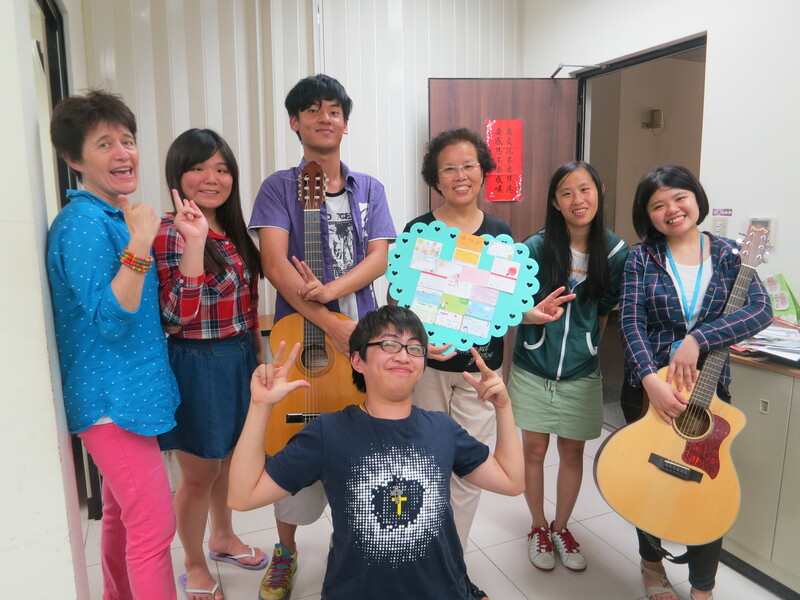 The student fellowship group have worked so hard these last few weeks and really cooperated well together, today too! 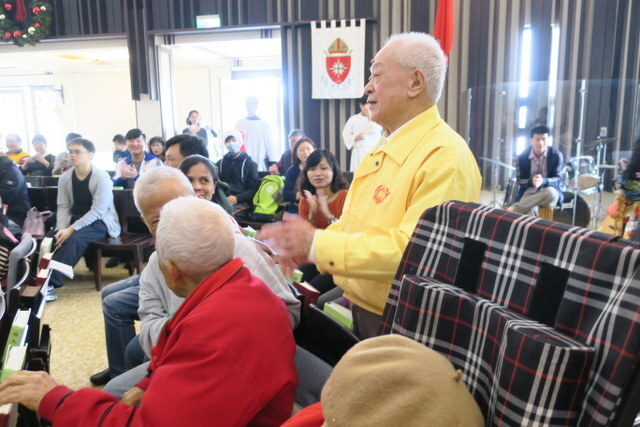 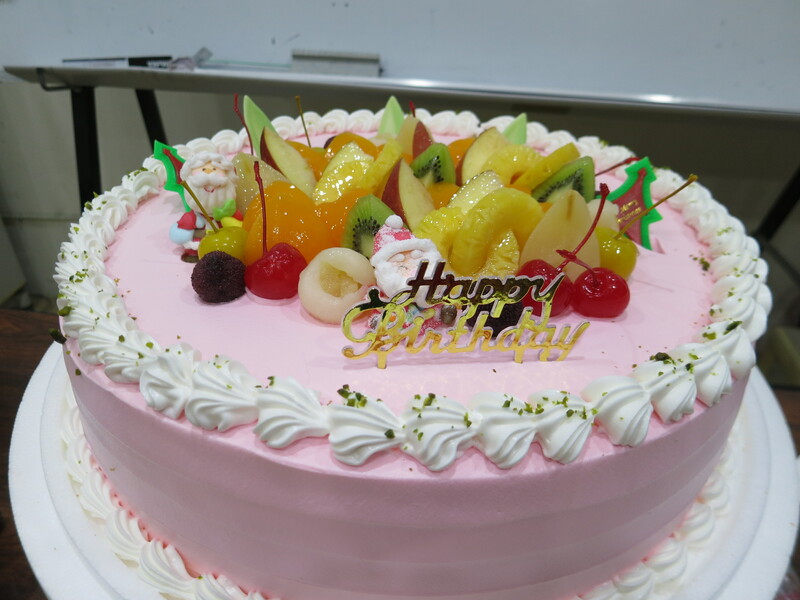 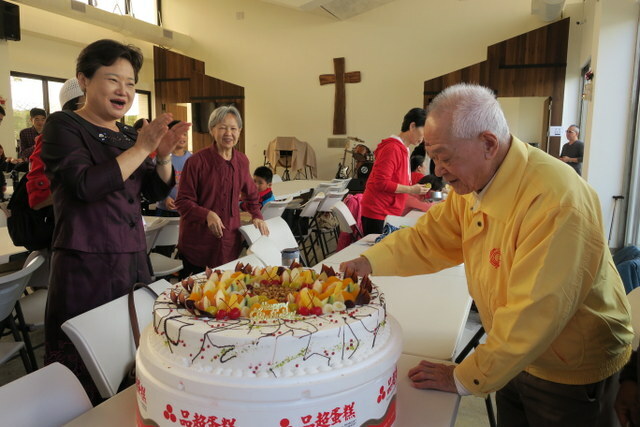 Today is also the 90th birthday of our church member, Mr. Chang, whose son had ordered a huge cake for us all to enjoy! 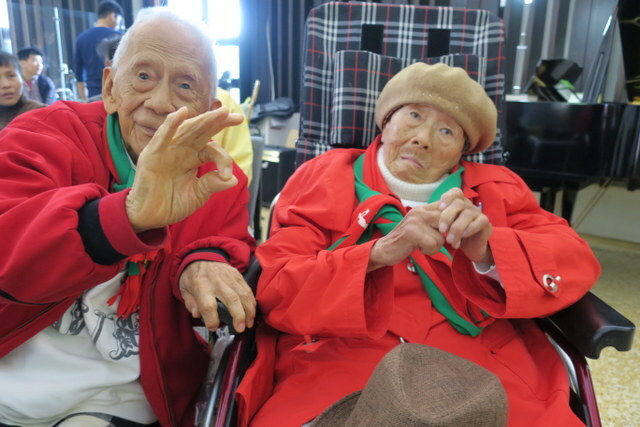 Oh yes, and Tan Mama and Tan Baba were here again, with their son, all in red and green and looking as wide awake as ever! 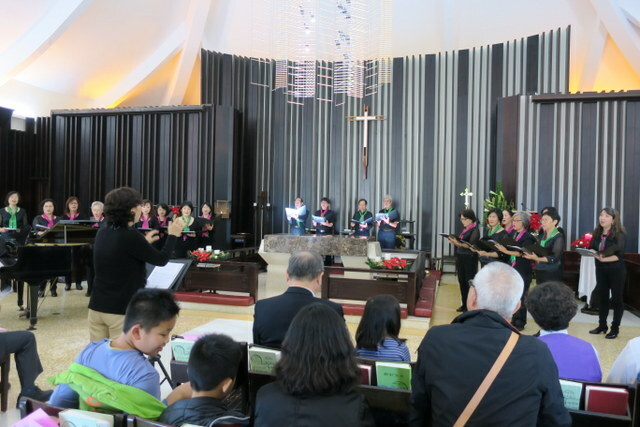 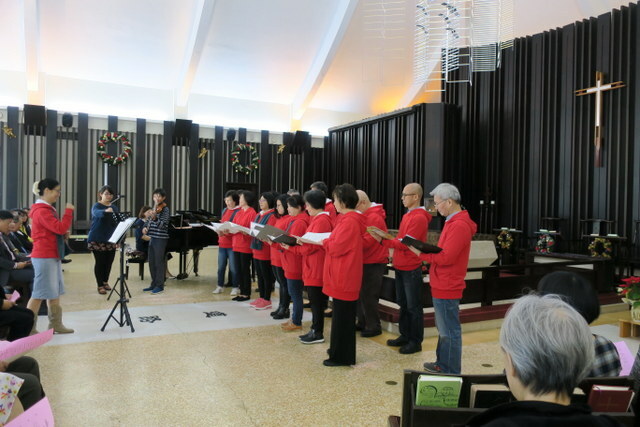 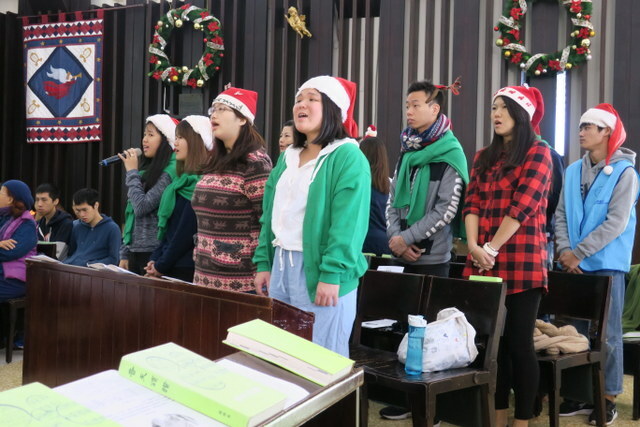 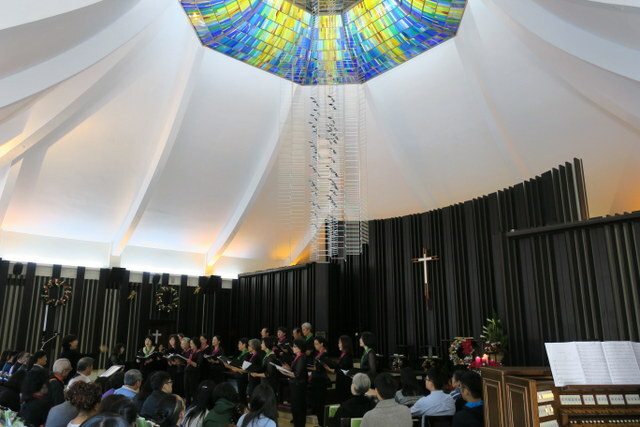 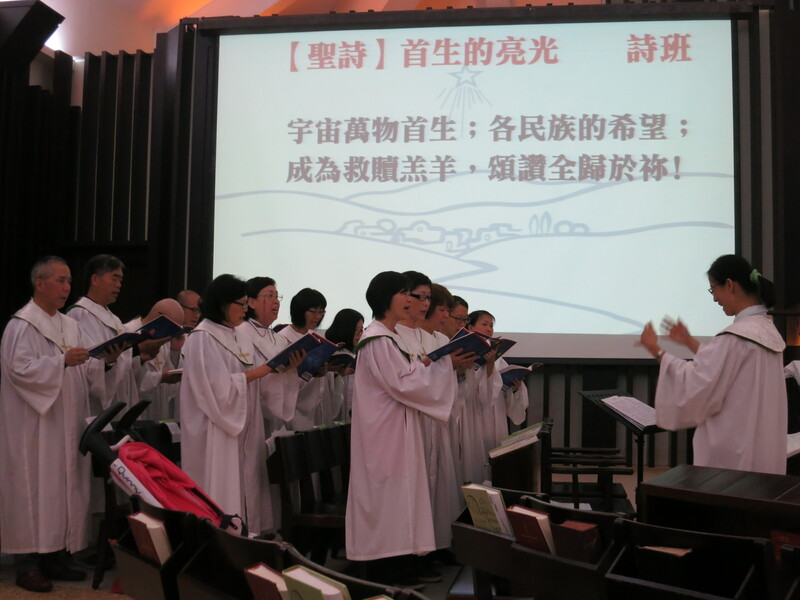 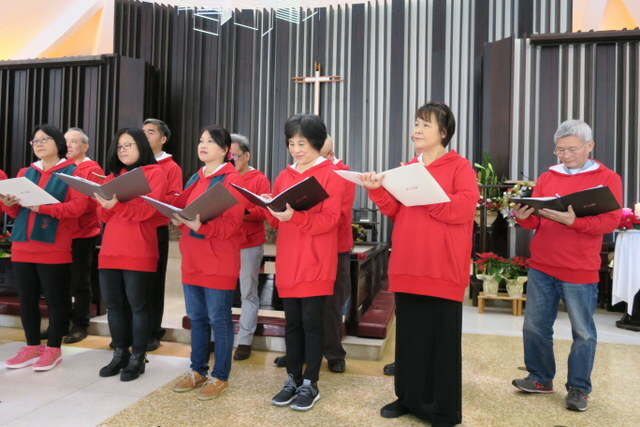 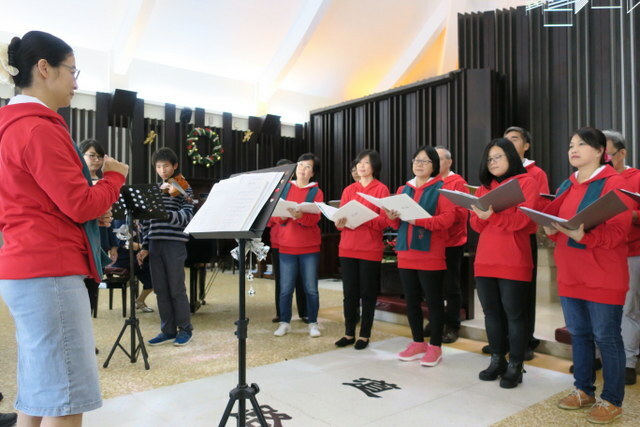 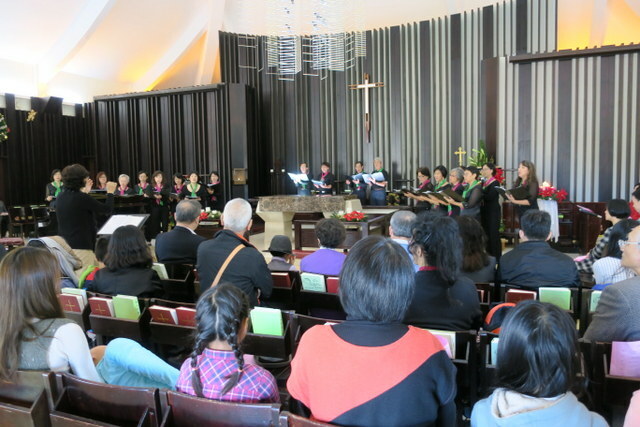 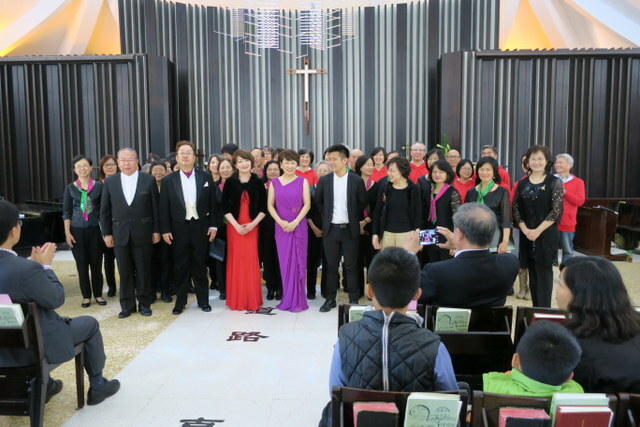 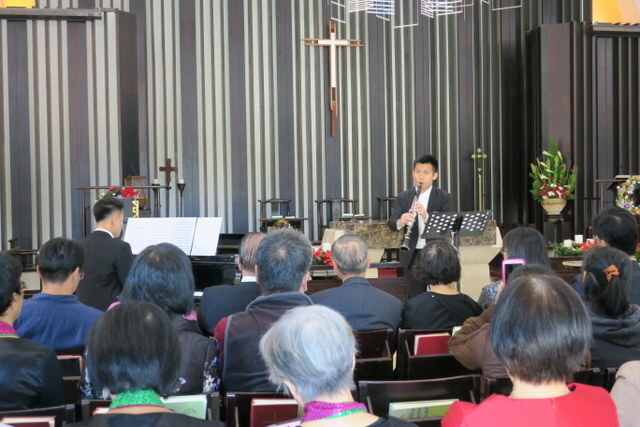 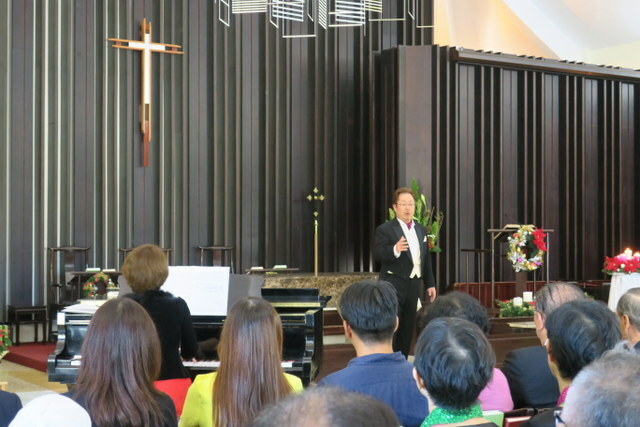 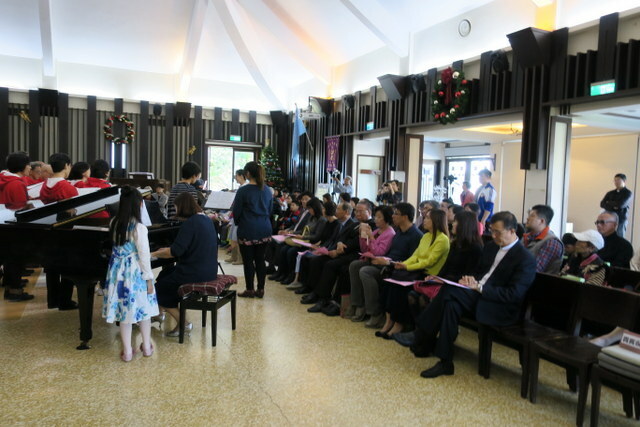 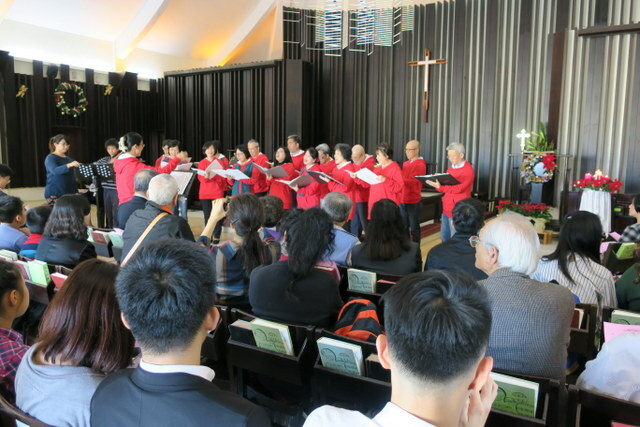 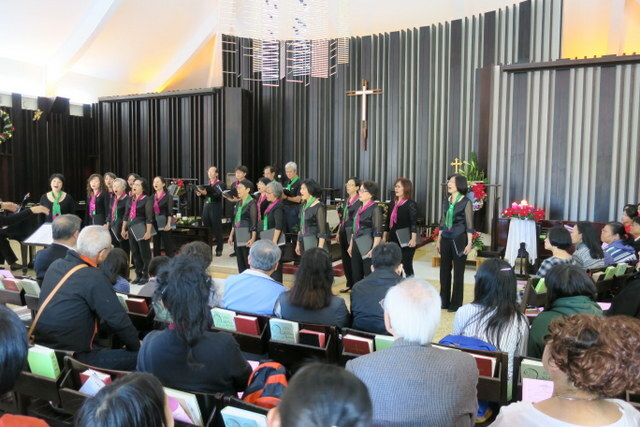 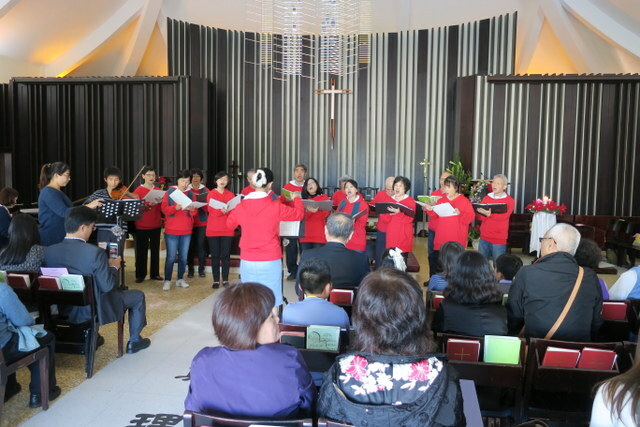 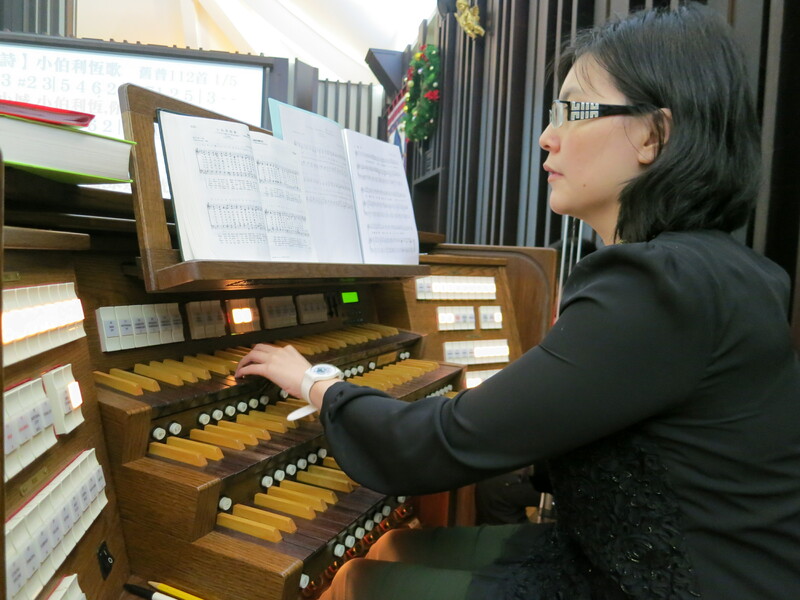 At 2:00 pm this afternoon, we had a special Christmas Concert in Advent Church, led by Mrs. Wang, our church member, music teacher here at the university and choir leader of a variety of excellent choirs in the area. 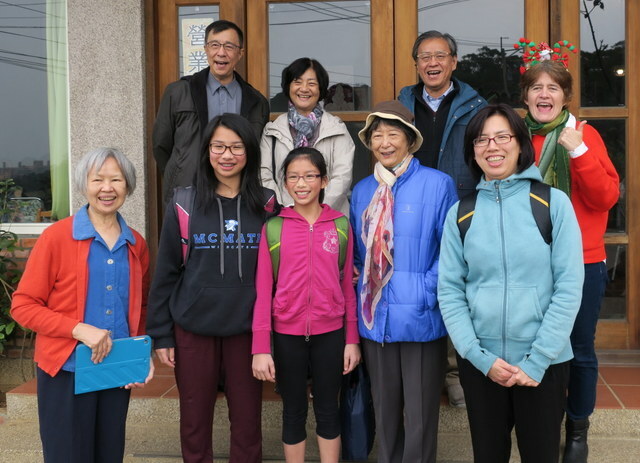 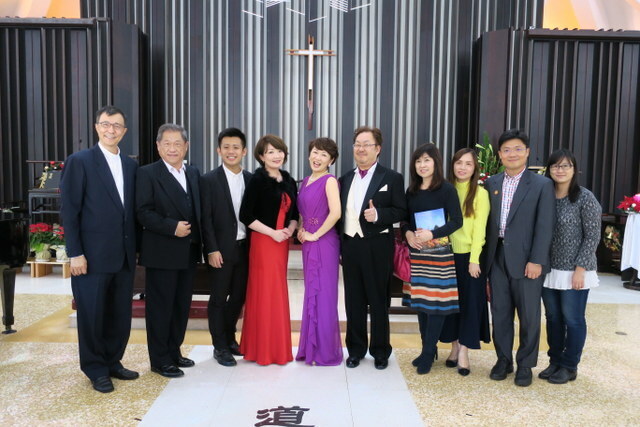 We were honored to welcome President Peter Ay and his wife, and Jasmine Yu and the parents association chair from our junior high school next door. 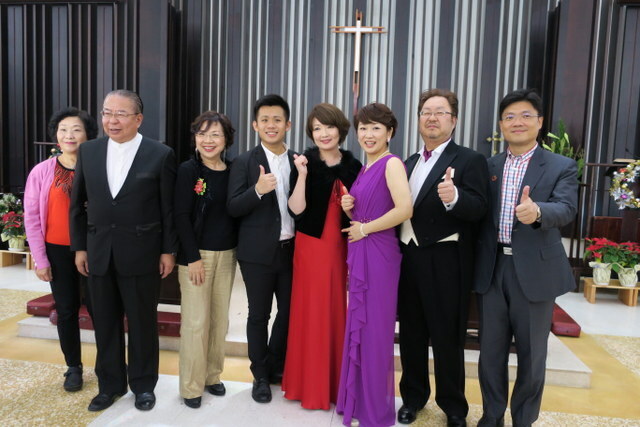 There were also some very very VIP musical guests from Japan, who raised the roof with their voices ~ they were incredible! 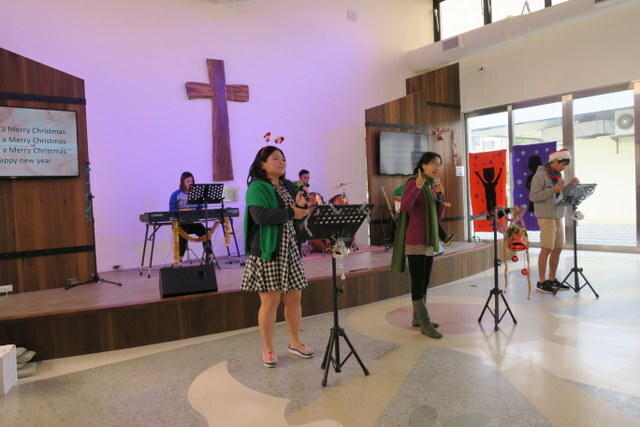 So that was our Christmas Weekend ~ an amazing Christmas as always, and so good that Christmas Eve and Christmas Day were on a weekend, so everyone could come to church, and we could even have a concert on Christmas Day afternoon. 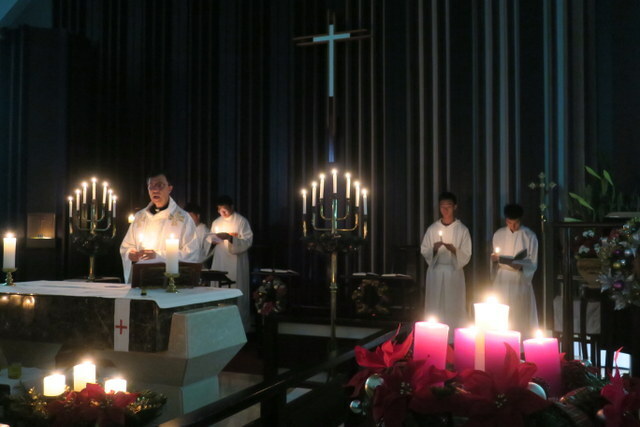 When Christmas falls in the week, we still have a Christmas Eve service, but with work and school that day and the next, many people find it difficult to come. 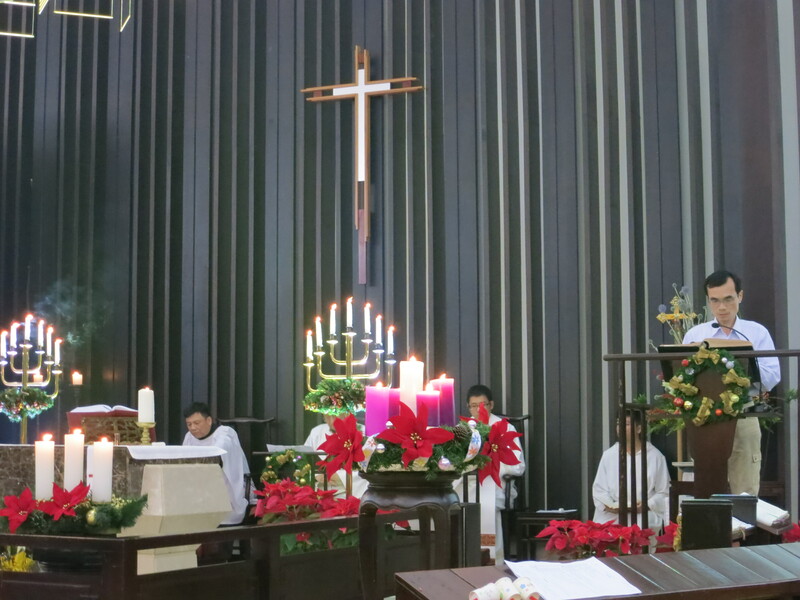 So this year we’ve had time to really appreciate the real meaning of Christmas, and enjoy all the celebrations, thanks be to God! 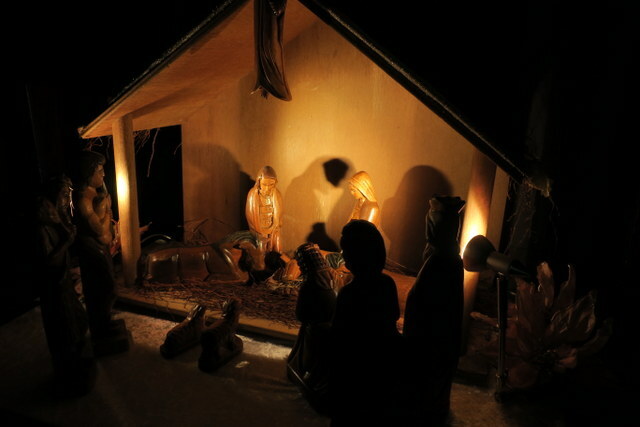 Jesus, our saviour, light of the world, is born. 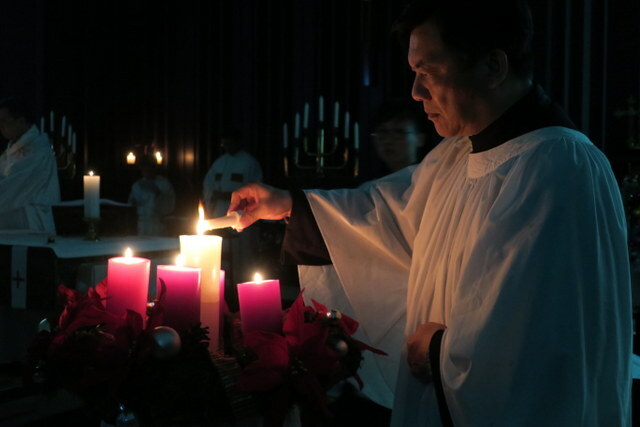 Emmanuel, God is with us! 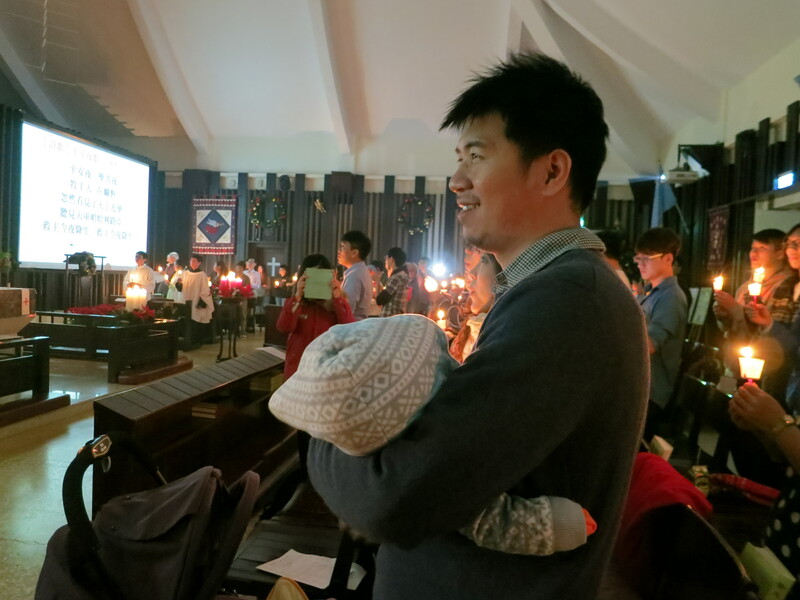 Christmas Eve @ Advent Church! 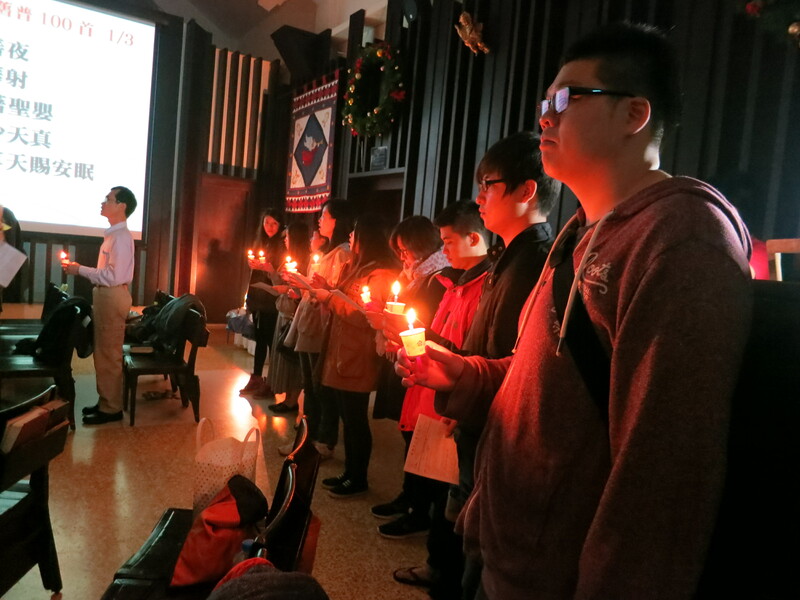 The highlight of Christmas Eve at St. John’s University every year is our Christmas Eve Service in Advent Church, well-attended by students, church members, local people and visitors ~ YES! 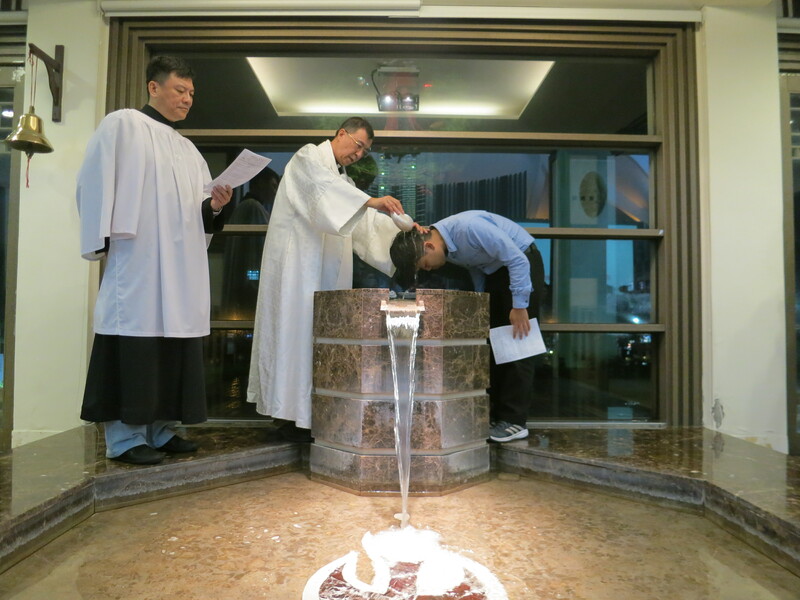 Last night the service started at 7:30pm, and we also had 2 baptisms ~ a gorgeous 2-month-old baby, son of our lovely church members; and one of our SJU Student Fellowship students in his 4th and final year, who was supported by all the Student Fellowship. 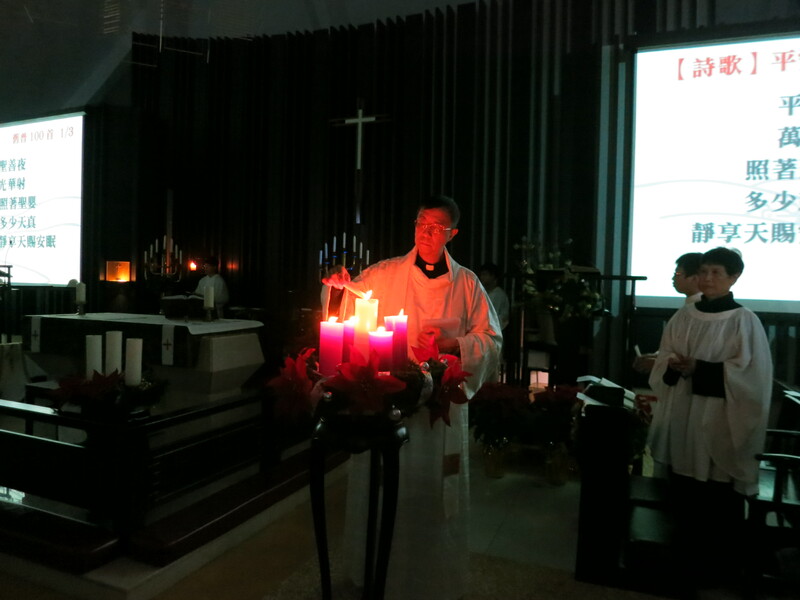 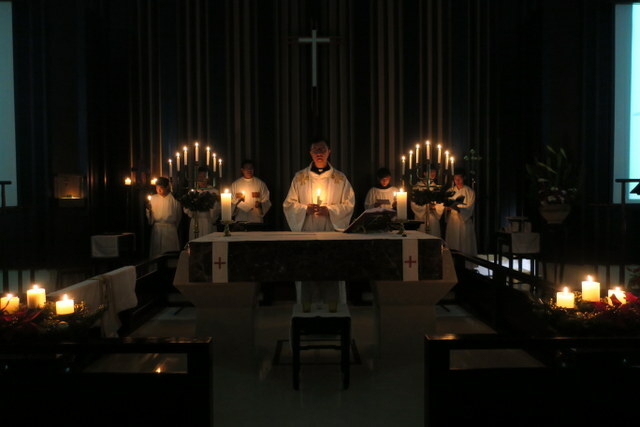 We started the service in darkness, then with candles ~ BEAUTIFUL! 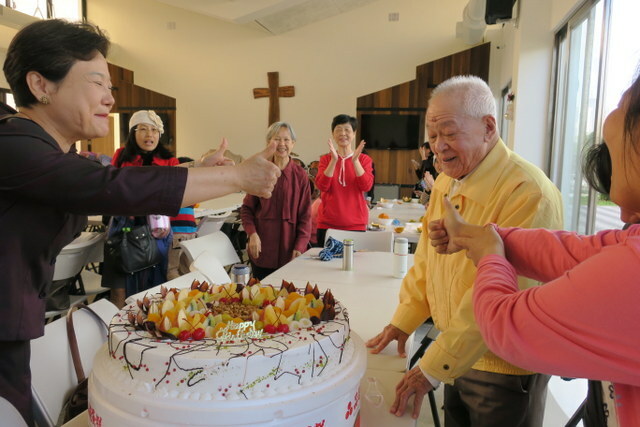 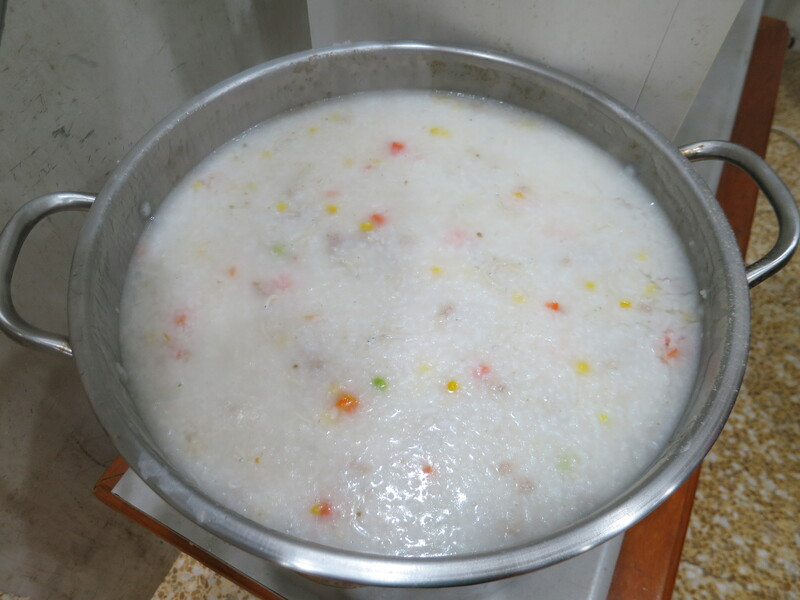 And we finished the service with rice porridge and birthday cake! 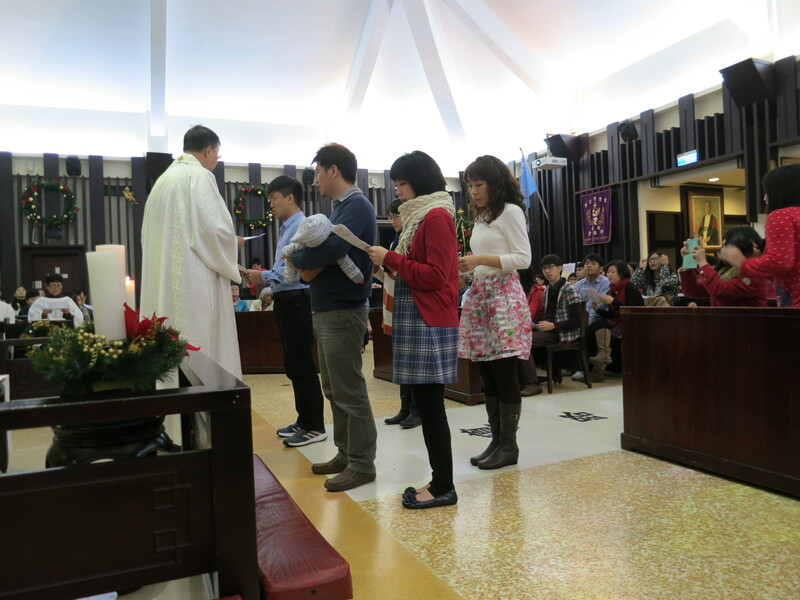 Thanking God for all our Christmas celebrations, for the newly-baptized, and for all those who were able to come to the service. 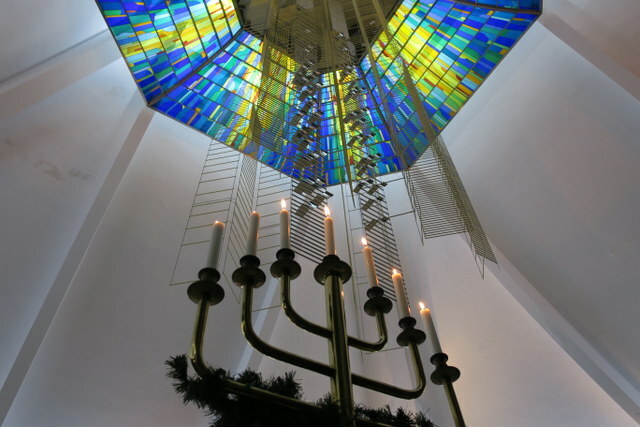 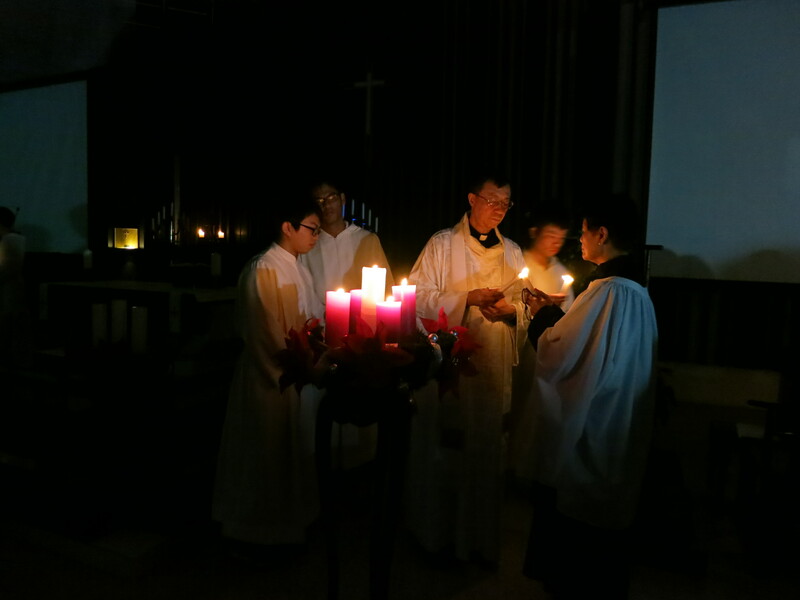 Earlier in the day we had been on our 4th and final Advent Walkabout around the SJU campus lighting all the candles on the Advent wreath in each office and singing ‘Silent Night’. 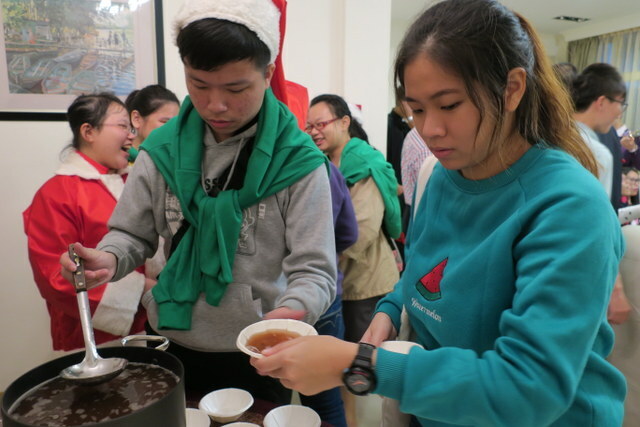 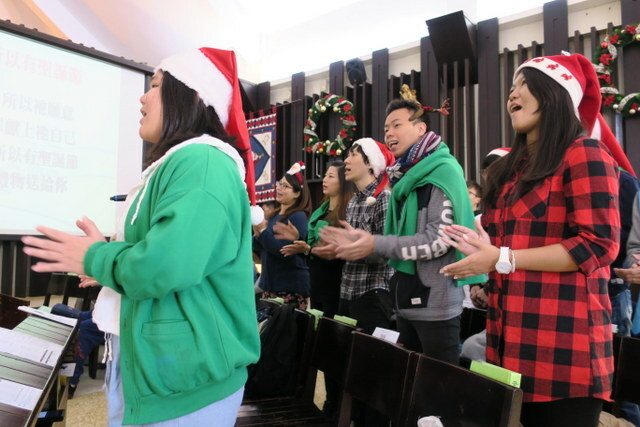 We’d also had a Student Fellowship Christmas Party – a non-stop day! 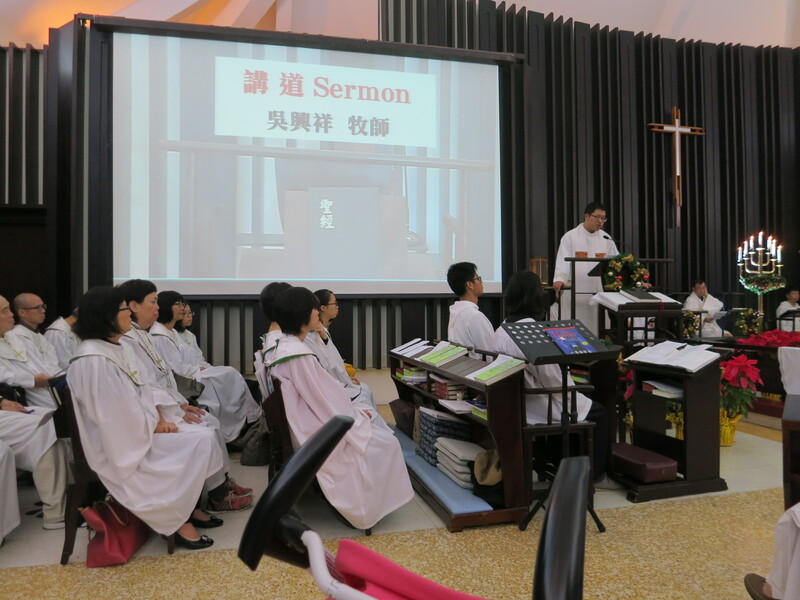 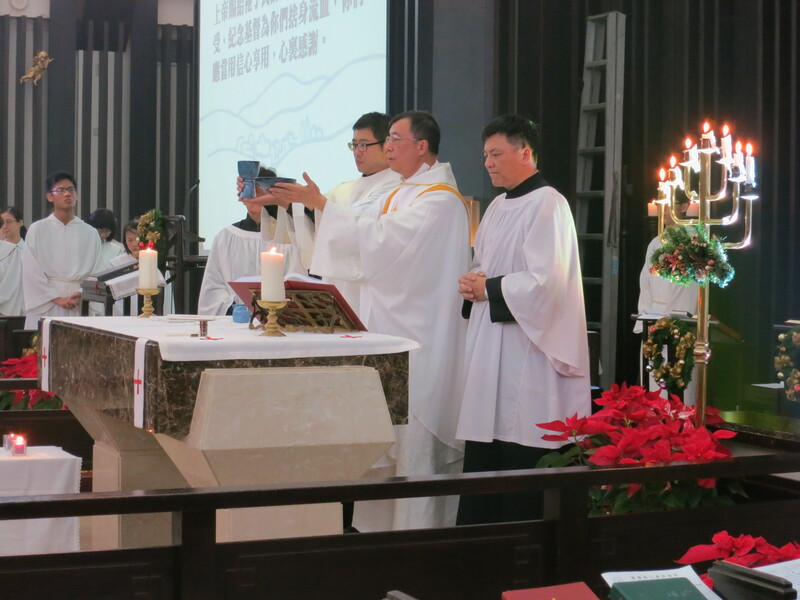 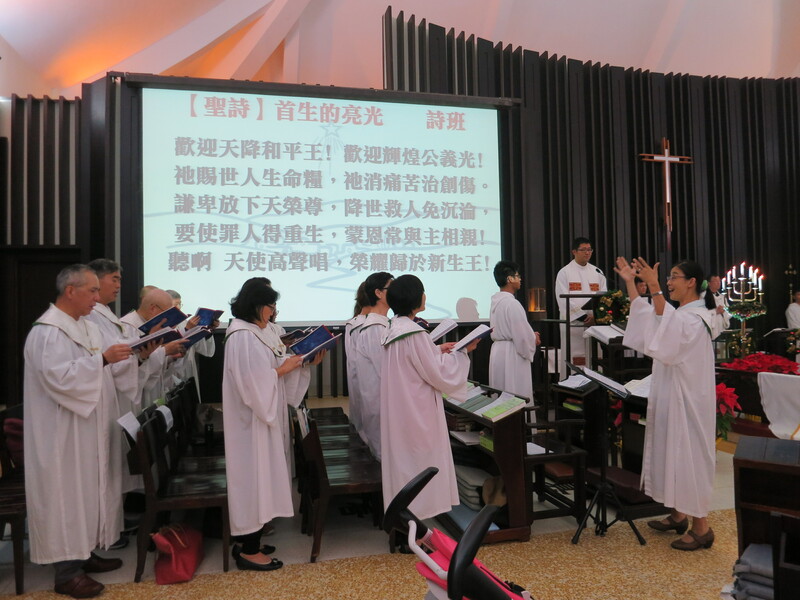 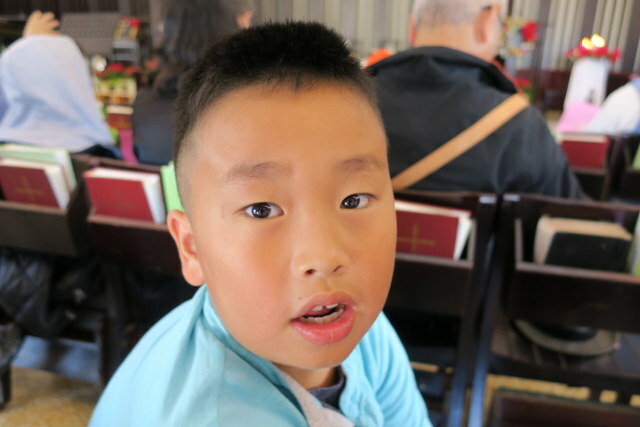 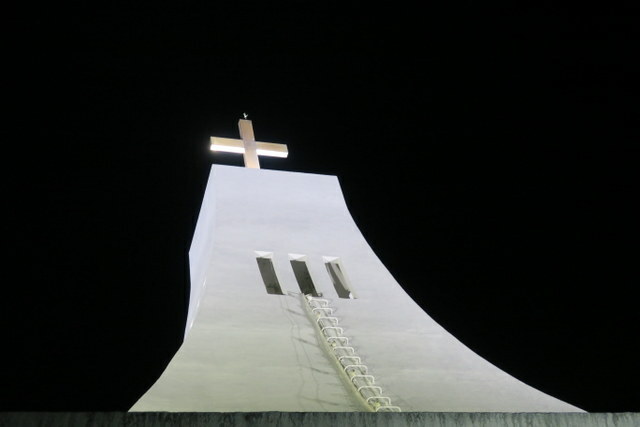 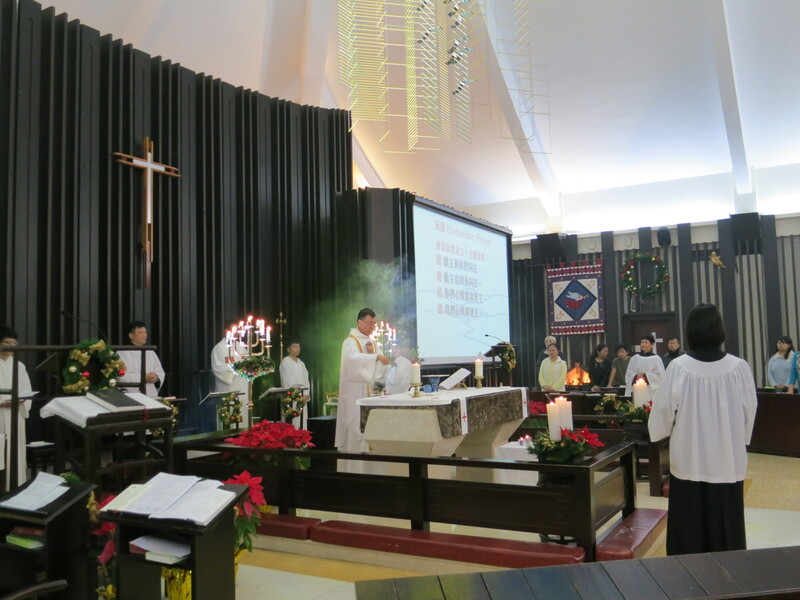 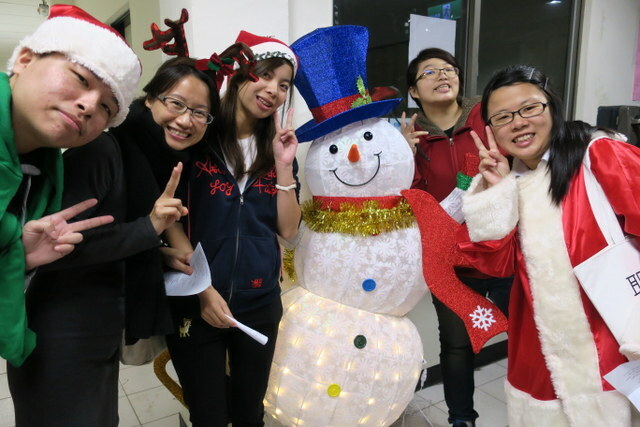 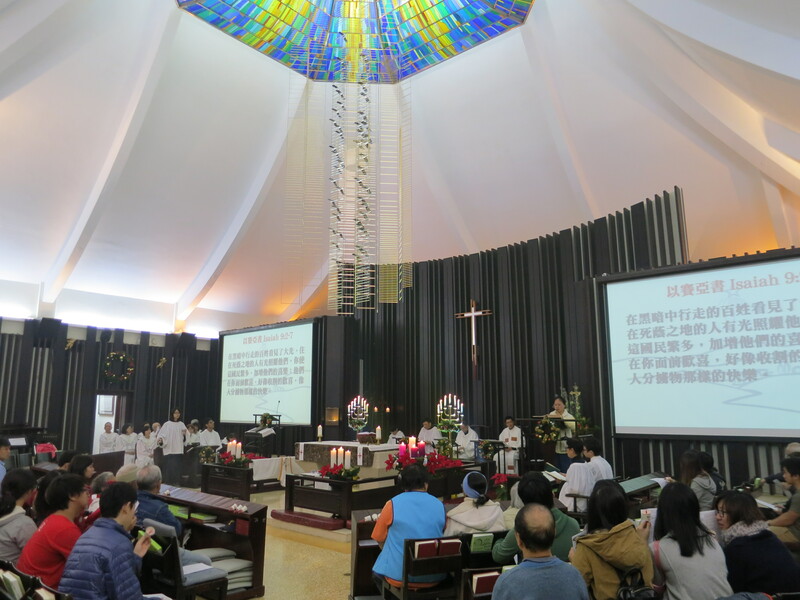 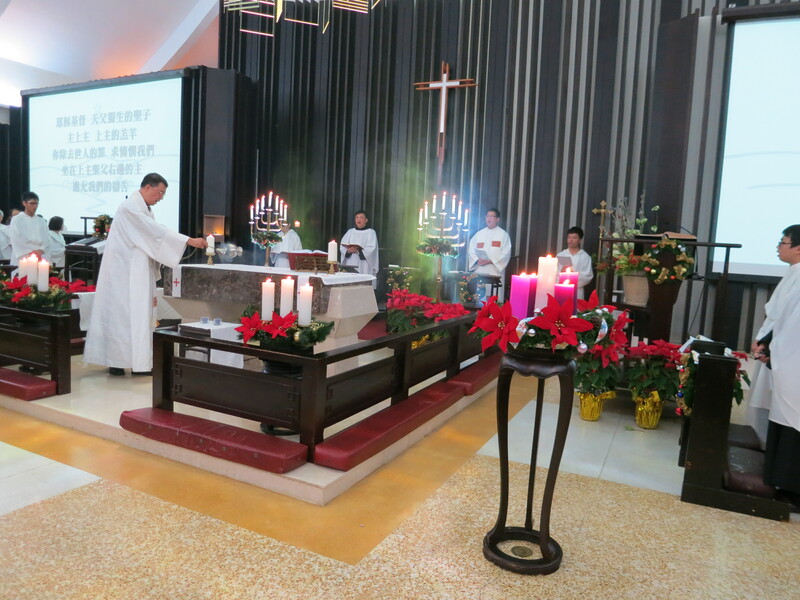 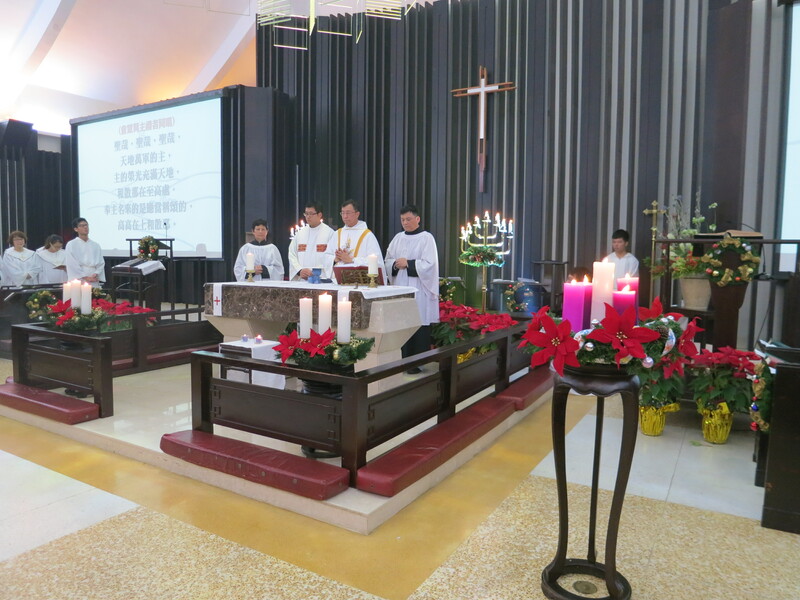 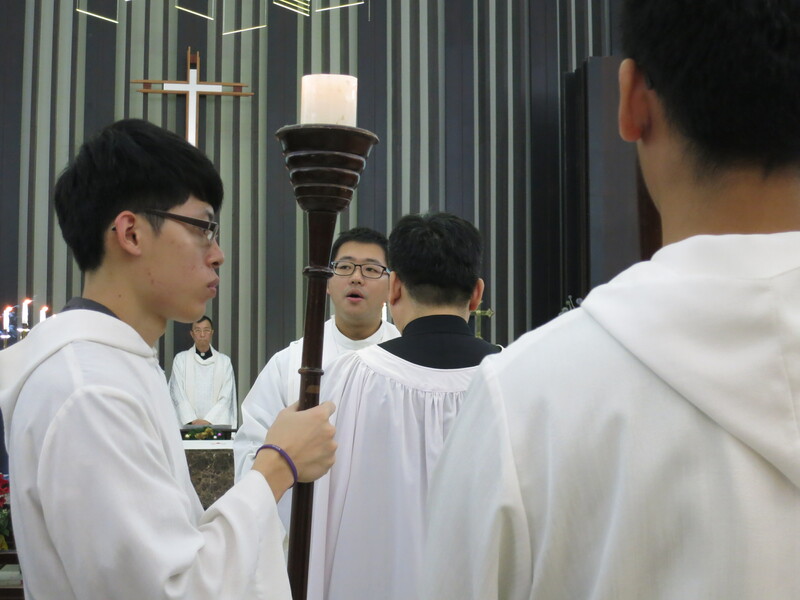 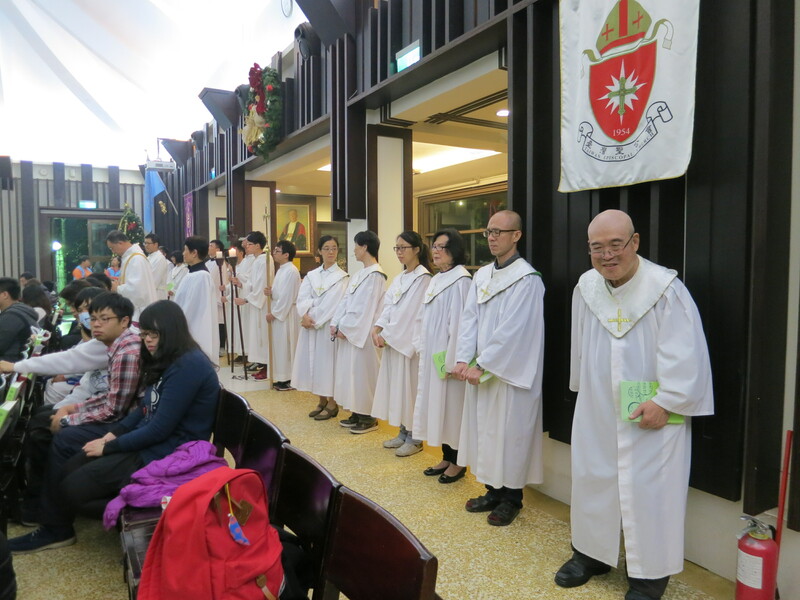 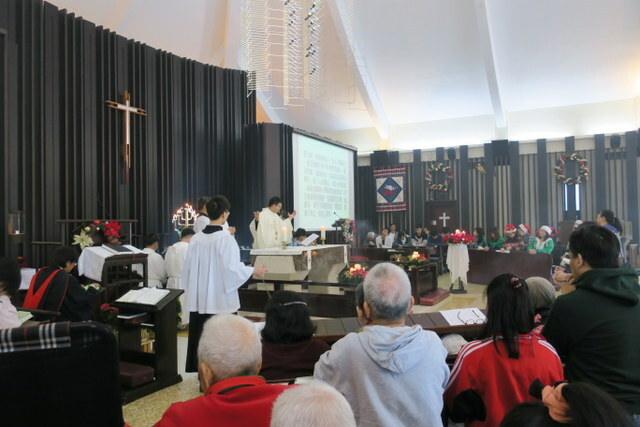 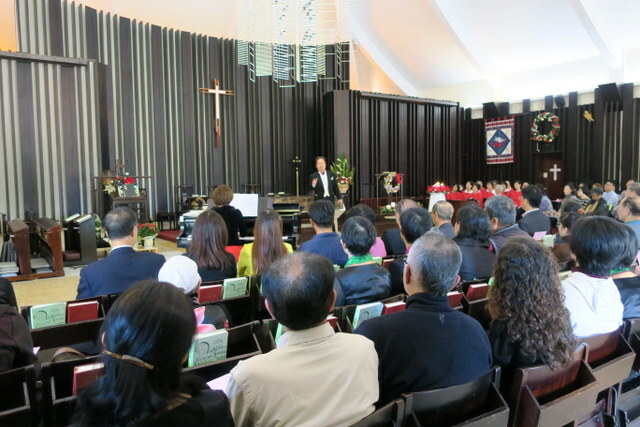 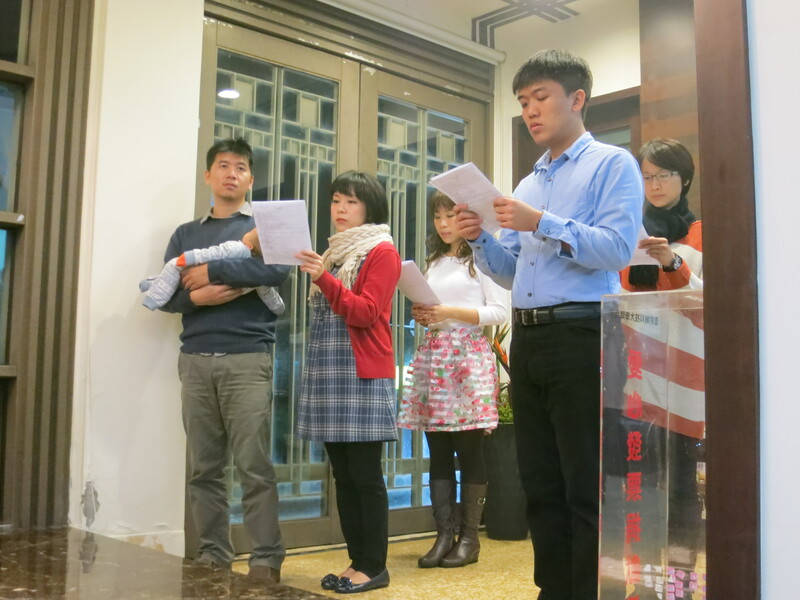 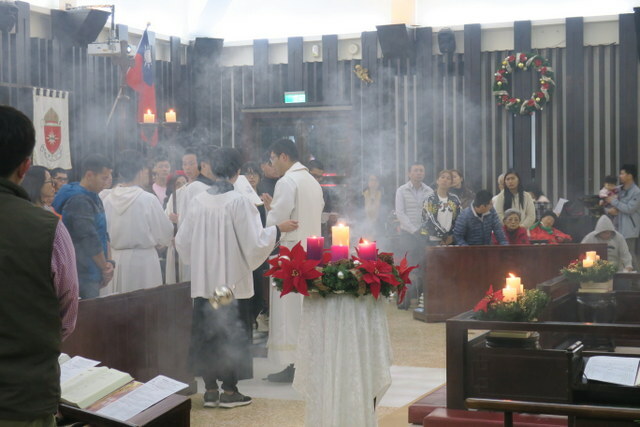 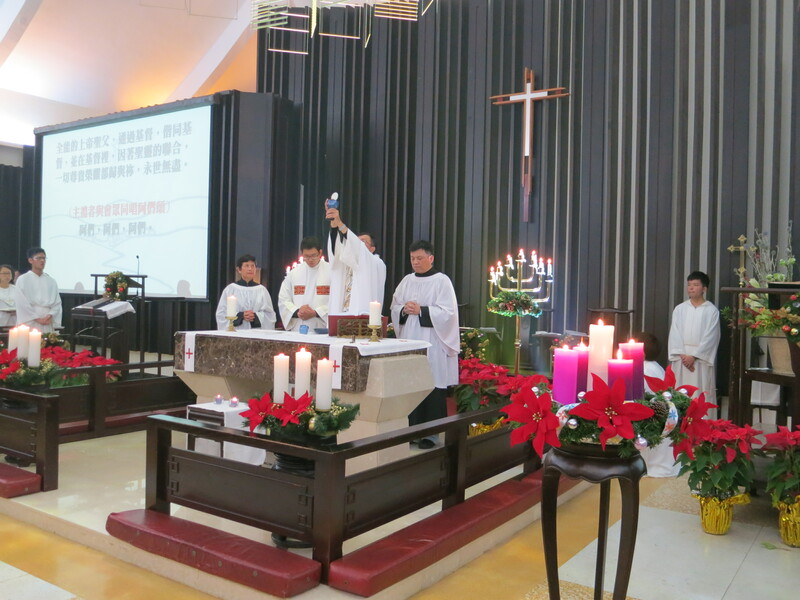 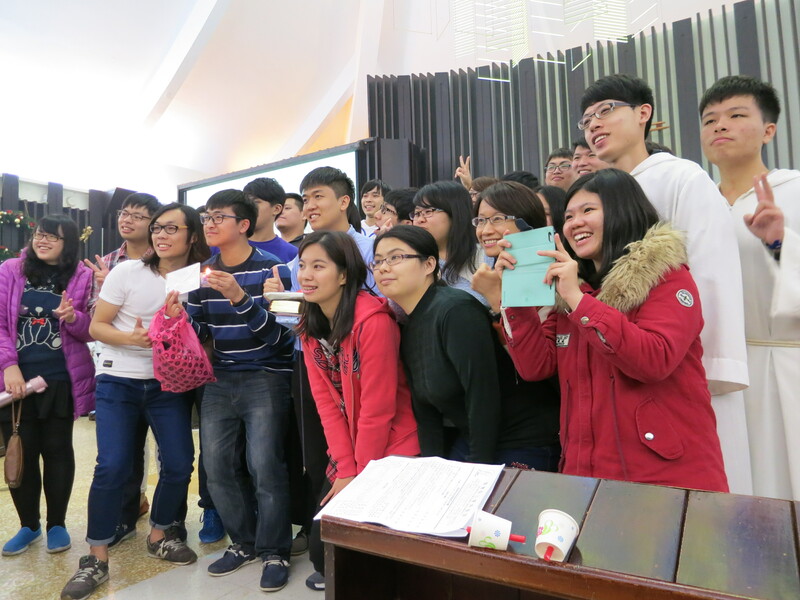 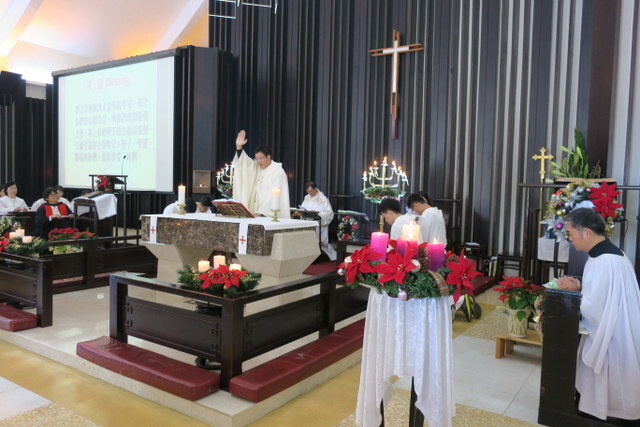 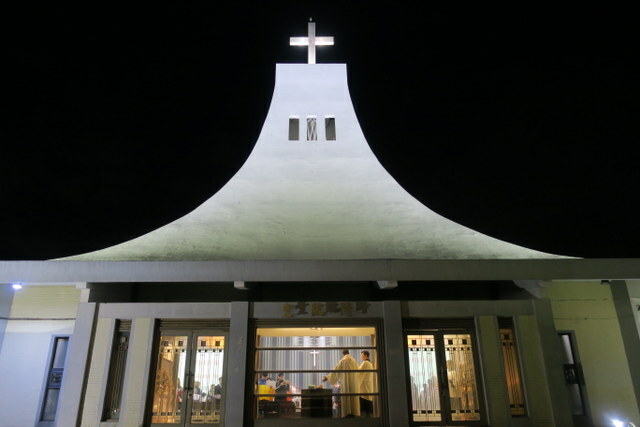 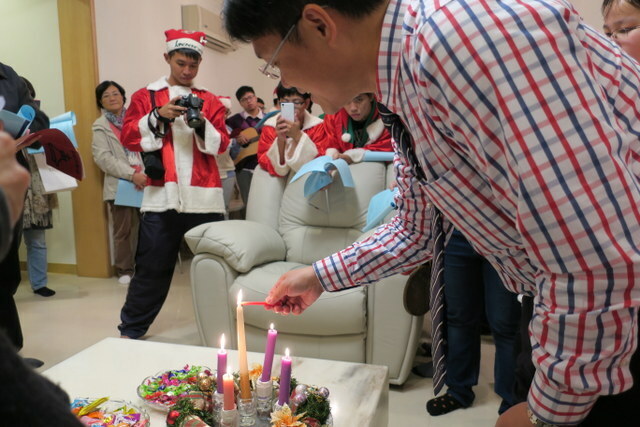 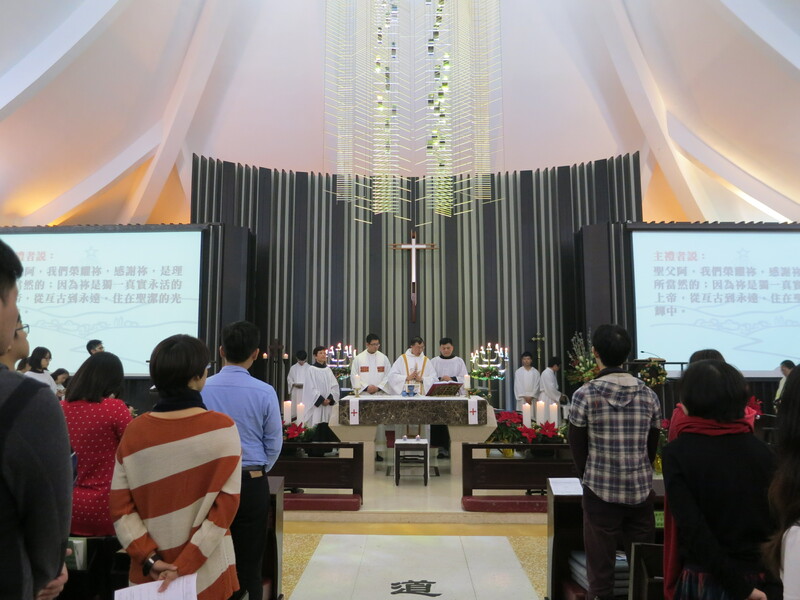 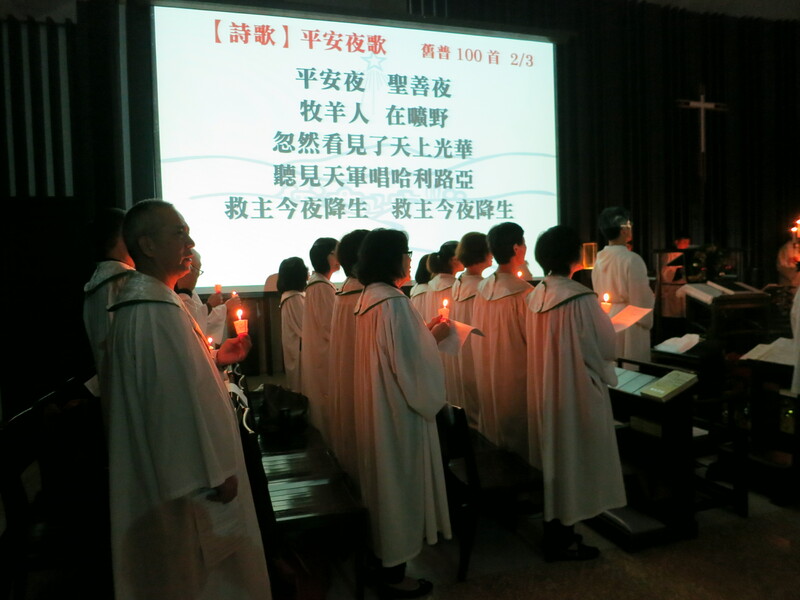 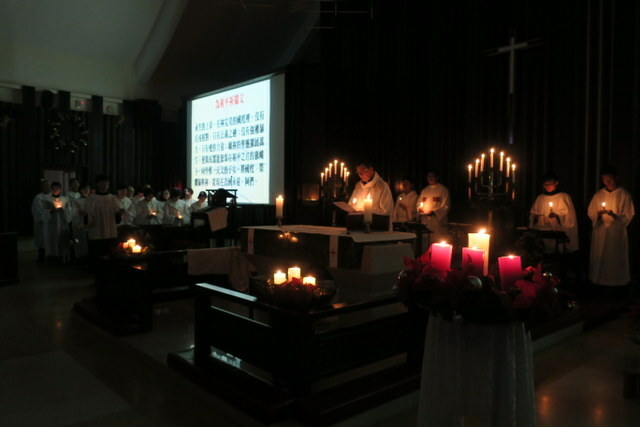 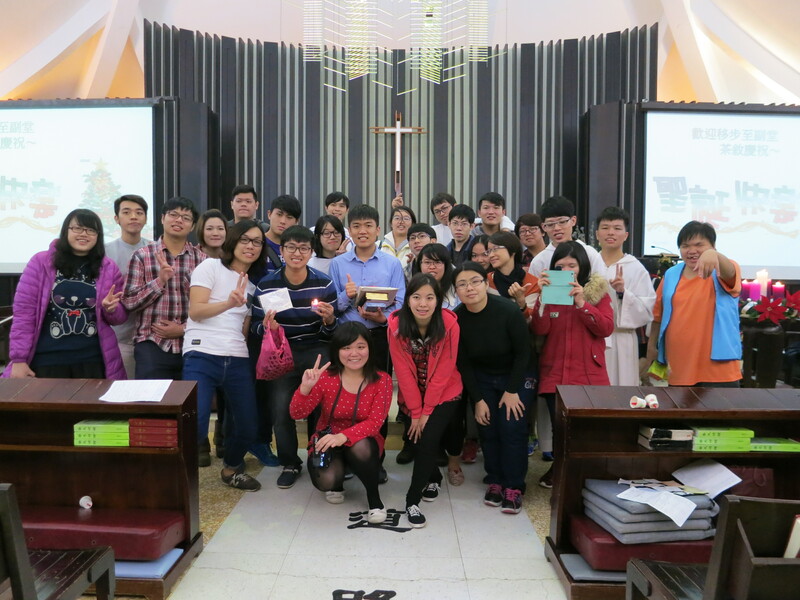 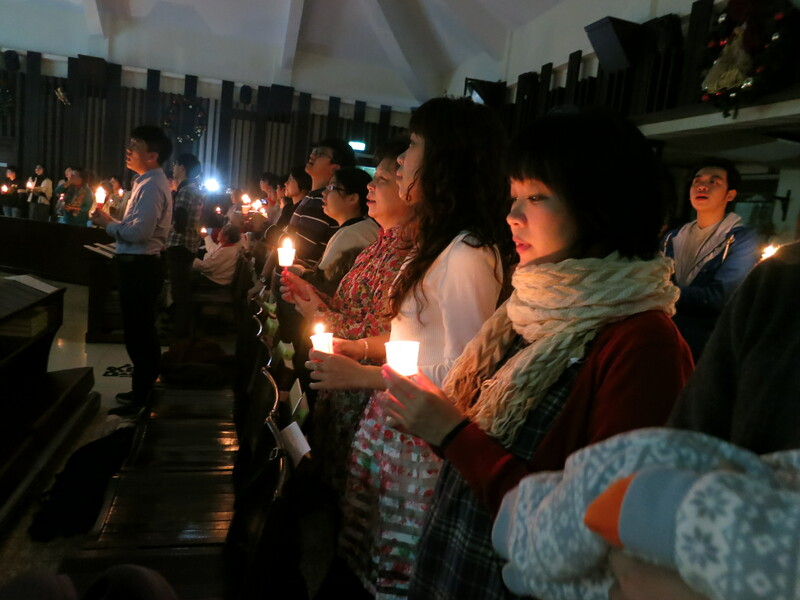 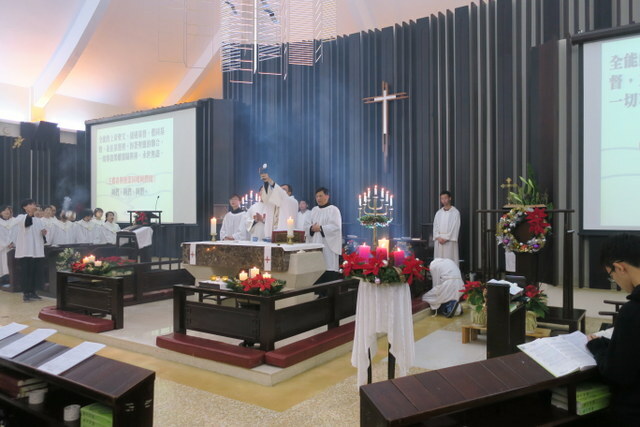 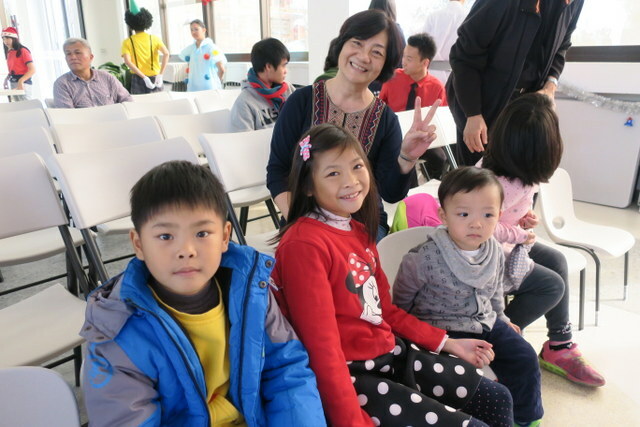 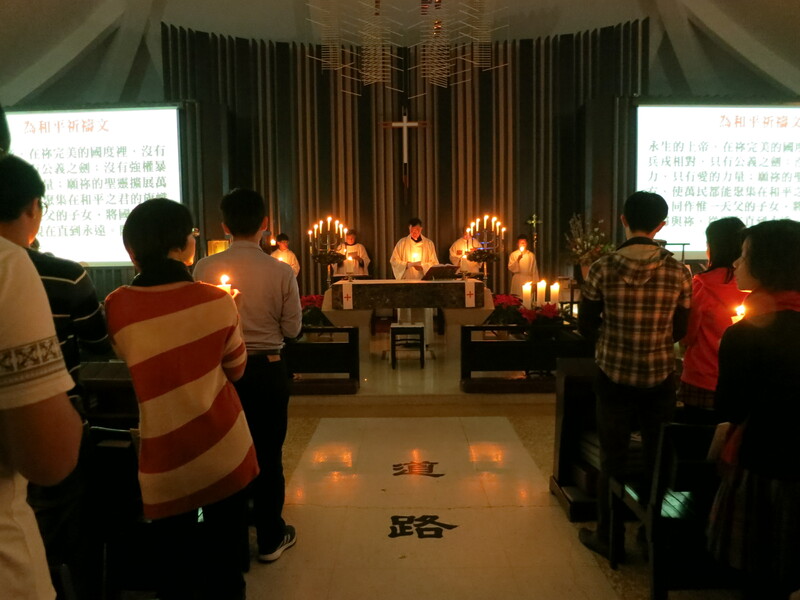 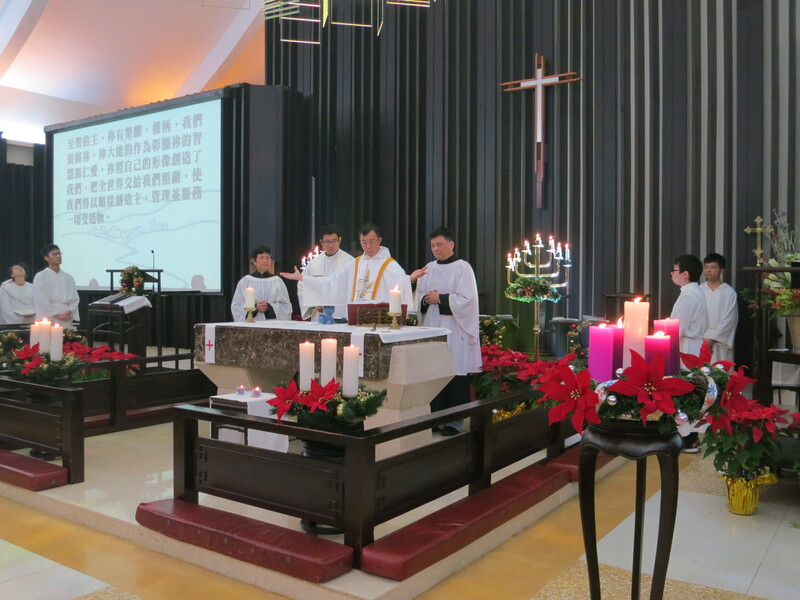 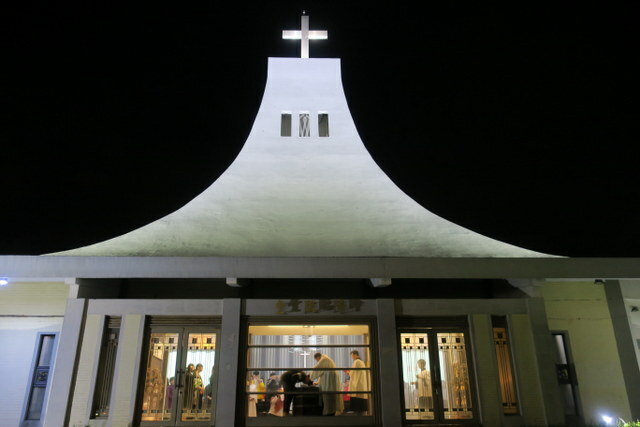 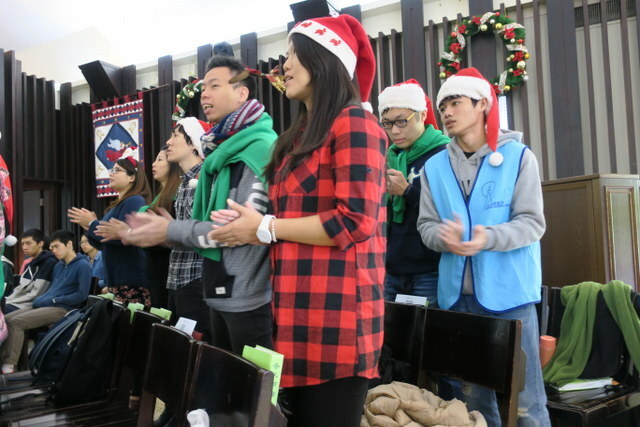 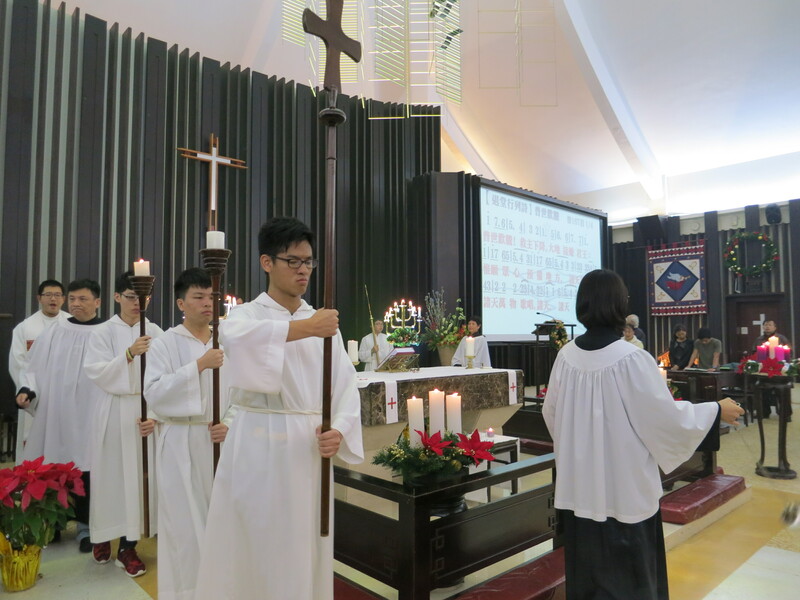 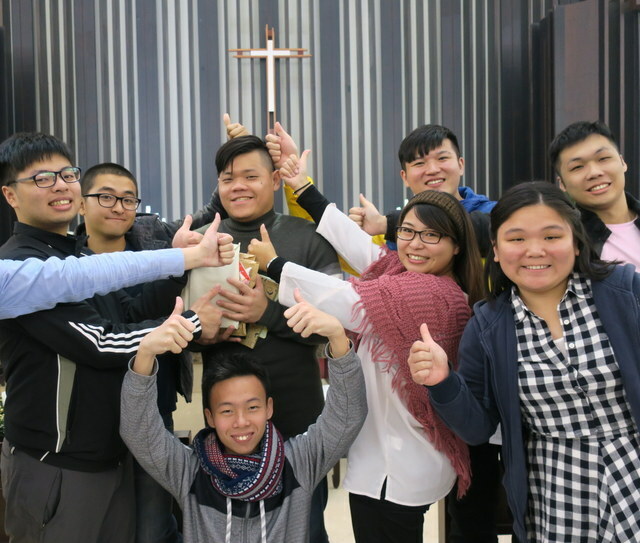 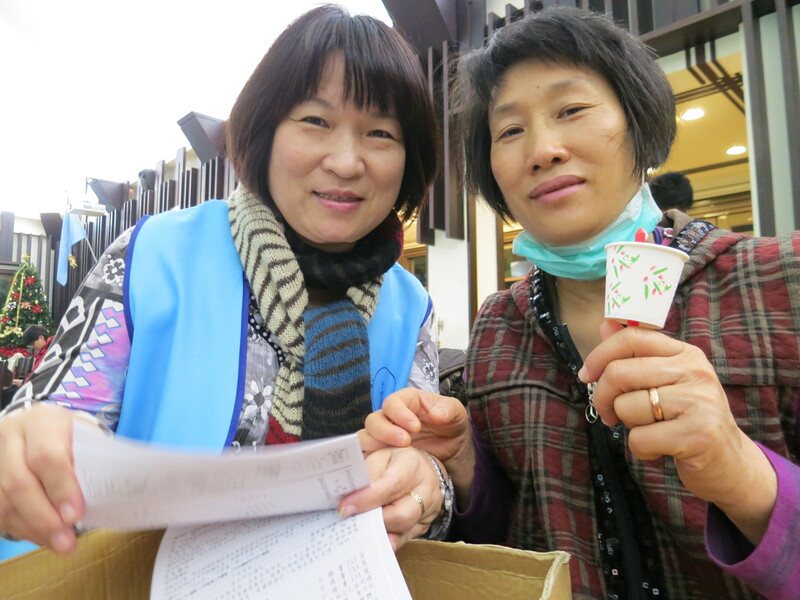 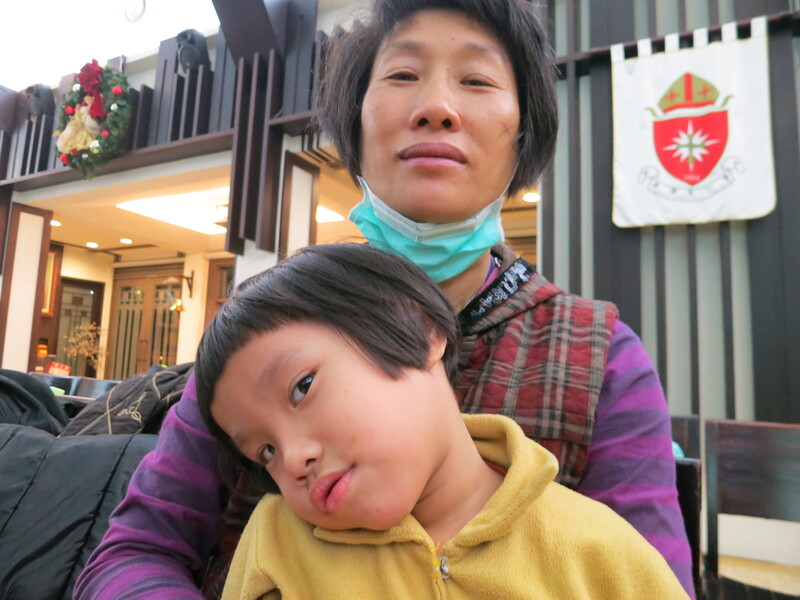 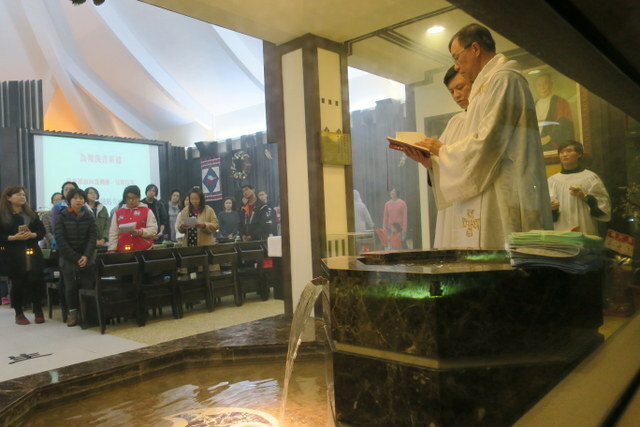 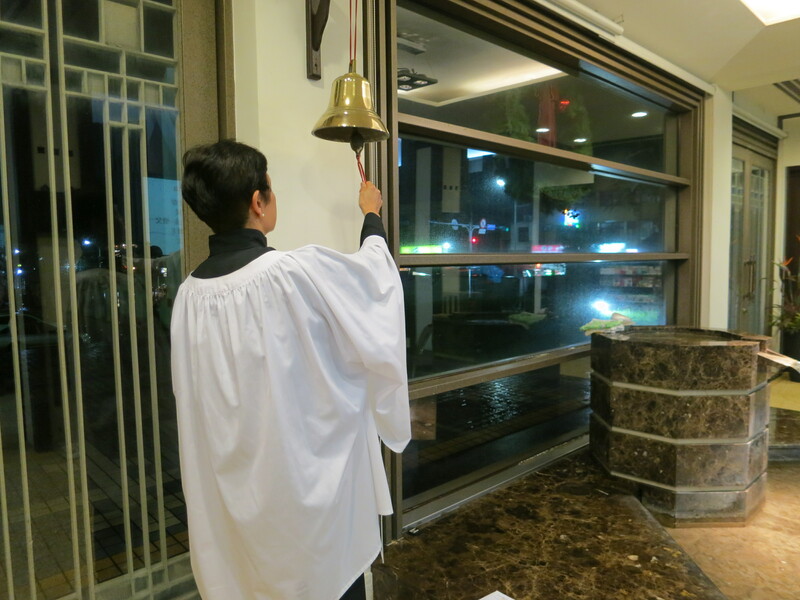 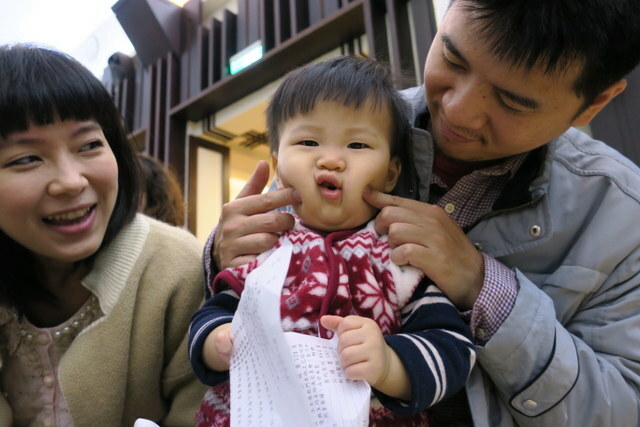 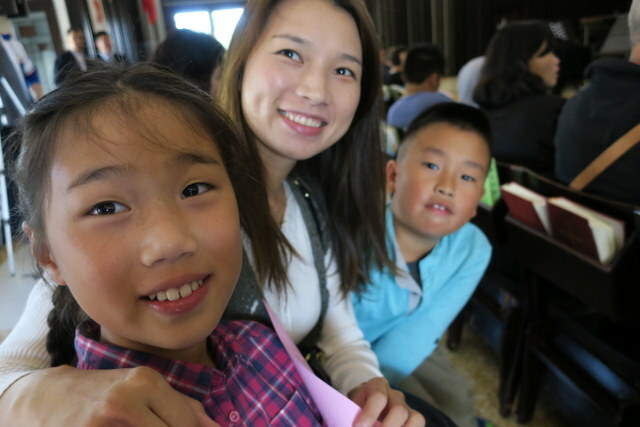 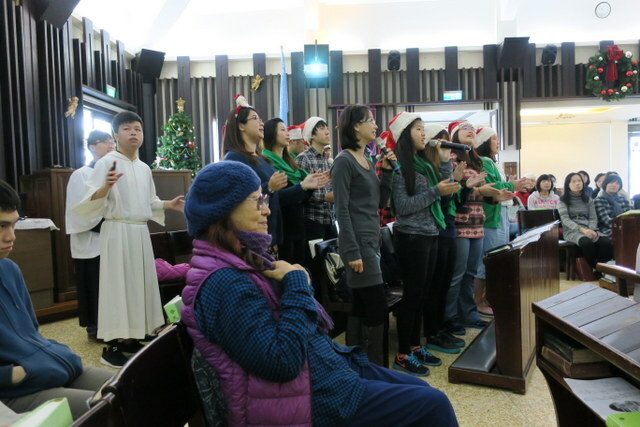 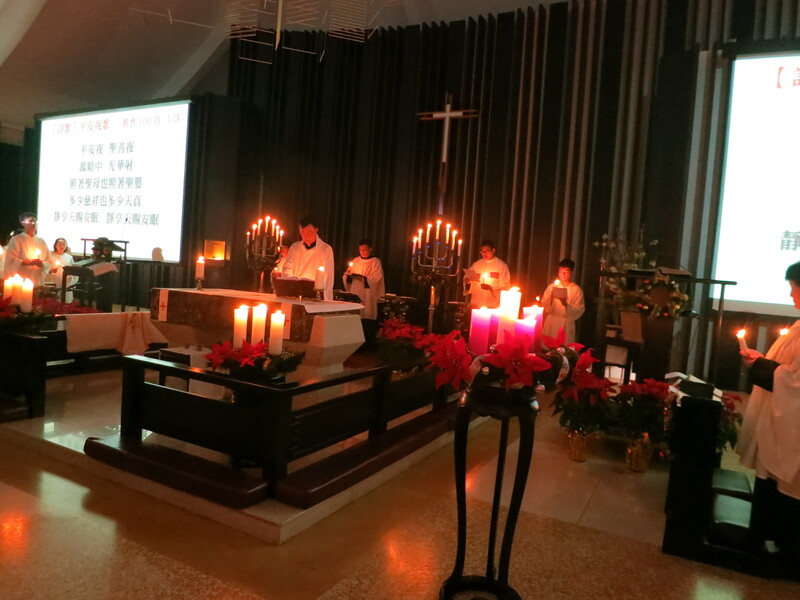 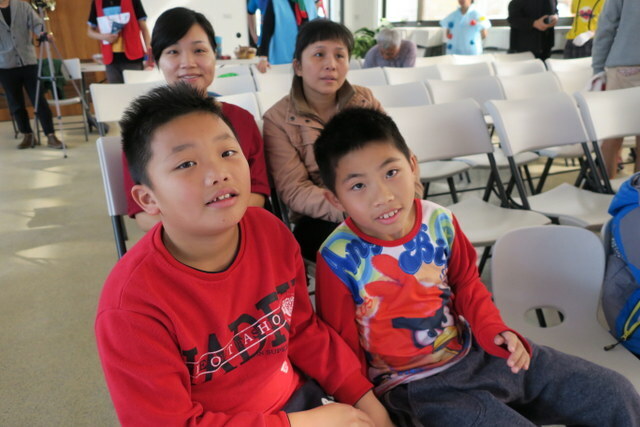 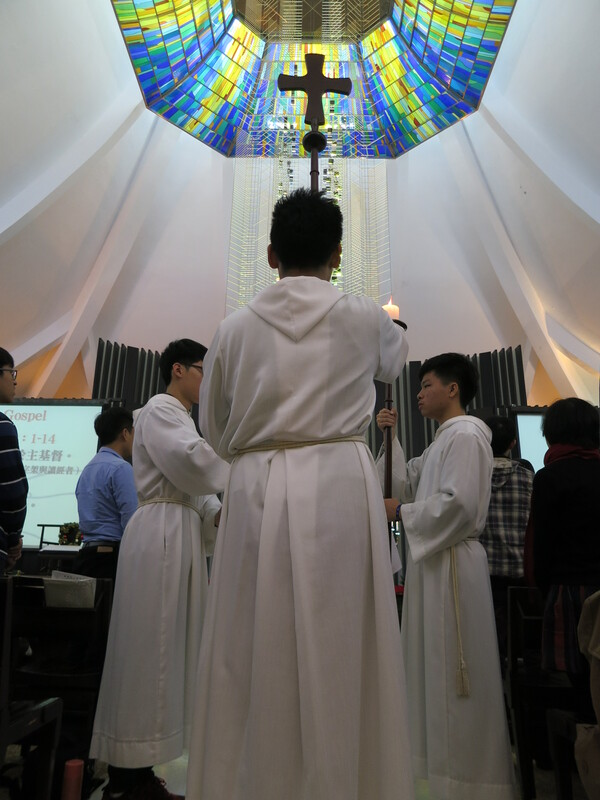 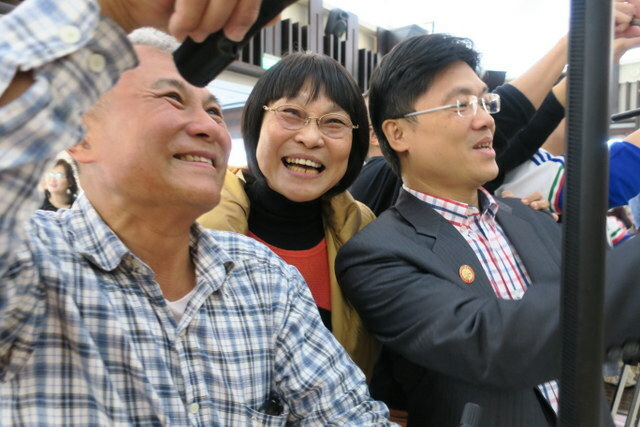 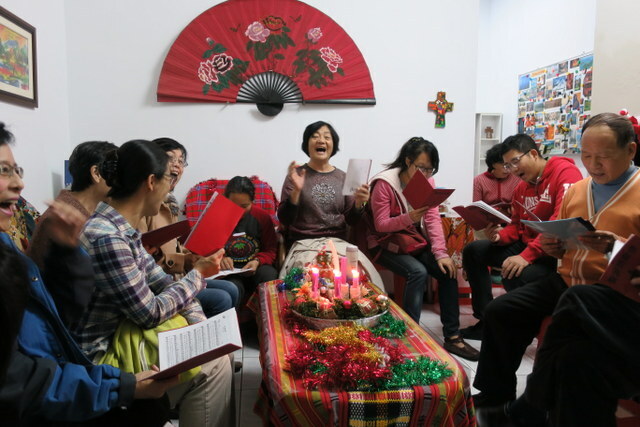 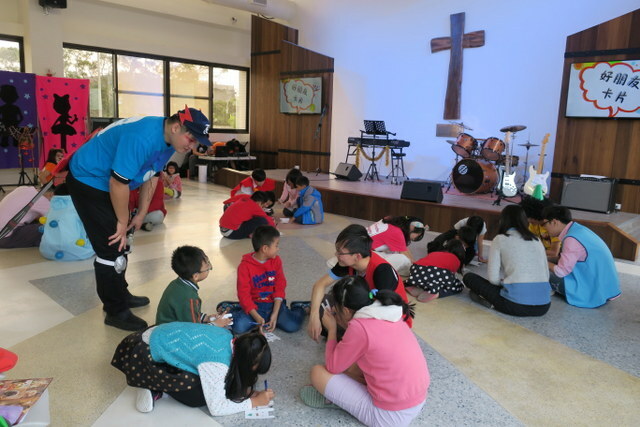 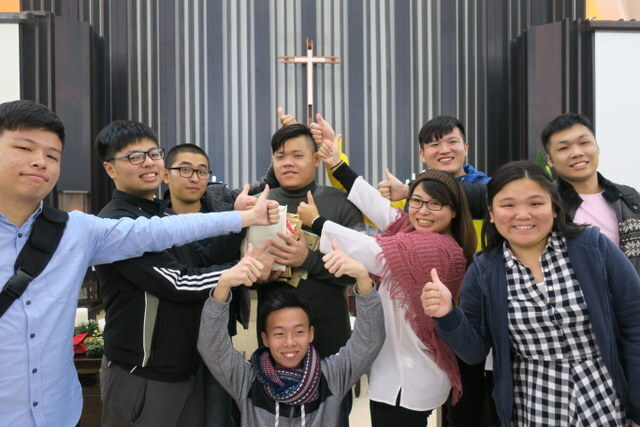 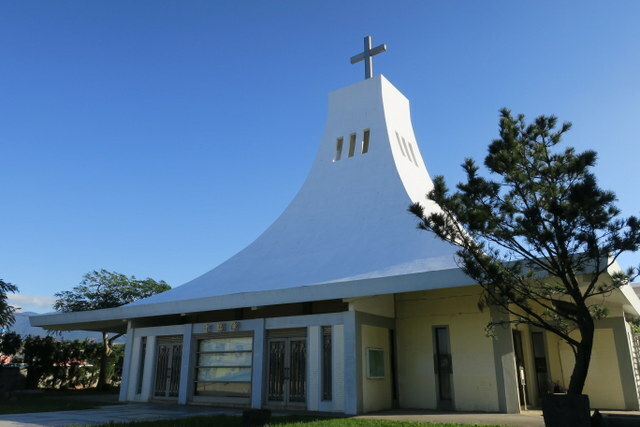 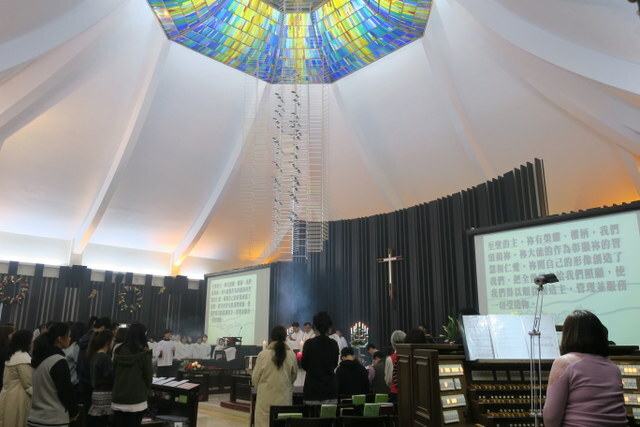 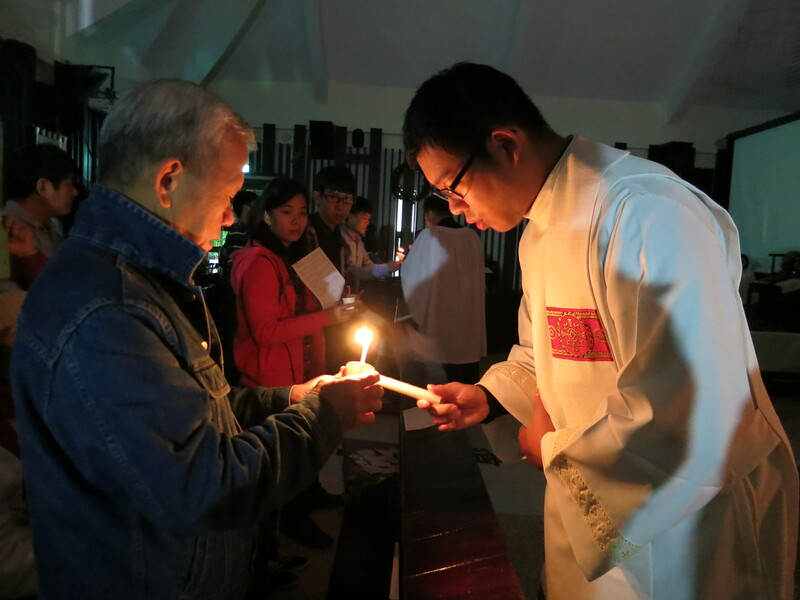 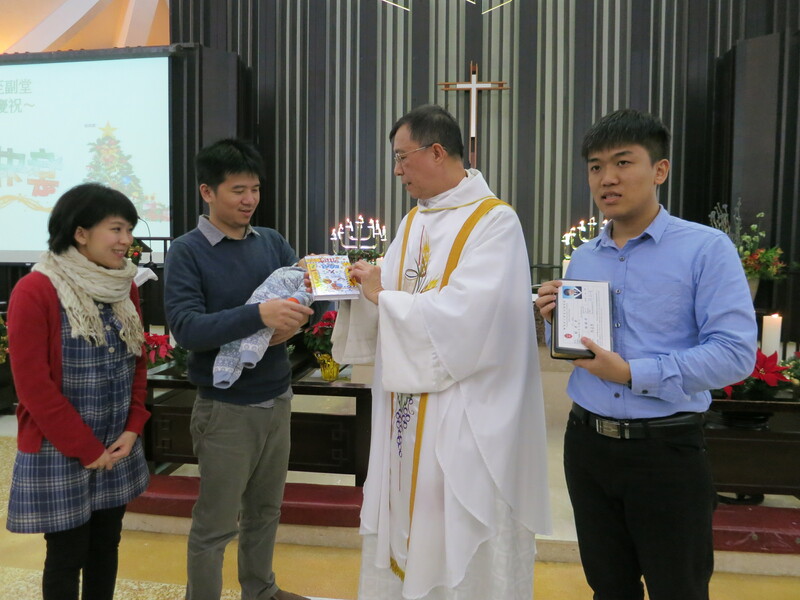 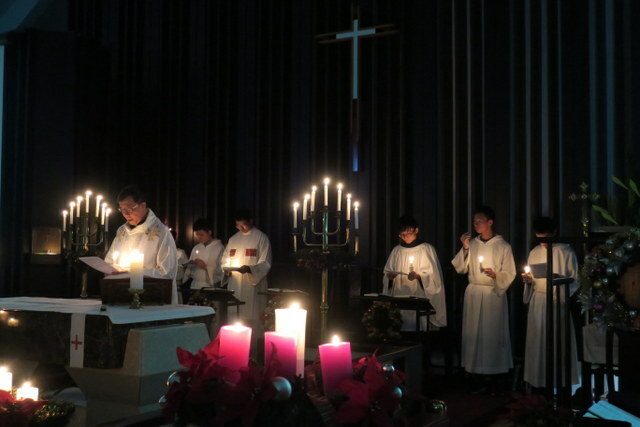 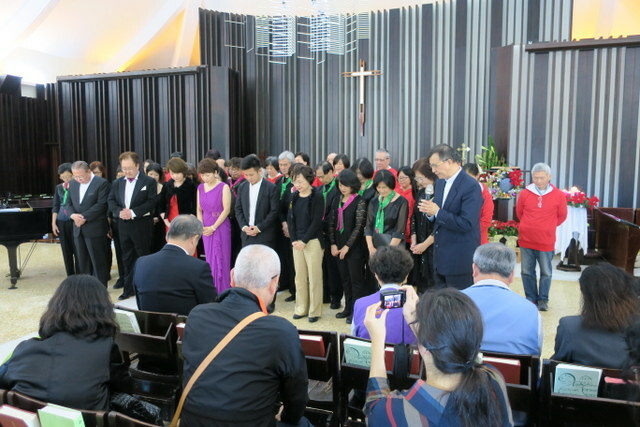 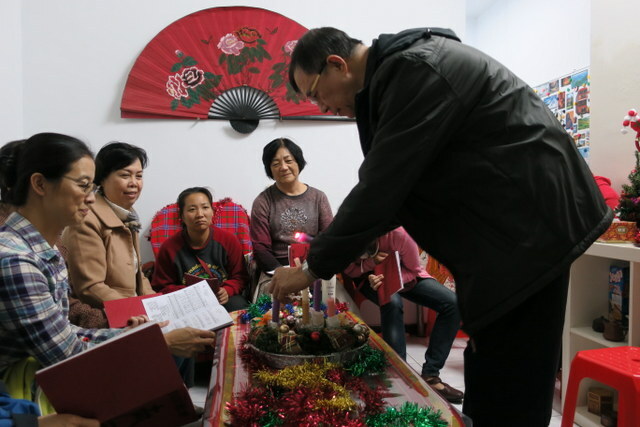 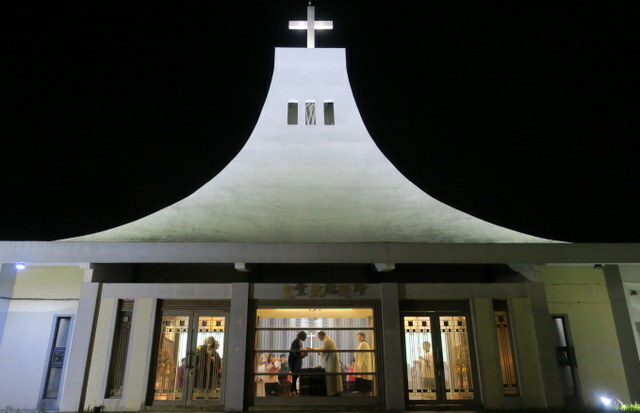 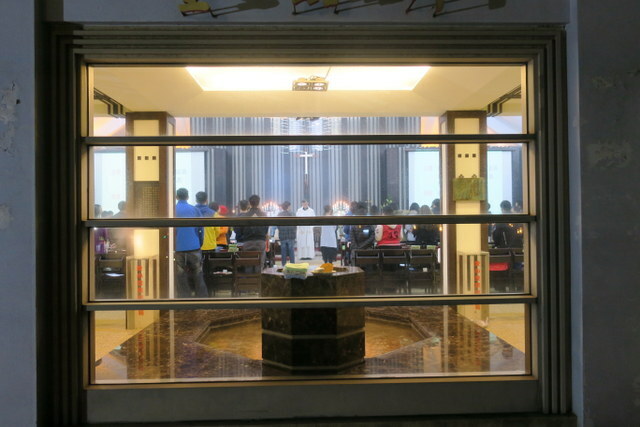 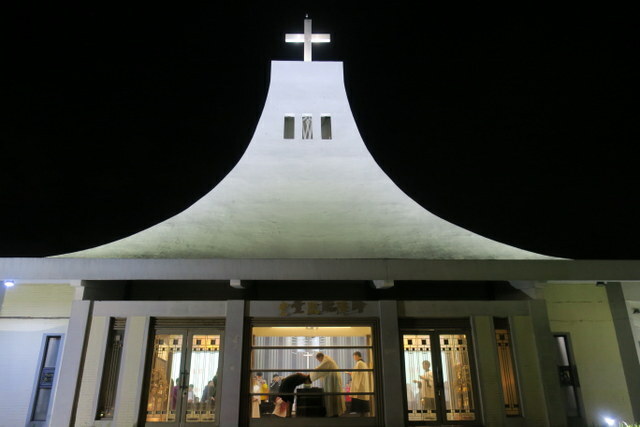 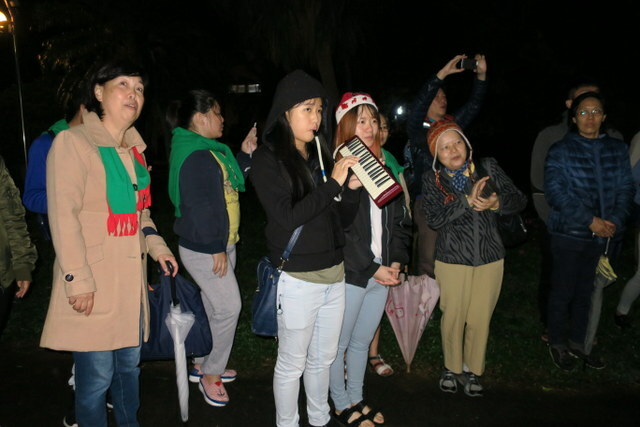 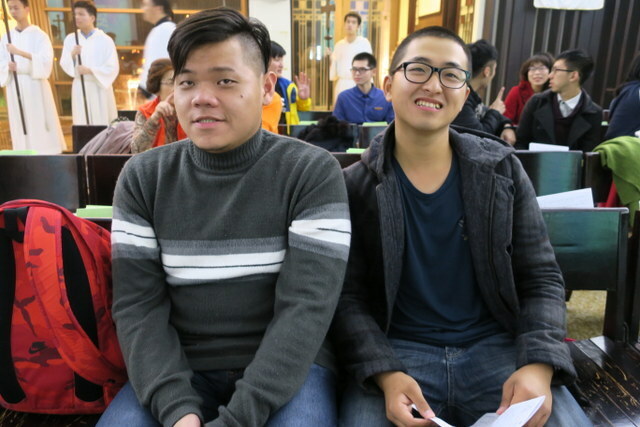 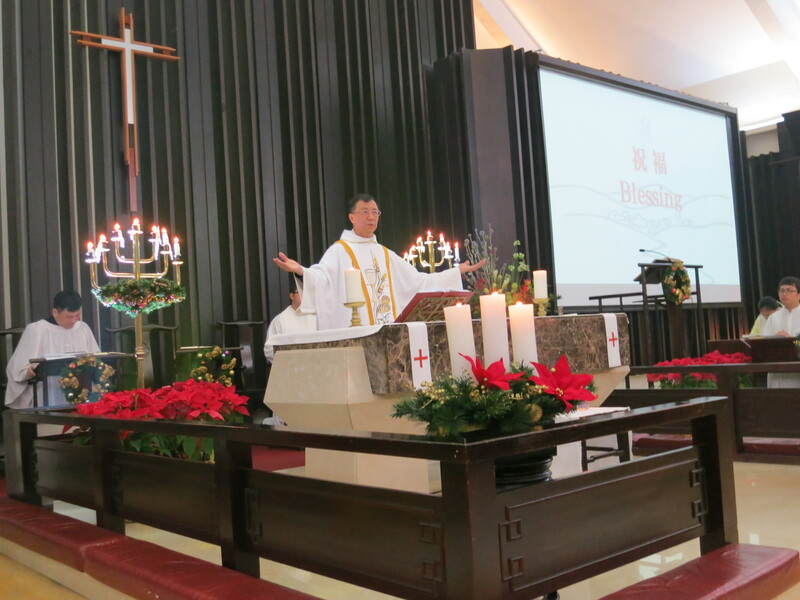 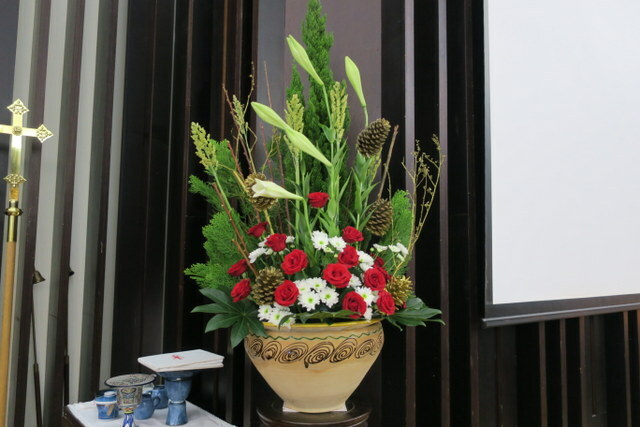 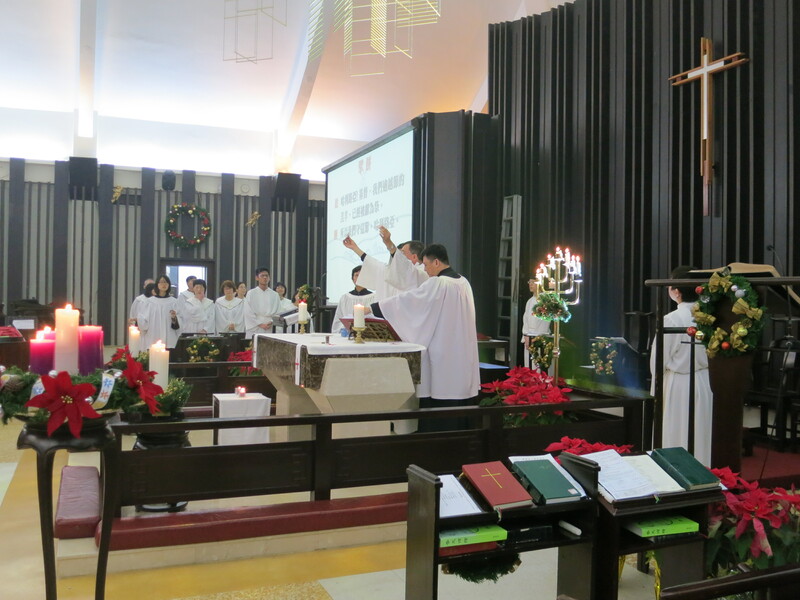 We thank God for all those in Taiwan who’ve heard the good news of Christmas in the last few weeks. 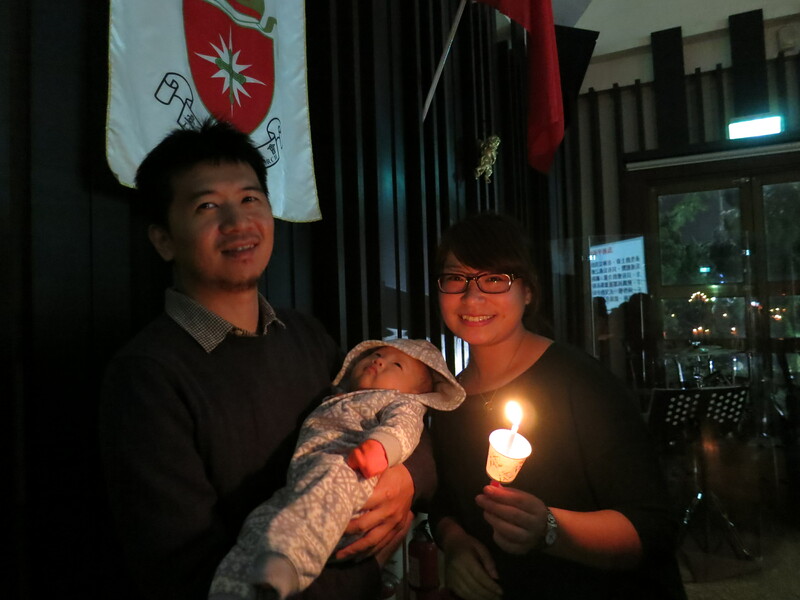 We uphold in prayer those who want to respond, but opposition from their families makes it difficult for them to do so ~ may the light of Christ shine in their lives and be a witness in their homes and families this Christmas! 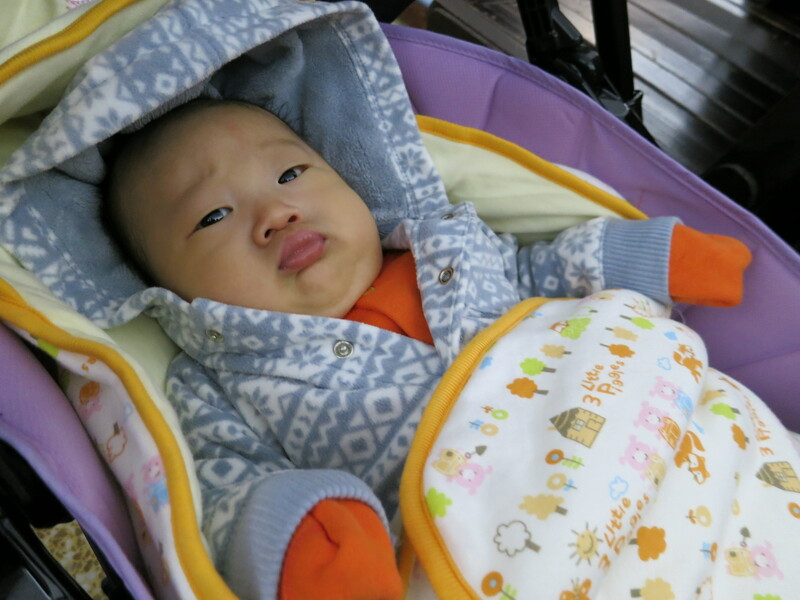 Been away in the UK for 7 months and so much has happened in my absence. 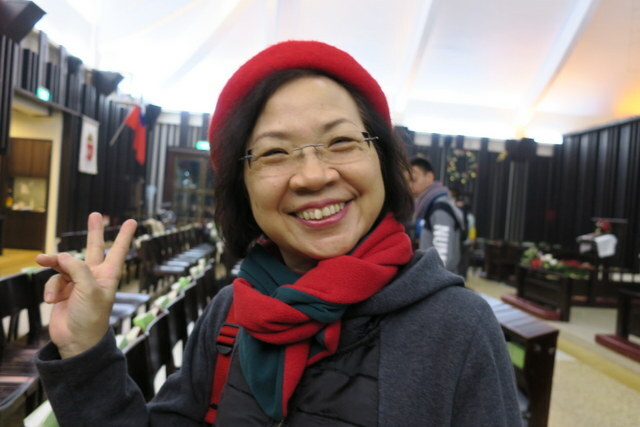 Out in the big bad world, as usual more has changed in 7 months in Taiwan than in the UK over the whole previous 3½ years that I’d been away ha ha! 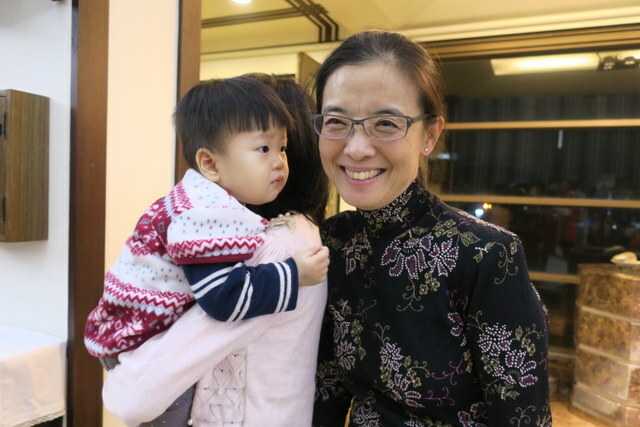 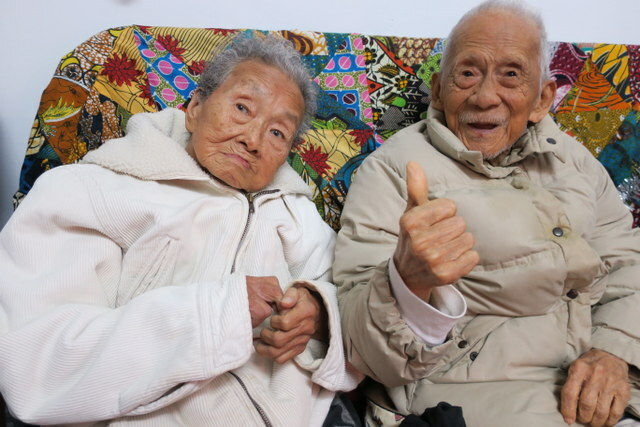 In Taiwan, new buildings, new businesses, new roads, new Metro Stations, new everything keeps appearing – but in the case of people, some have left and can never be replaced! 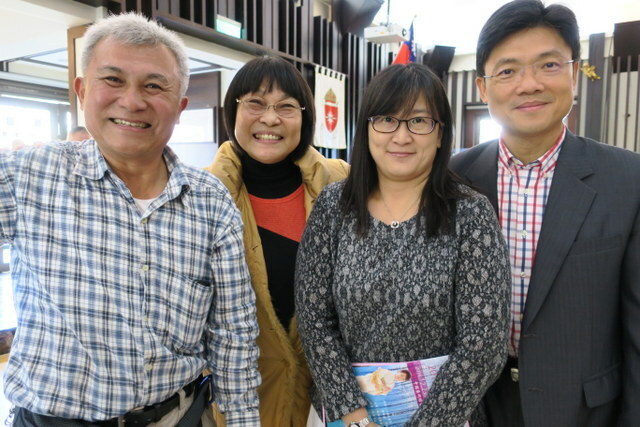 Quite a few staff here at St. John’s University retired while I was away, including Mrs. Chao from our chaplaincy office – after 43 years! 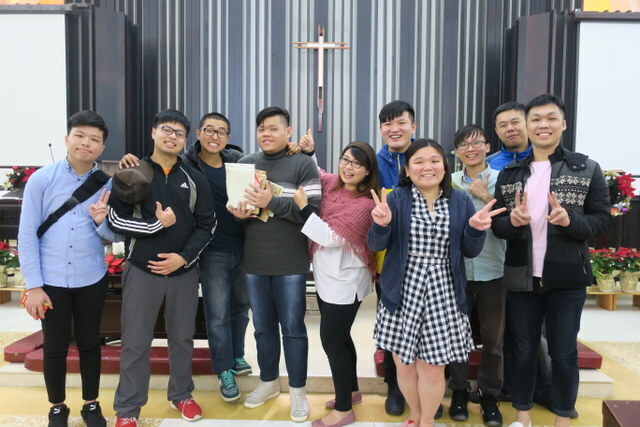 Yesterday she came back to visit us – and was warmly welcomed ~ the students sang ‘Sing Hosanna’ and presented a farewell card, and of course we all posed for a photo! 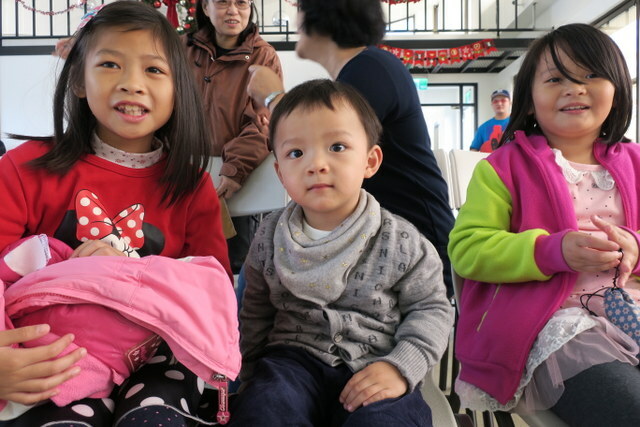 Ah, some you lose and some you gain ~ and these 2 beautiful babies are 2 of the 3 babies born recently to our church members at Advent Church, these 2 were born only 3 weeks apart, one boy, one girl. 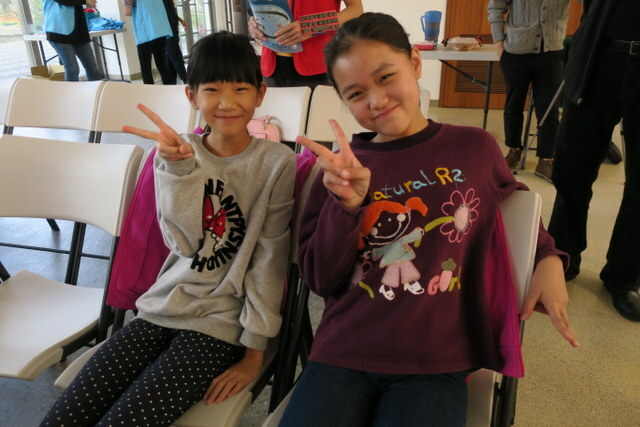 They were both in church last Sunday and posed very nicely for me! 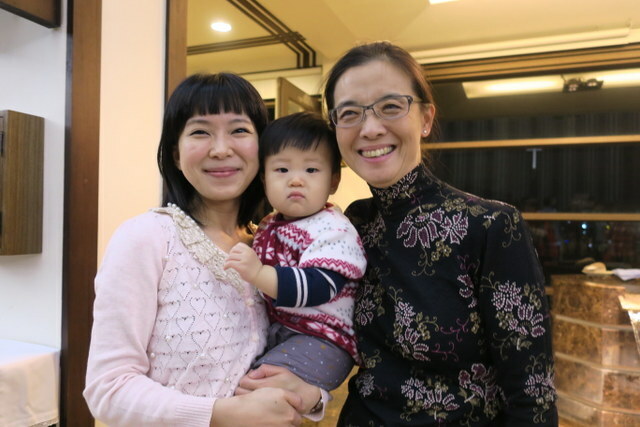 Both have similar names, one is 恩嘉 ‘En-jia’, and the other 恩音 ‘En-yin’, and the 恩’En’ character they have in common means ‘grace’. 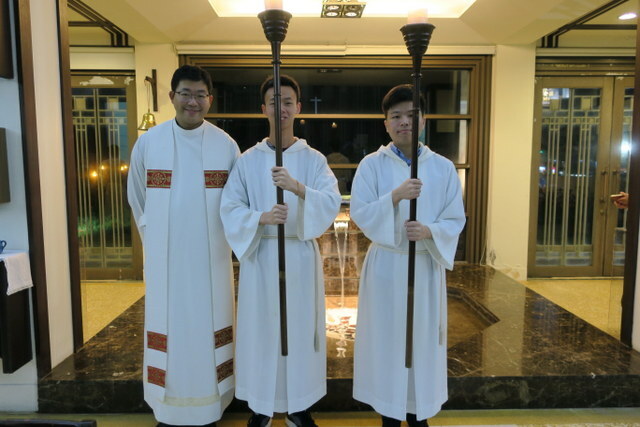 One of them is our rector’s first grandchild, and all 3 are preparing to be baptized this coming Sunday at Advent Church ~ Pentecost is coming! 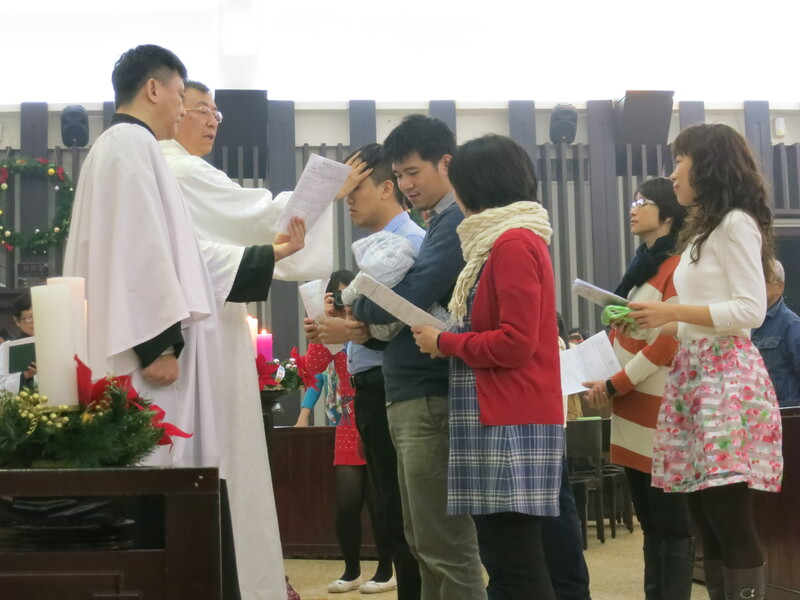 Please pray for them, their parents and the baptism celebrations this Pentecost Sunday!